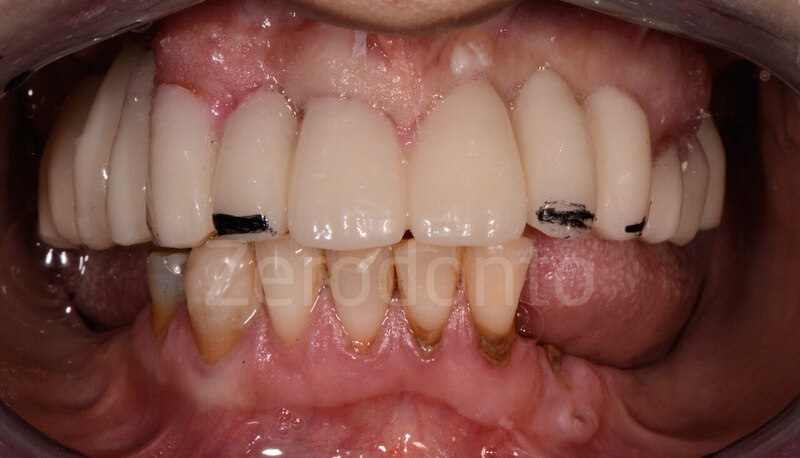 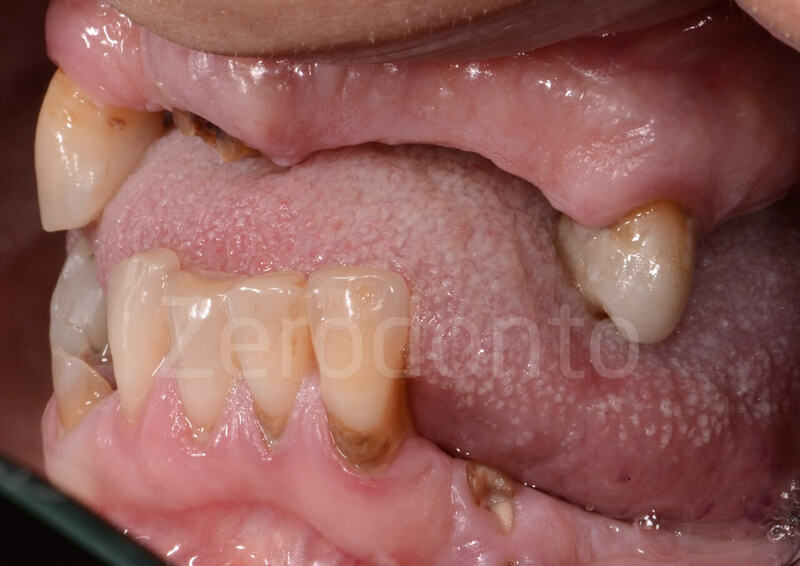 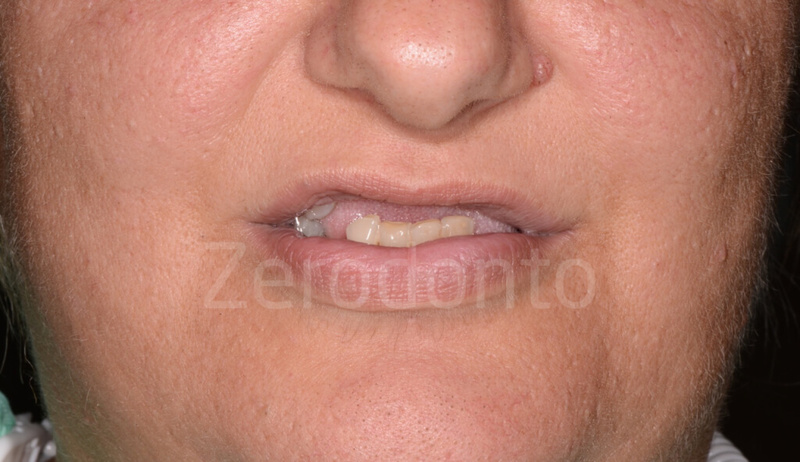 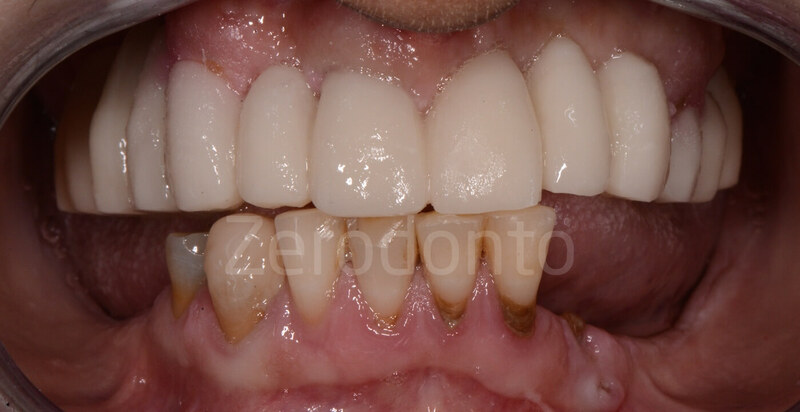 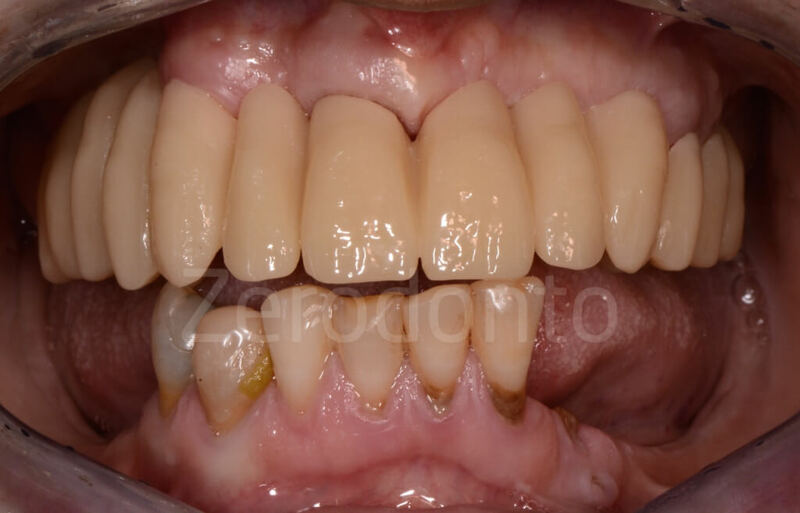 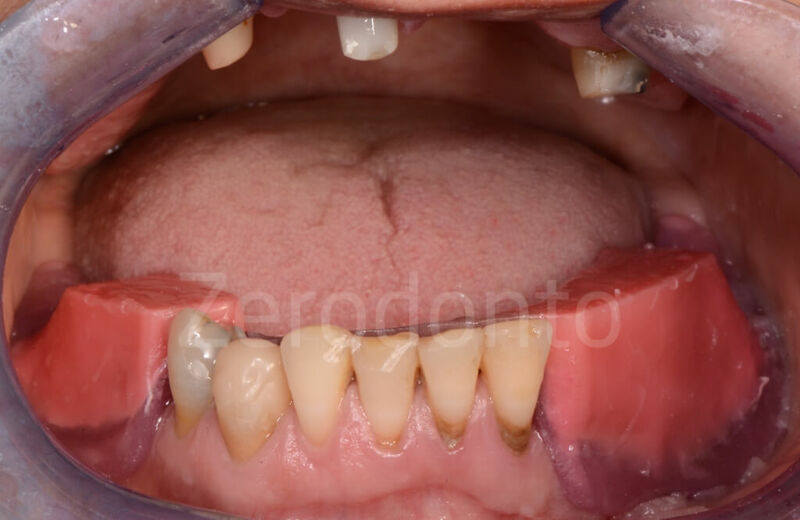 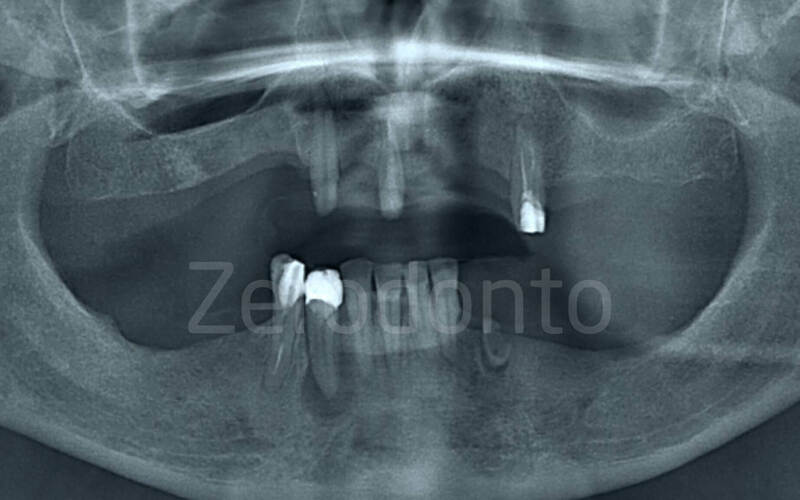 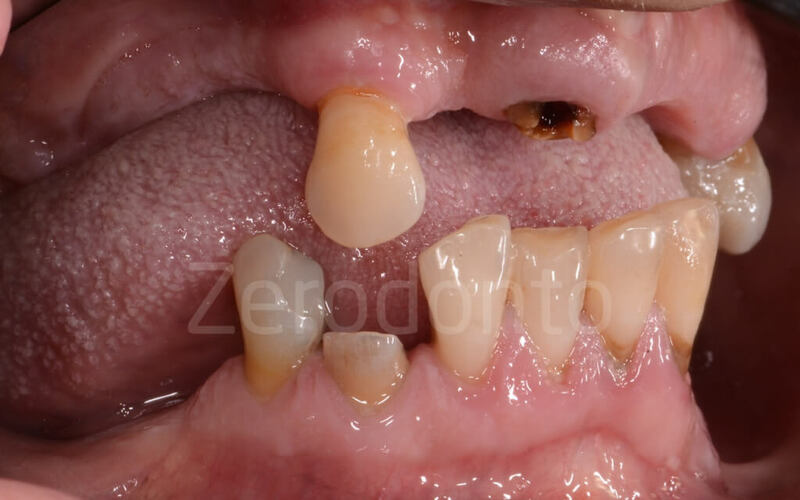 A 41 year-old female patient presented with multiple missing teeth at both dental arches and a few remaining elements, among which fractured and non vital teeth. 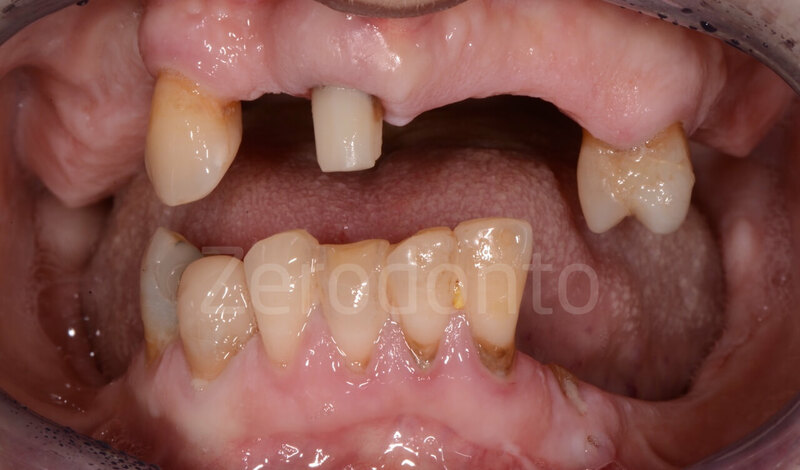 Moreover, the patient, in good general health but with poor oral hygiene, presented with reduced vertical dimension of occlusion (VDO), insufficient labial support and prosthetic space limited by macroglossia. 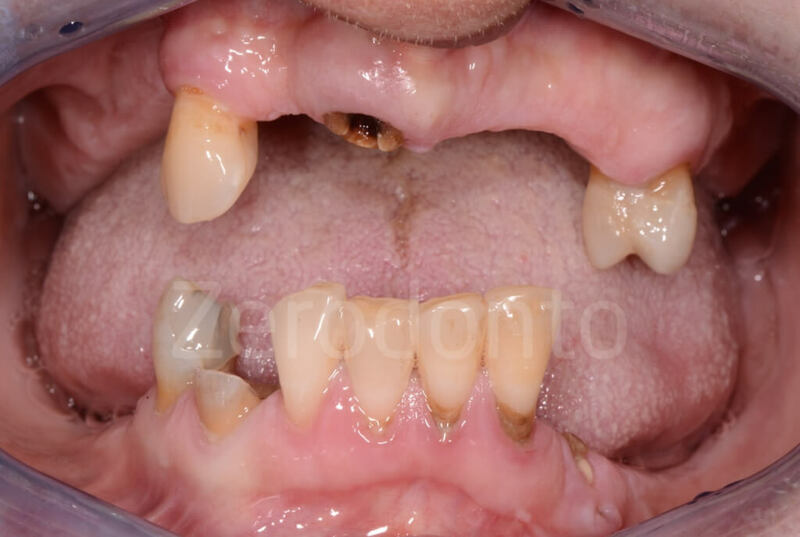 The patient lamented severe functional problems, related both to mastication and speech, as well as serious esthetic concerns, since the maxillary teeth were not visible at all both at rest and during function. 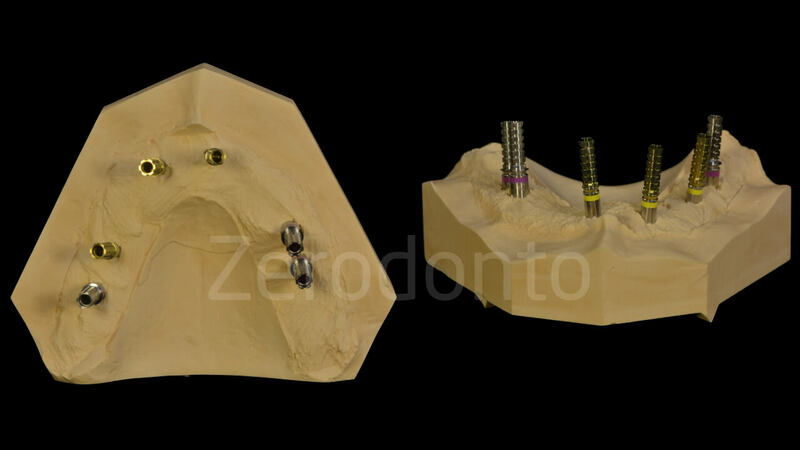 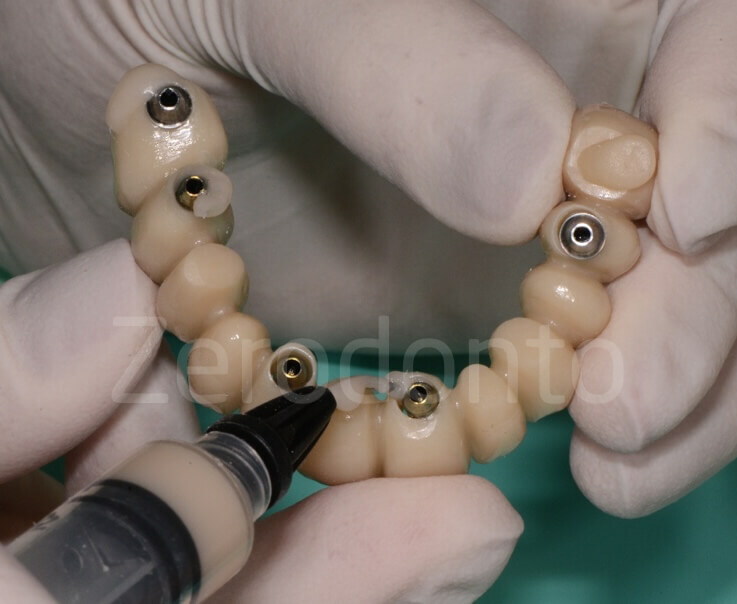 The patient asked for a fixed restoration; so, after a careful clinical and radiological study of the case, it was decided to perform computer-guided implant surgery and immediate loading by means of a screw-retained temporary prosthesis. 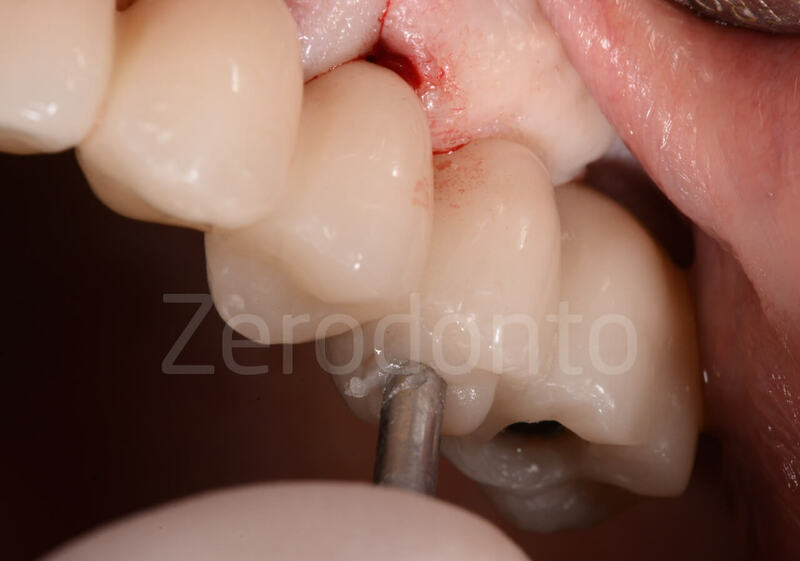 In order to provide the patient with a first diagnostic interim prosthesis, tooth 11 was endodontically treated and built-up by means of a fiber post. 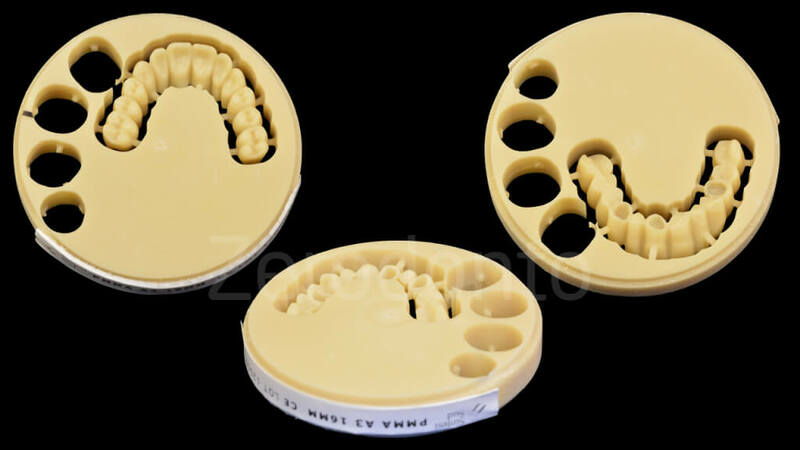 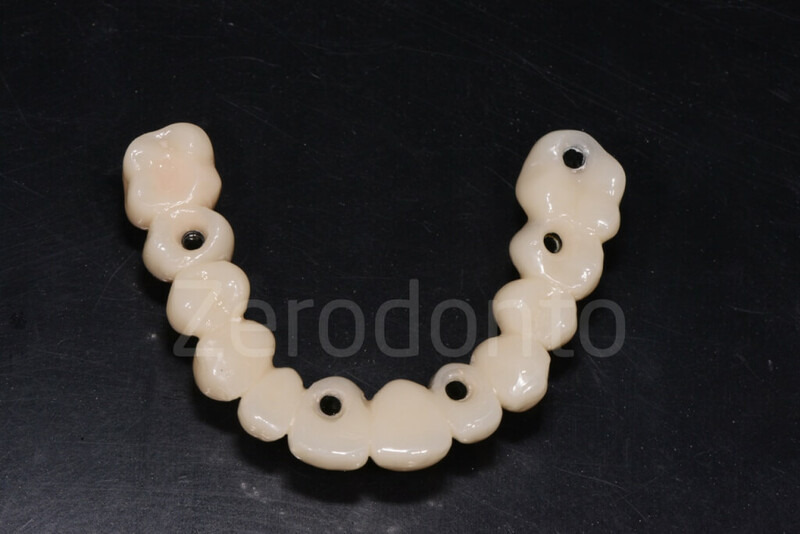 In the meanwhile, wax occlusal rims were fabricated in order to perform the conventional esthetic and phonetic try-in and establish the proper VDO. 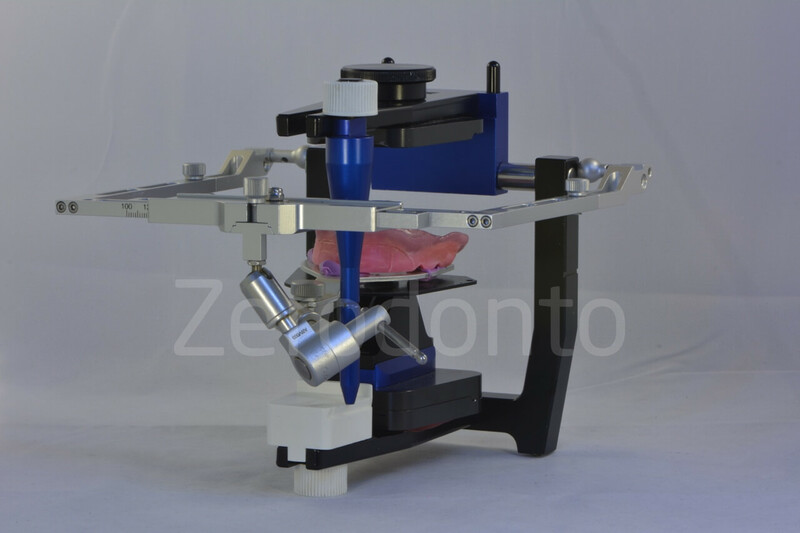 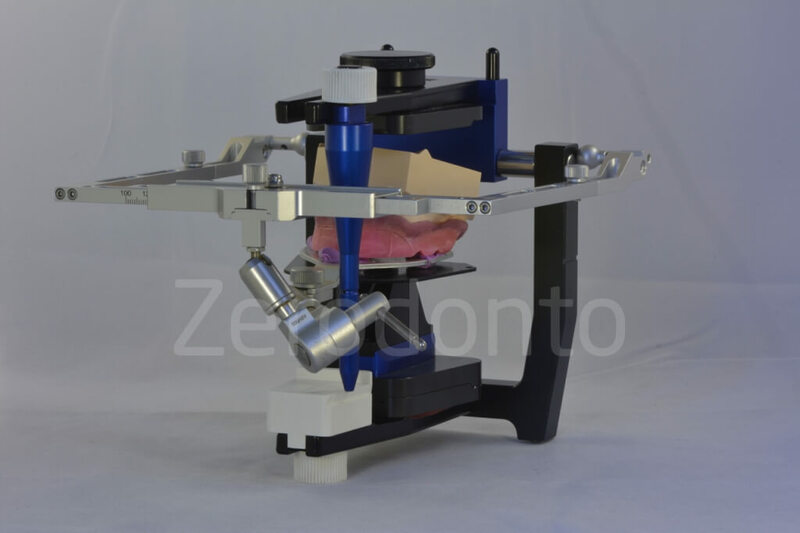 The occlusal rims were modeled according to the needs of the case and the orientation of the occlusal plane was controlled using the Fox’s plane. 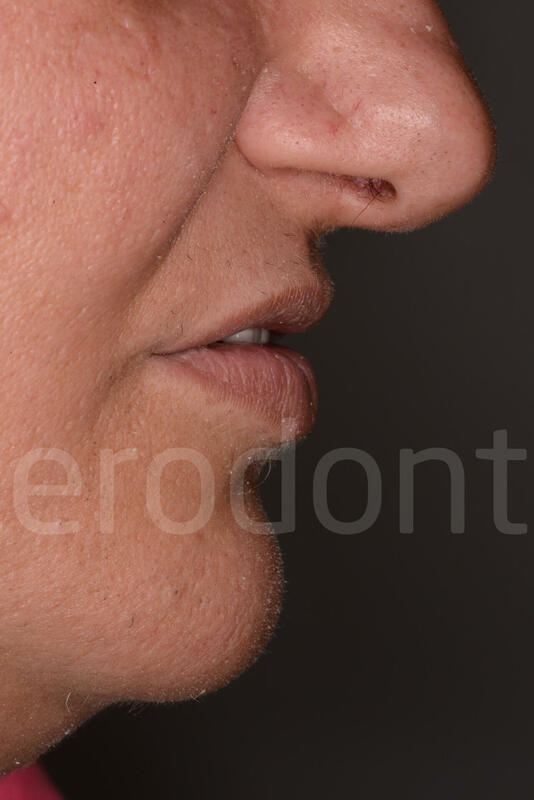 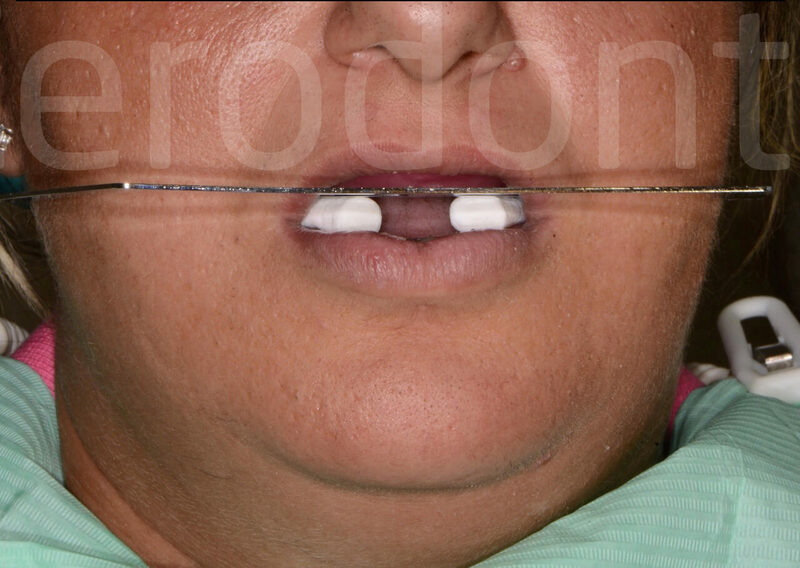 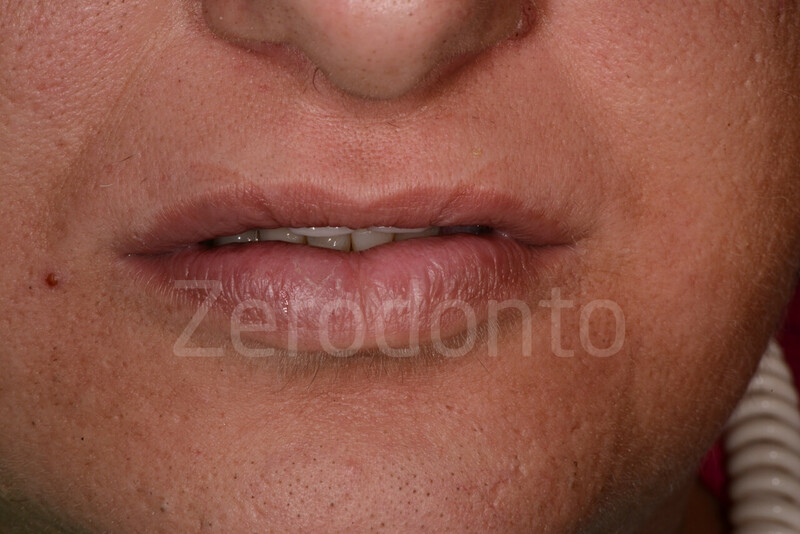 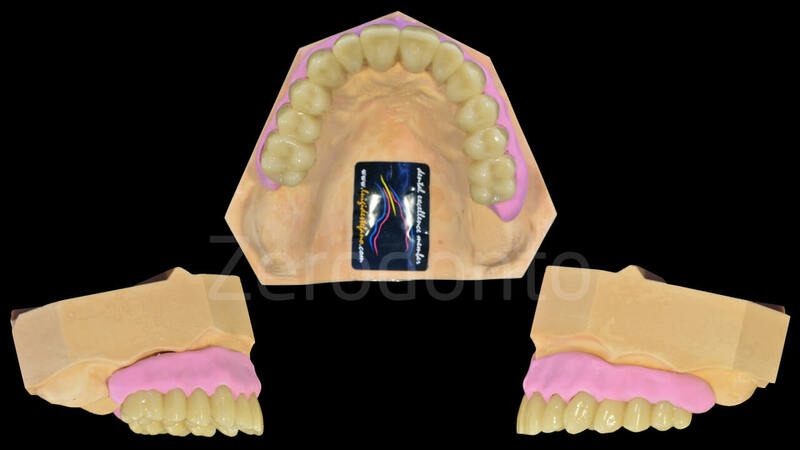 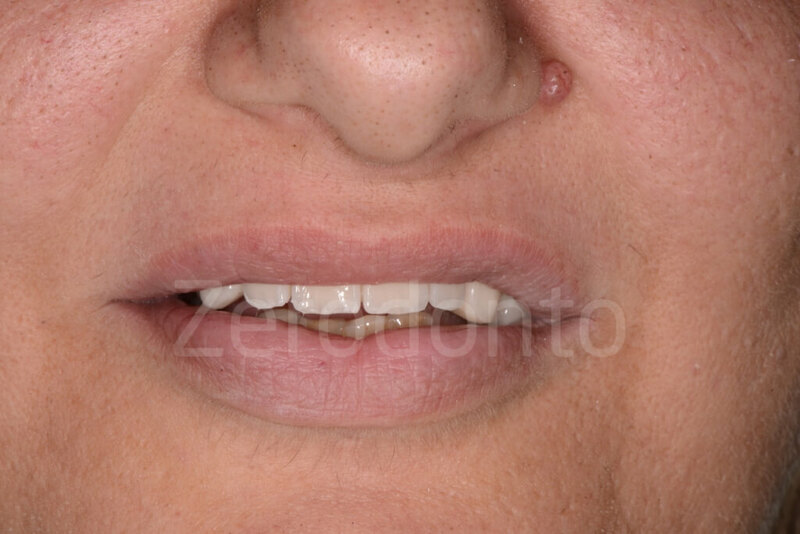 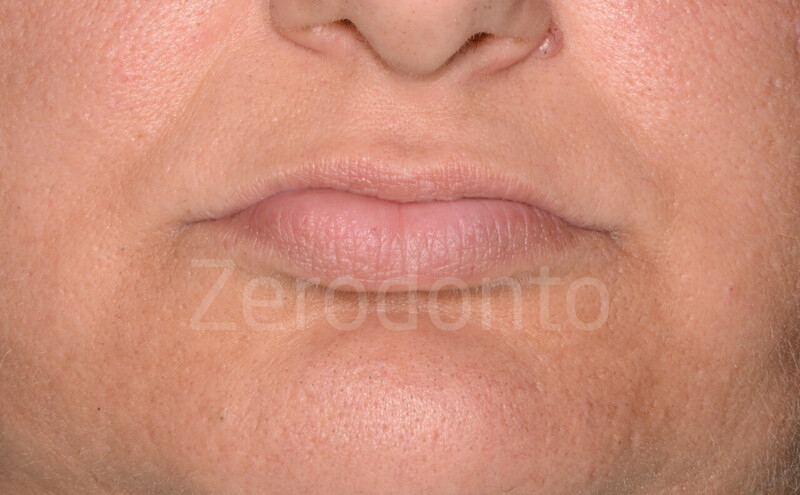 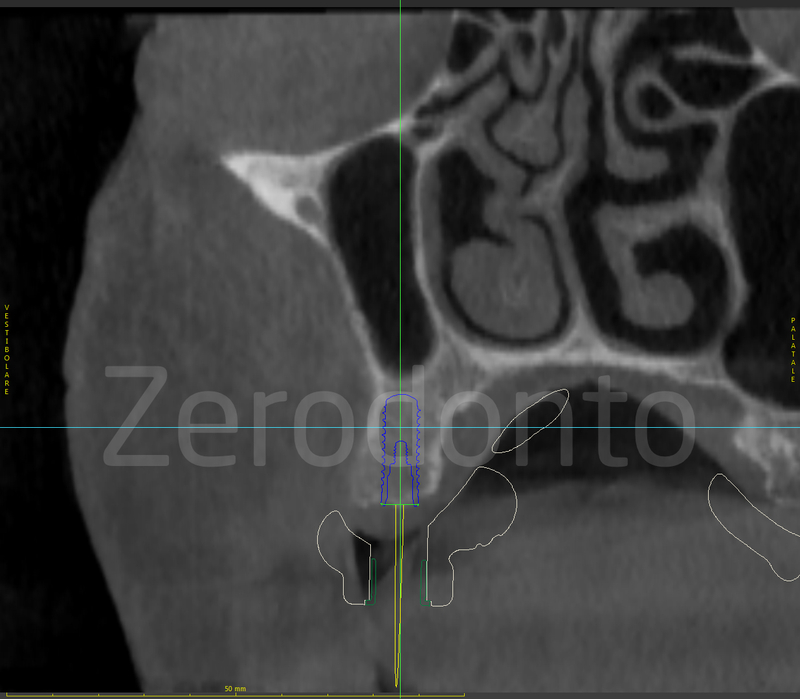 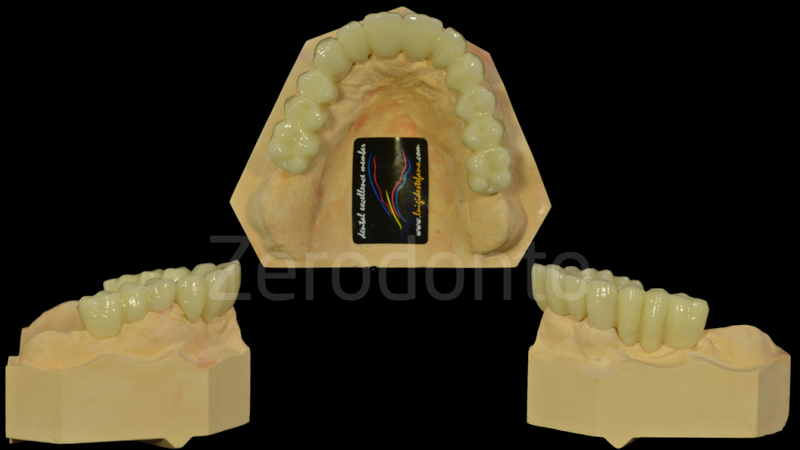 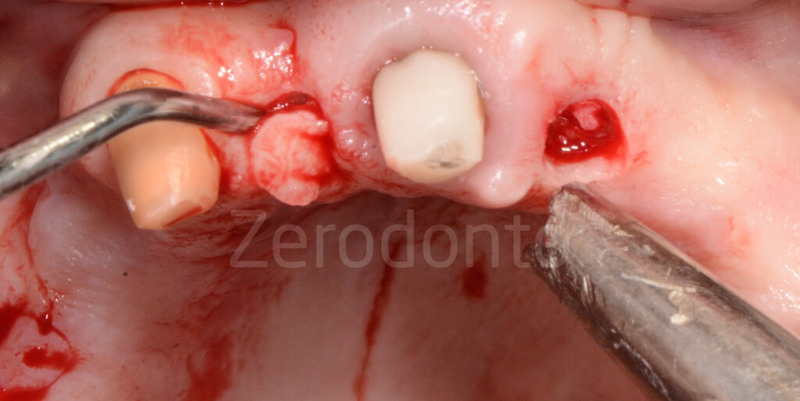 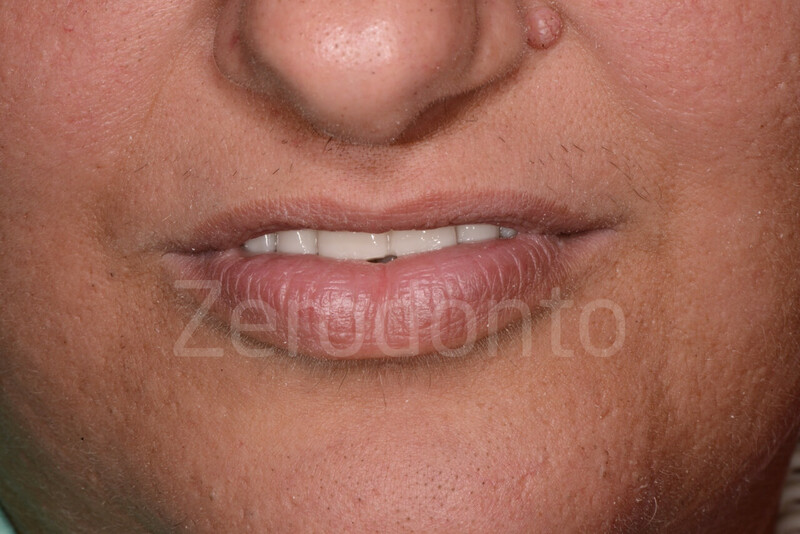 The median line and the display area were identified on the maxillary rim. 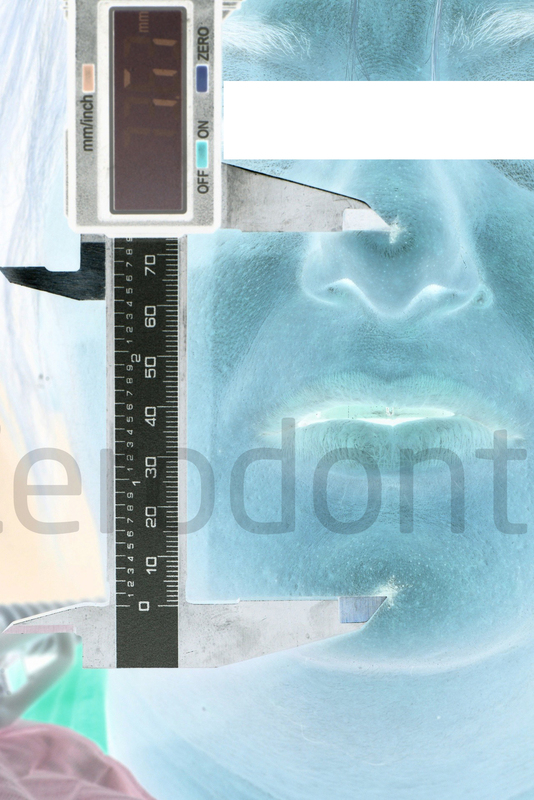 Once the VDO was established, it was recorder on the skin using reference points and a digital caliper. 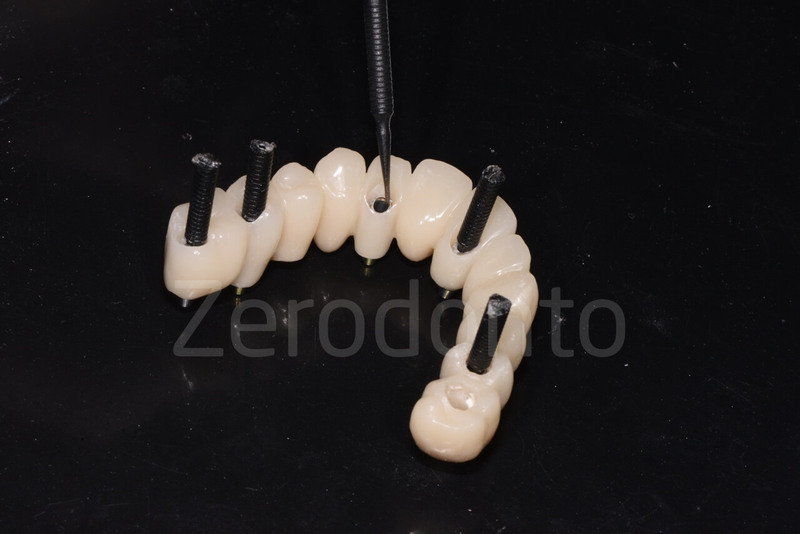 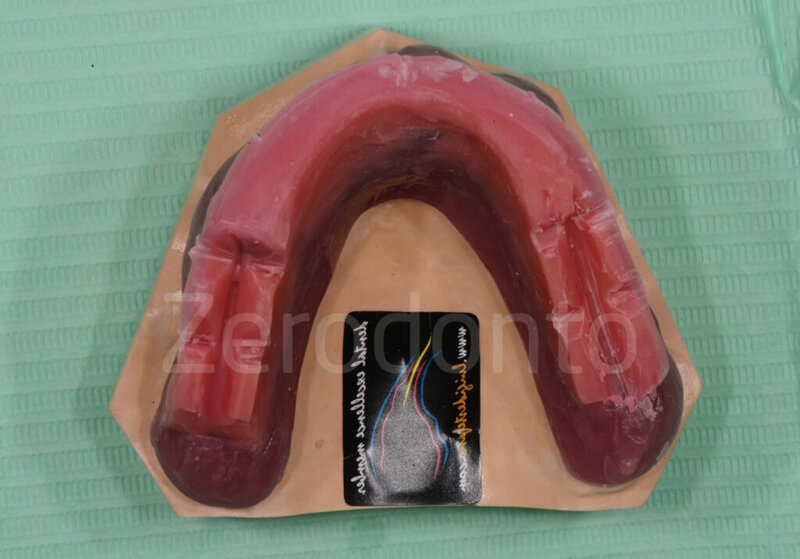 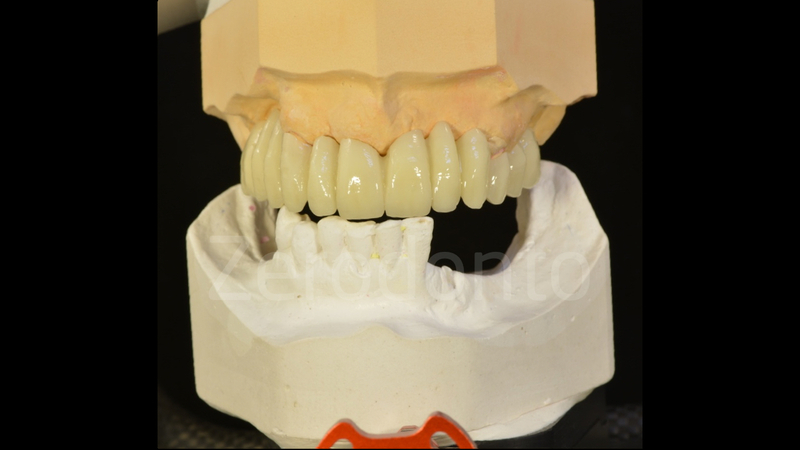 Then, a wax with a low deformation coefficient was used to record the intermaxillary relationships of the occlusal rims and a traditional analog facial bow was taken, checking the correct parallelism with the horizontal line. 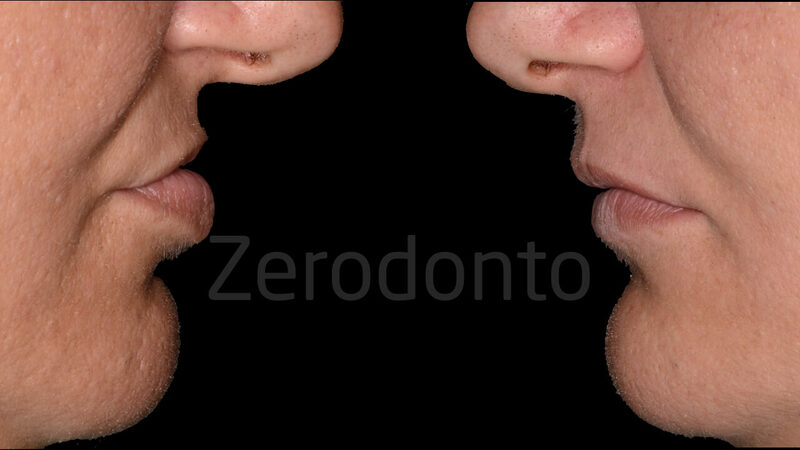 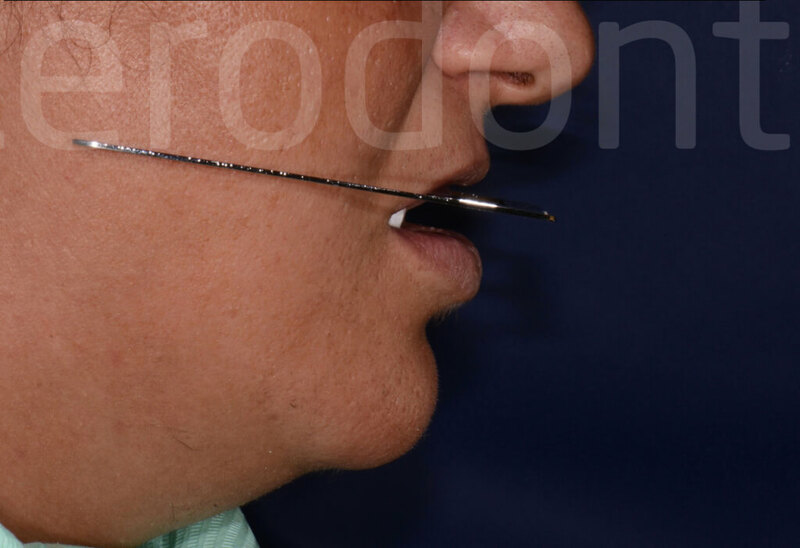 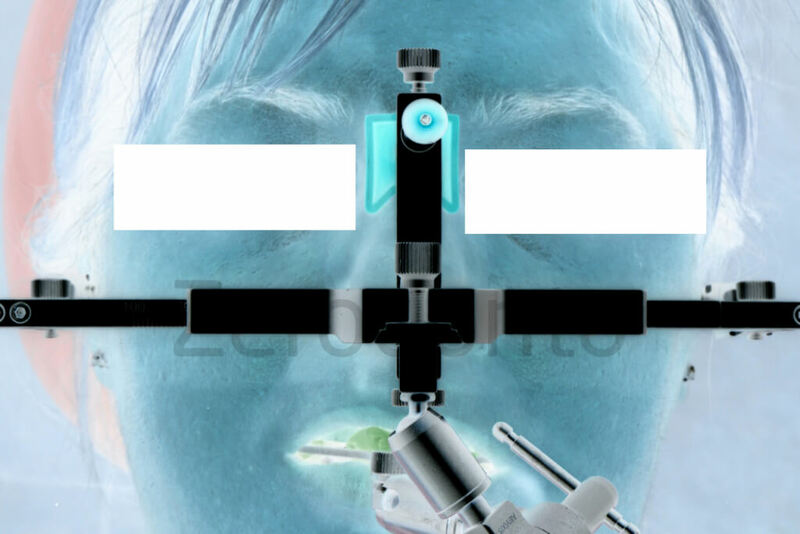 Intermaxillary relationship were recorded using a face bow. 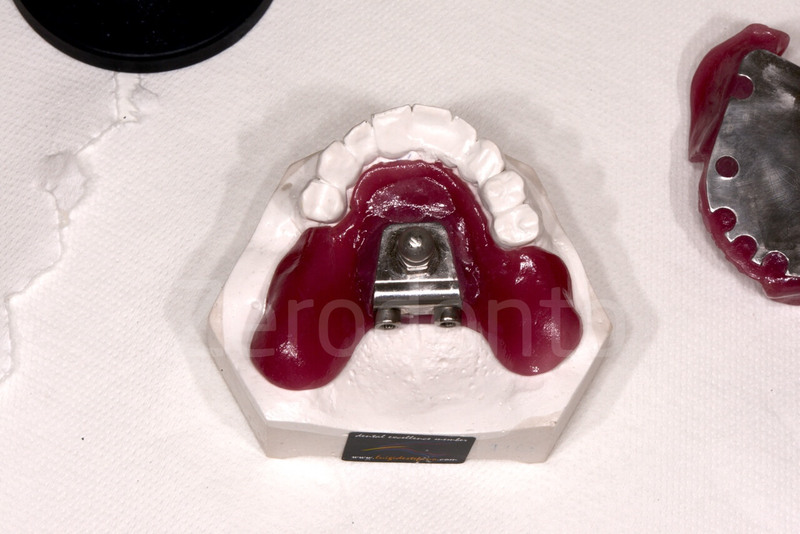 The mandibular movements were recorded according to the gothic arch technique, using customized resin-metal bases (Amann Girrbach Artex Articulators); this tool was set at the previously established VDO, checked by means of a digital caliper as reported above. 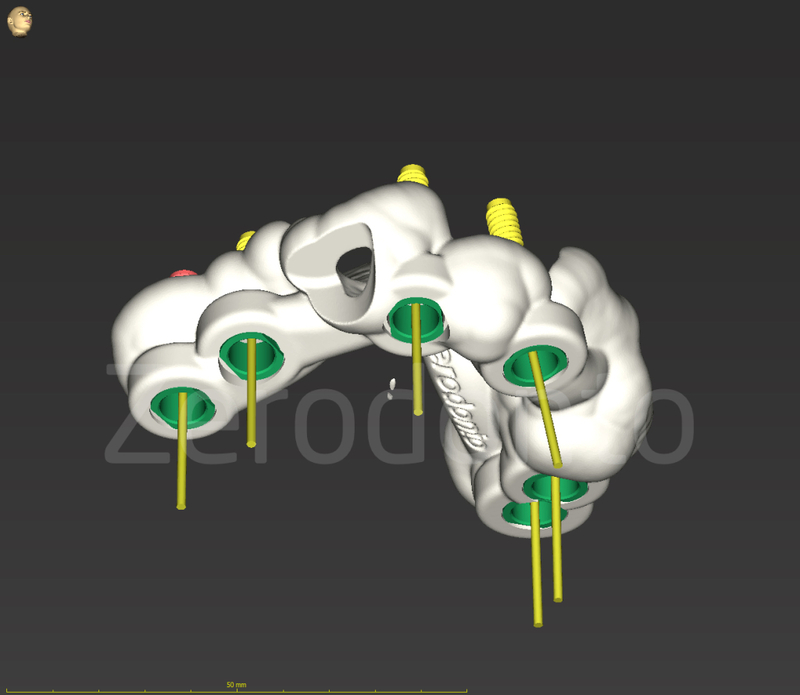 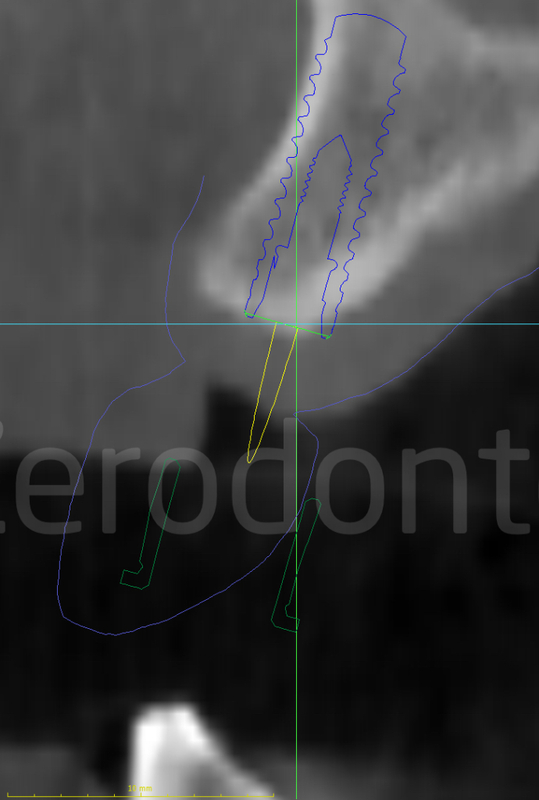 Then, in order to make a purely speculative comparison between the analog and digital workflows, the intermaxillary relationships and mandibular movements were recorded with a digital face bow as well (ARCUSdigma KaVo). 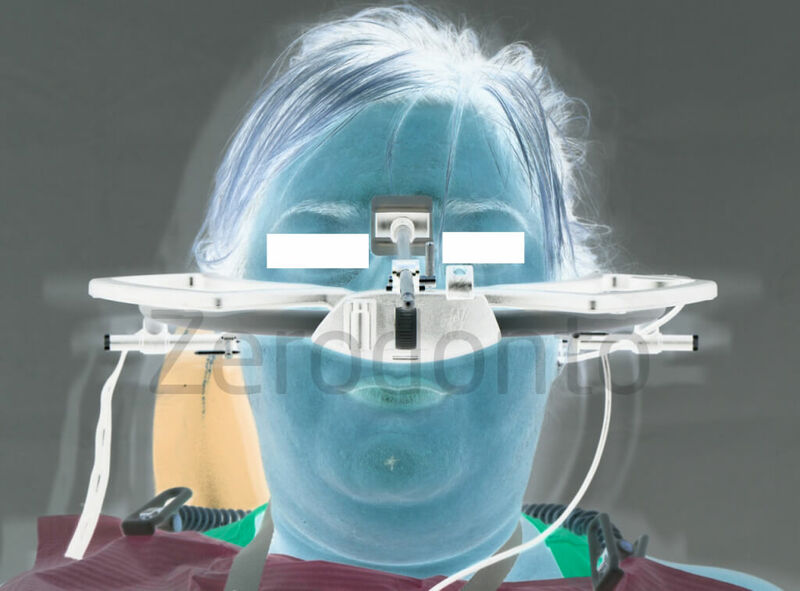 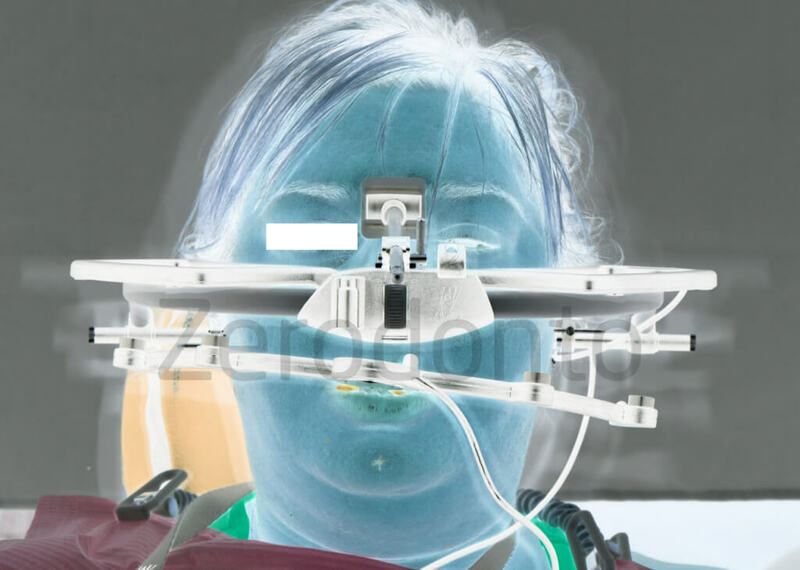 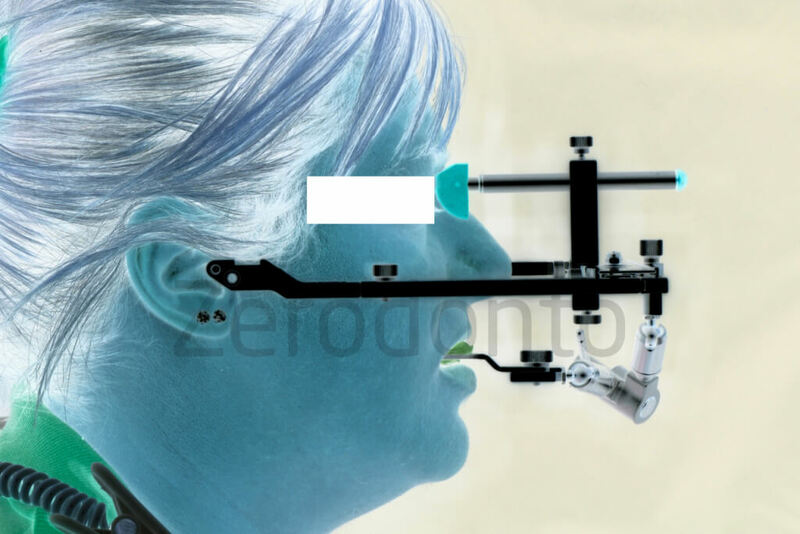 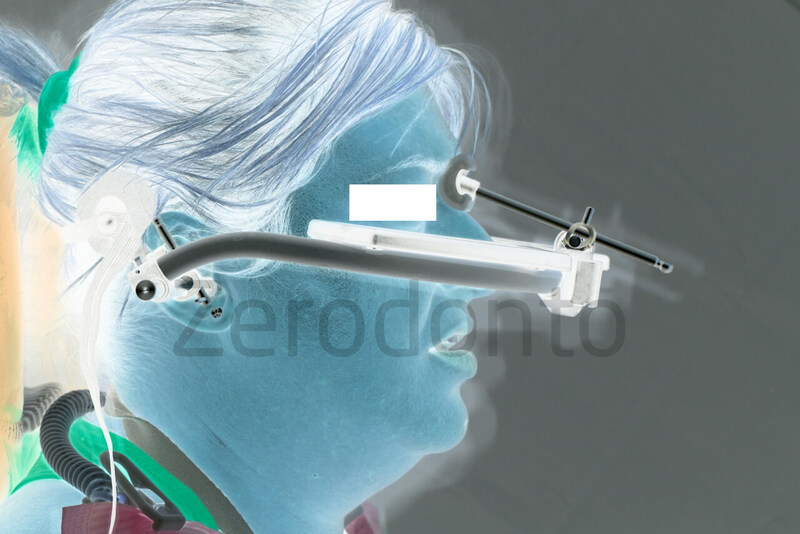 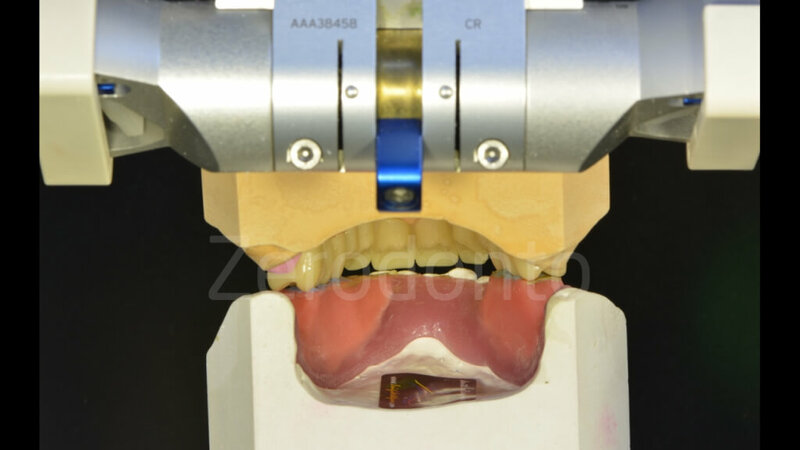 The models were mounted in a calibrated system including articulators and scanners (Scanner DW Series 3). 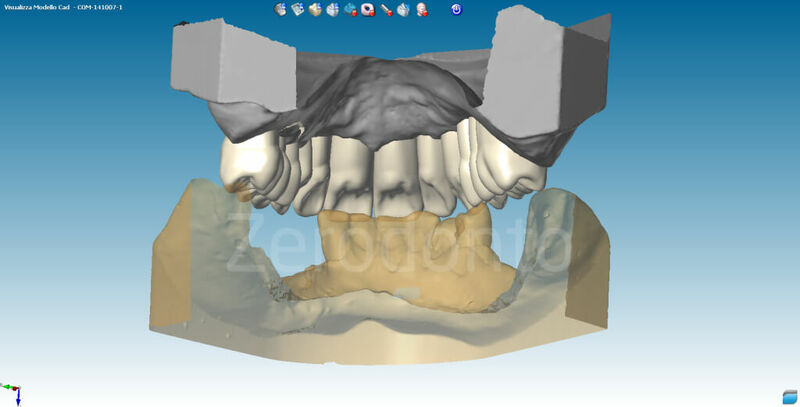 Consequently, it’s possible to replicate the same position, digitally. 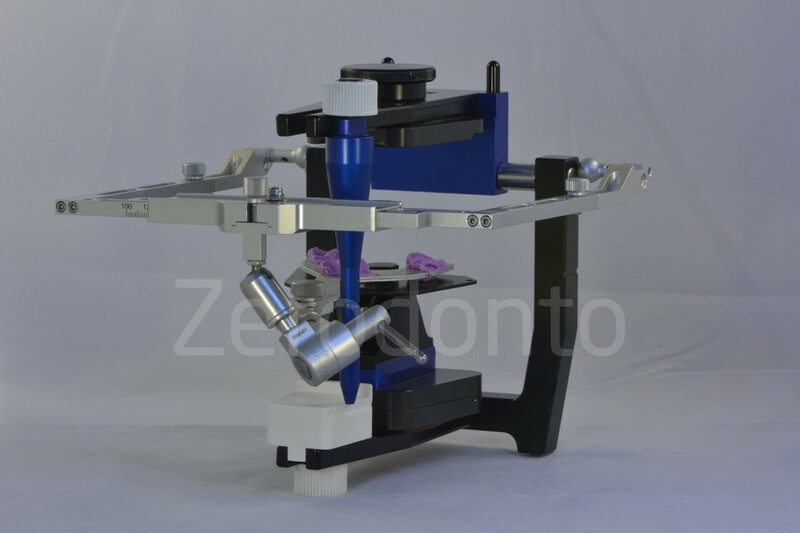 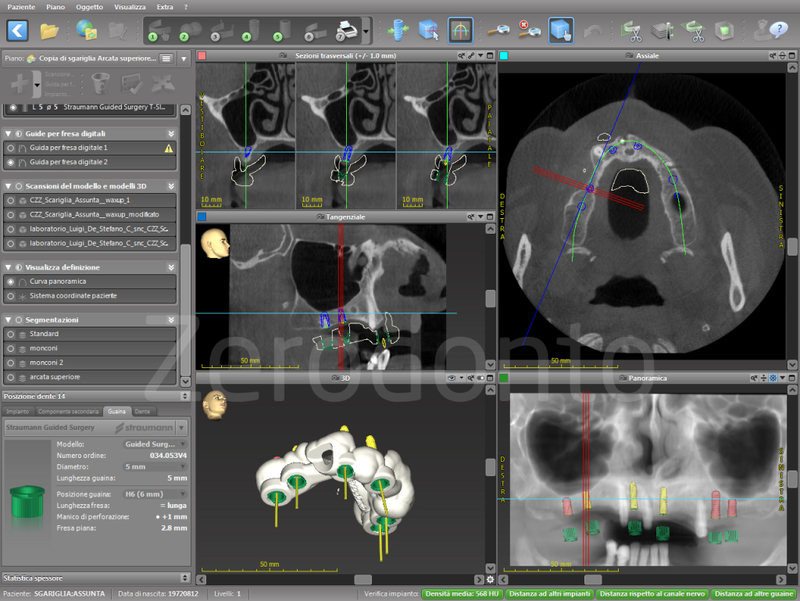 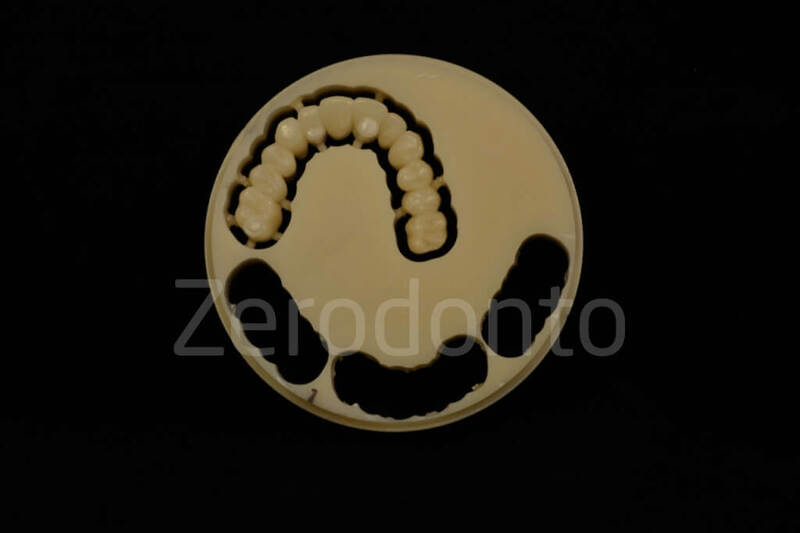 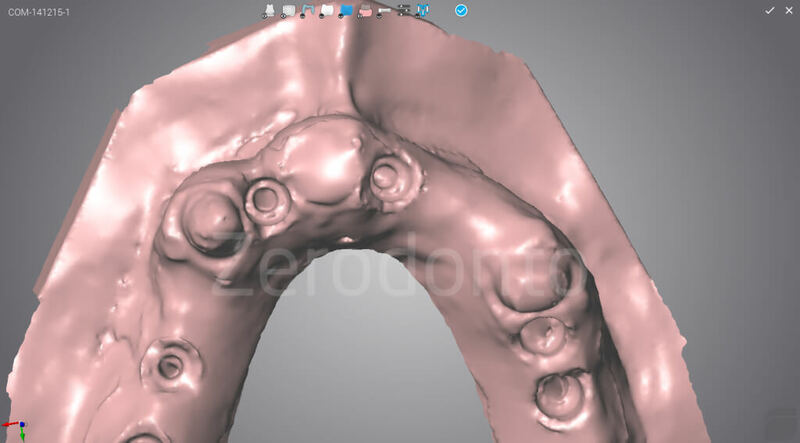 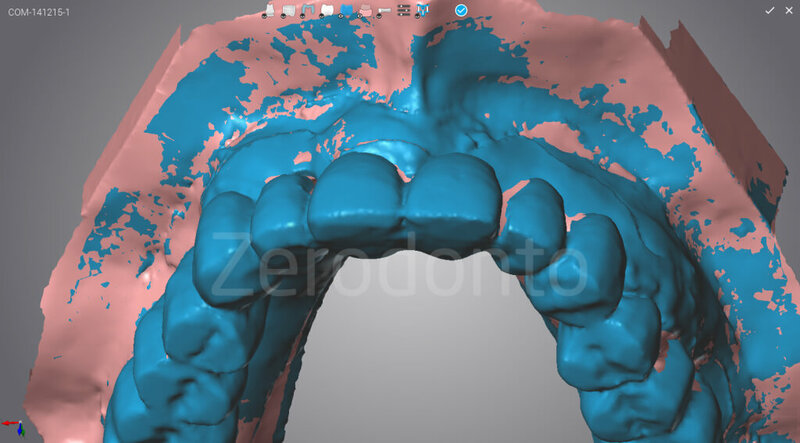 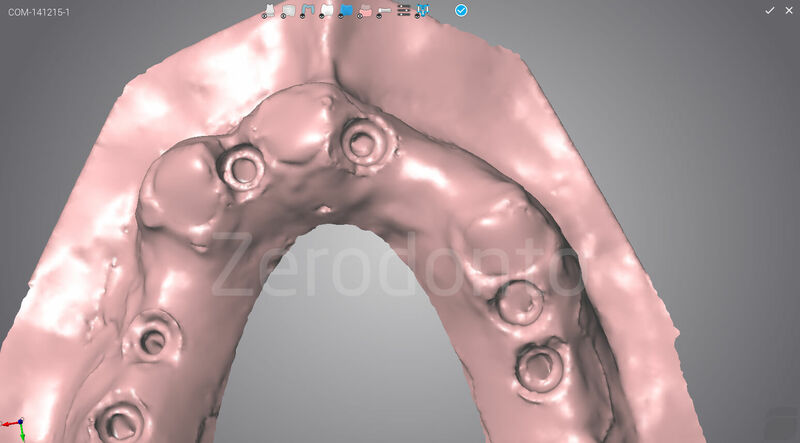 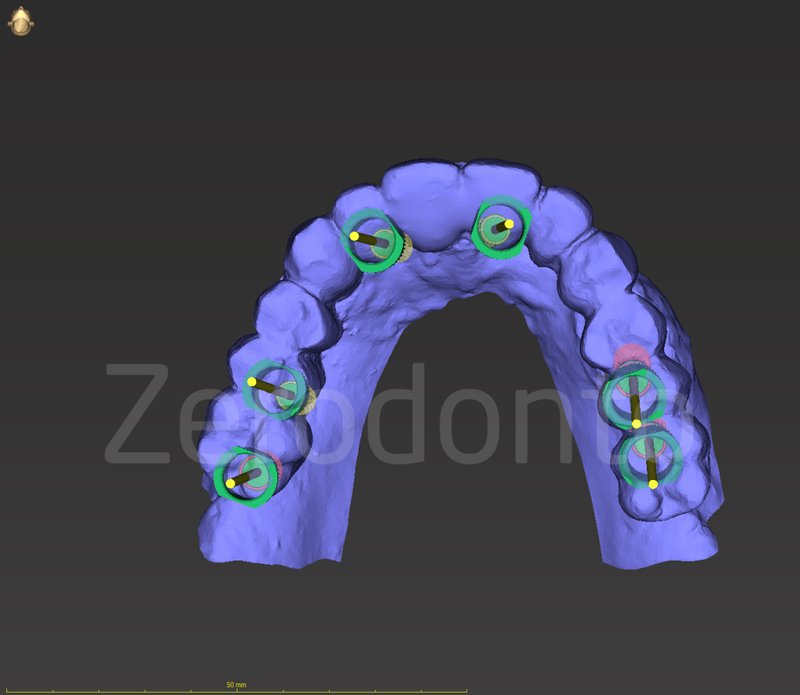 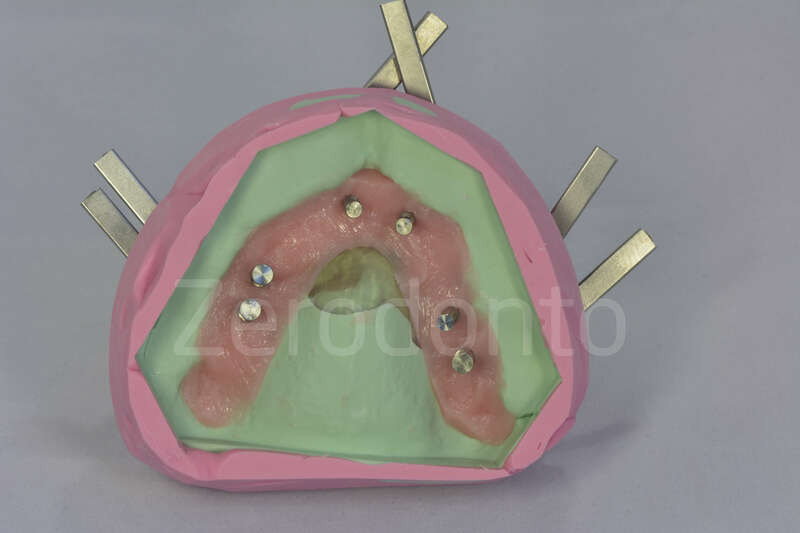 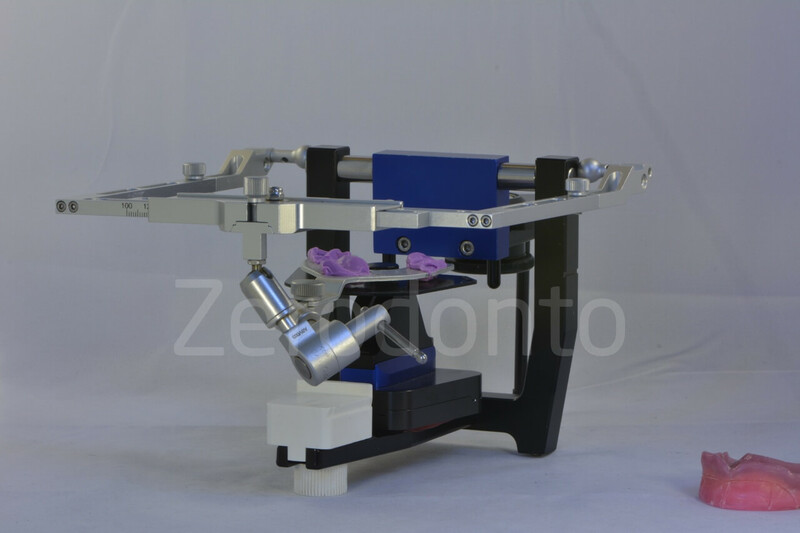 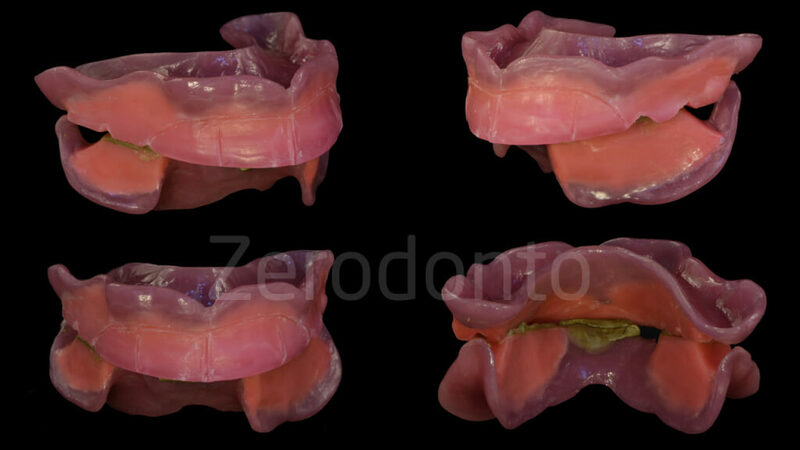 The master casts and the occlusal rims were imported in the software, so as to model the wax-up digitally on the basis of the recorded clinical parameters. 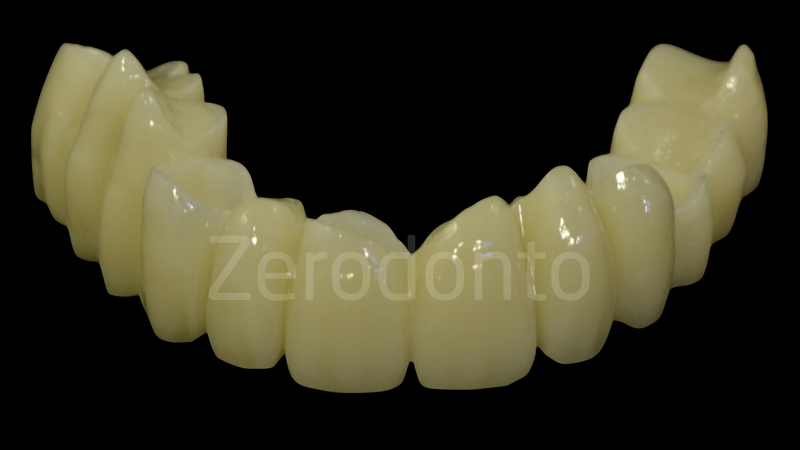 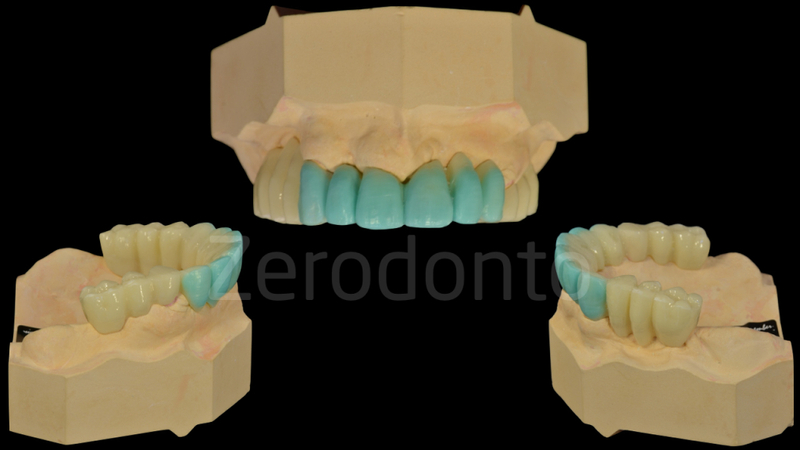 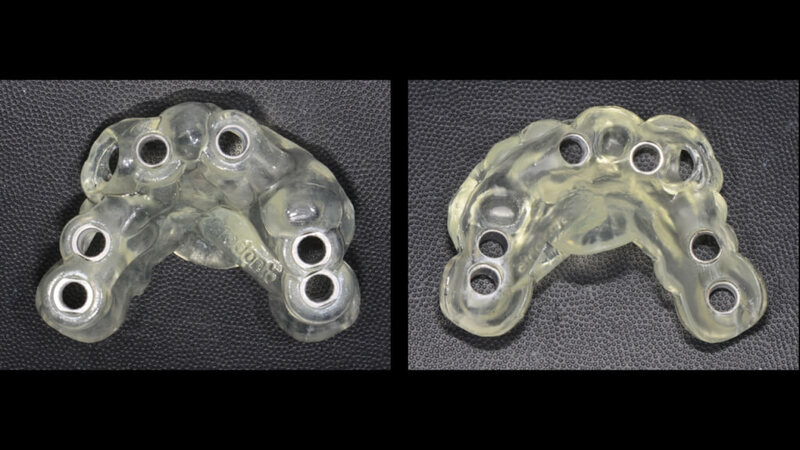 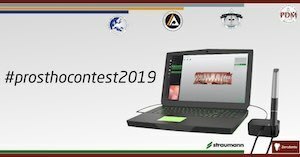 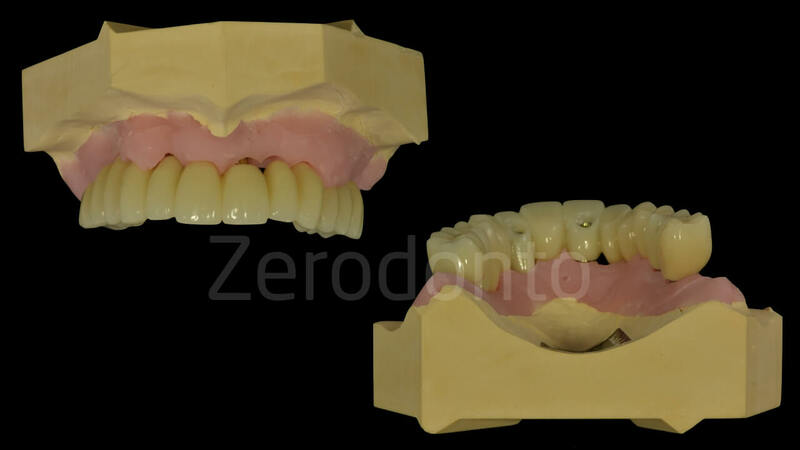 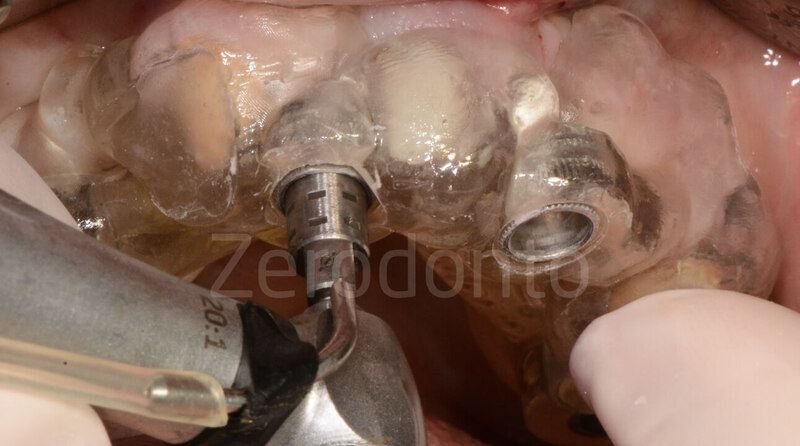 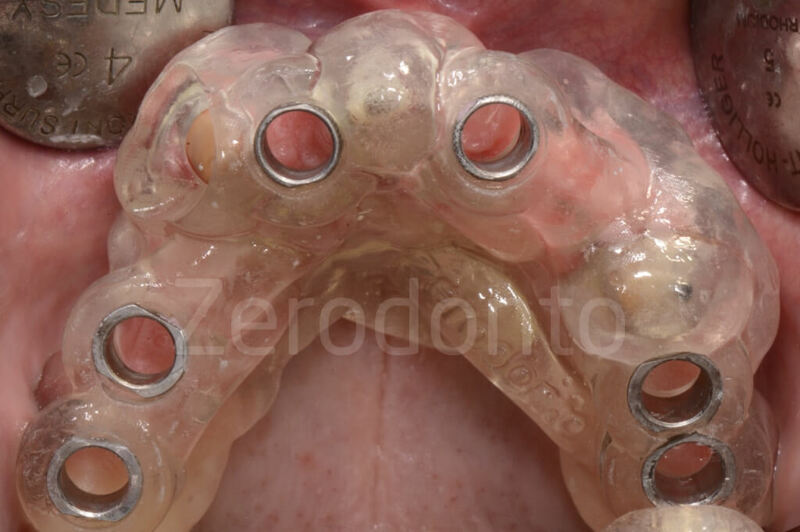 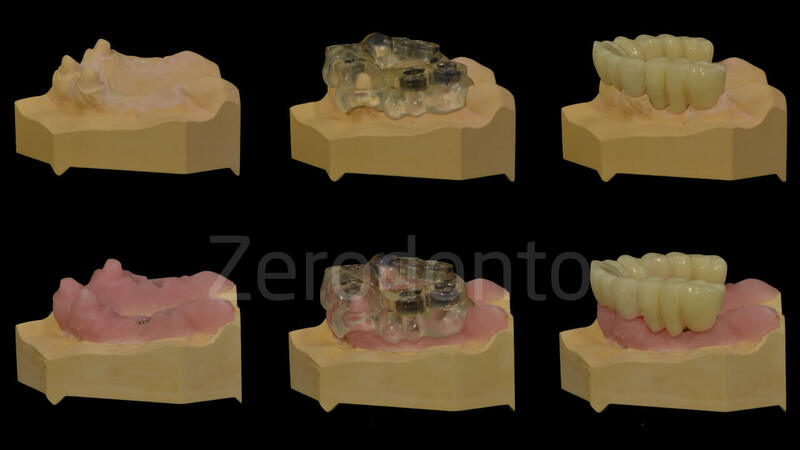 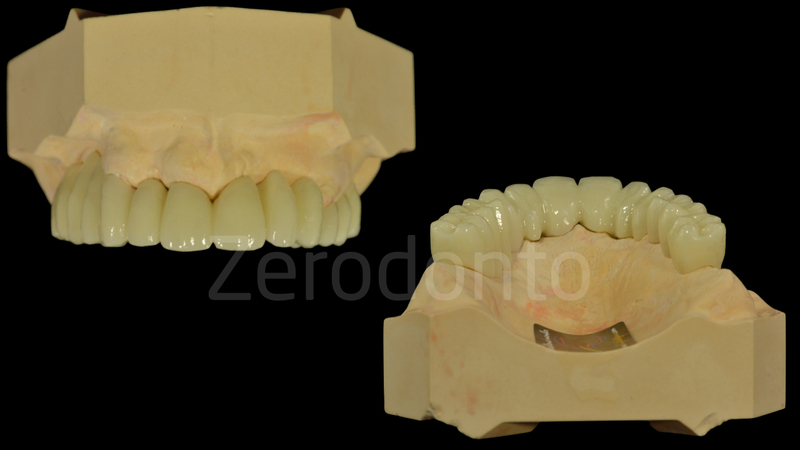 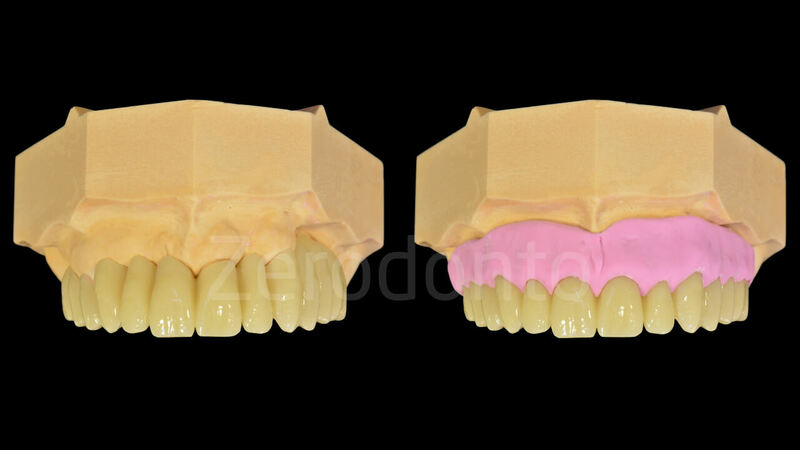 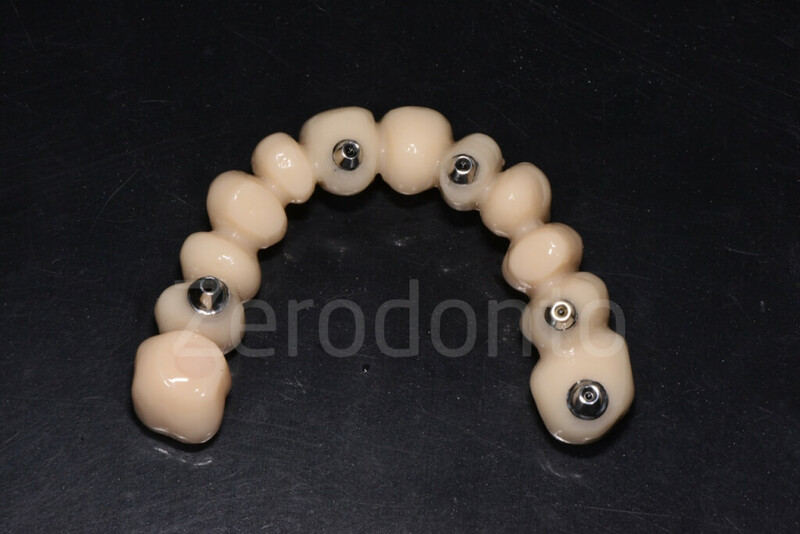 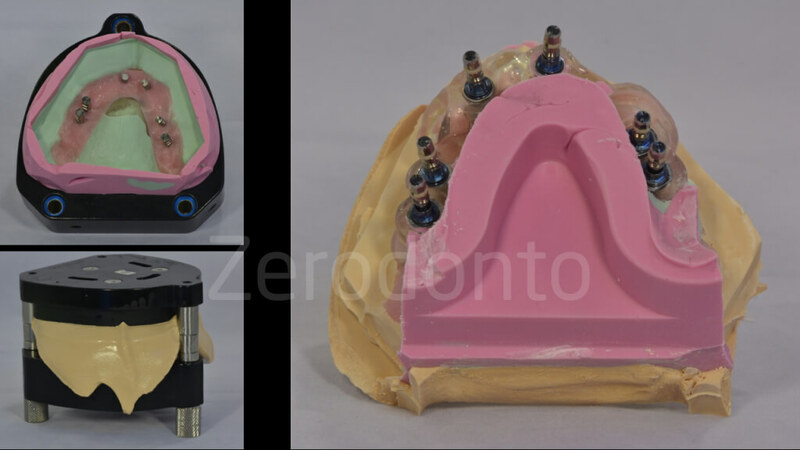 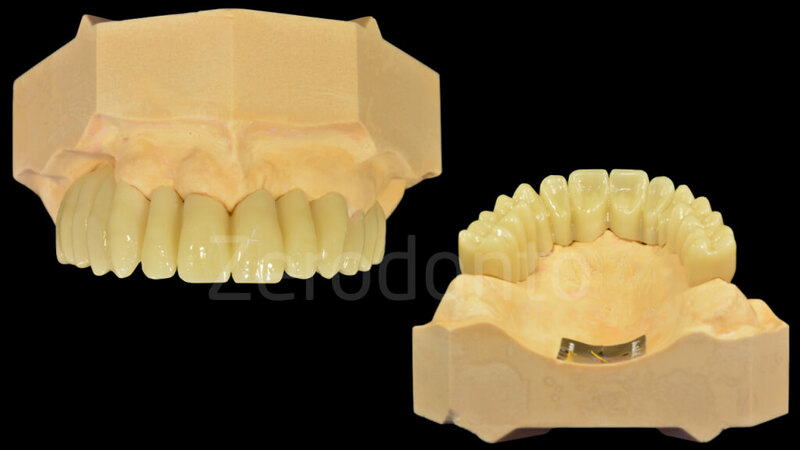 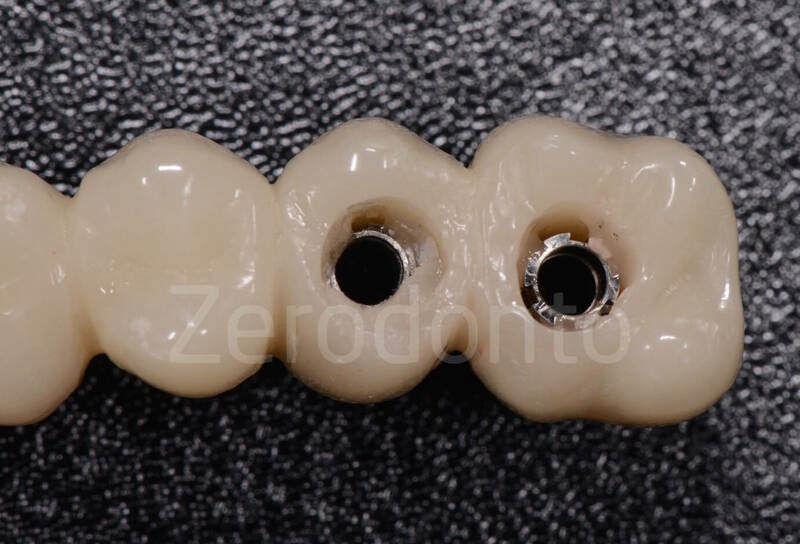 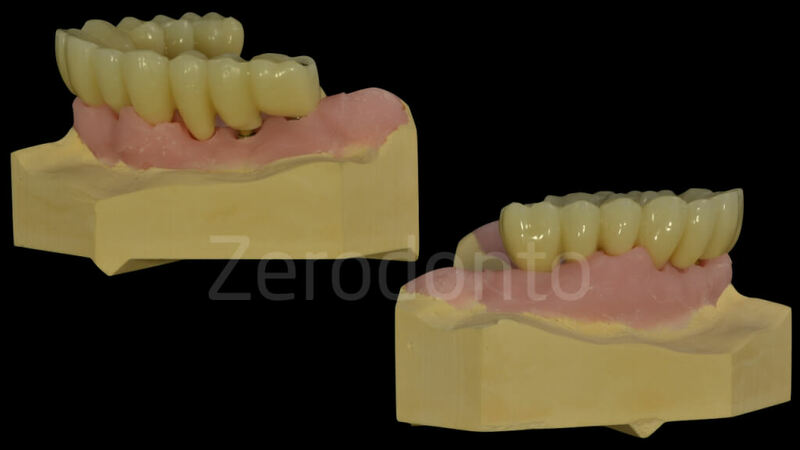 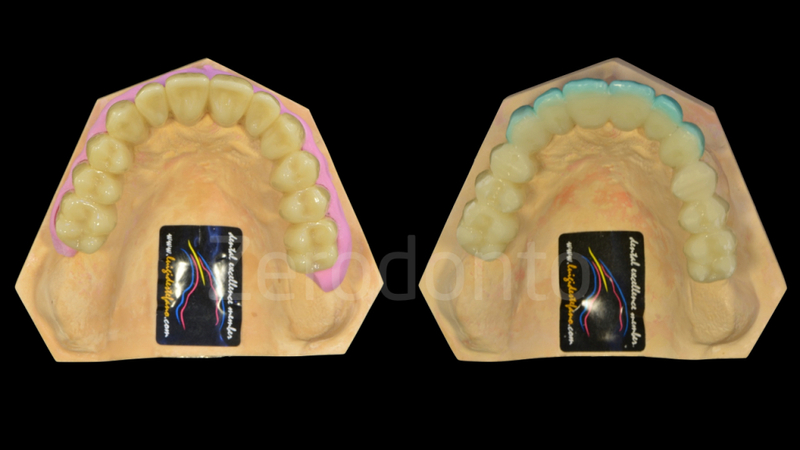 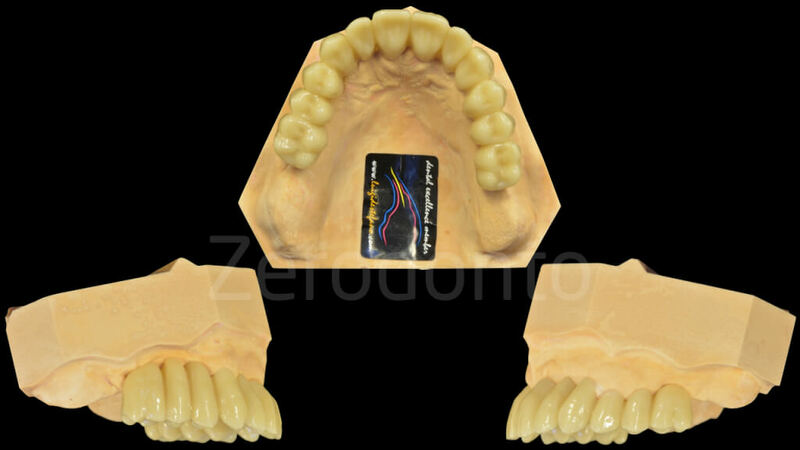 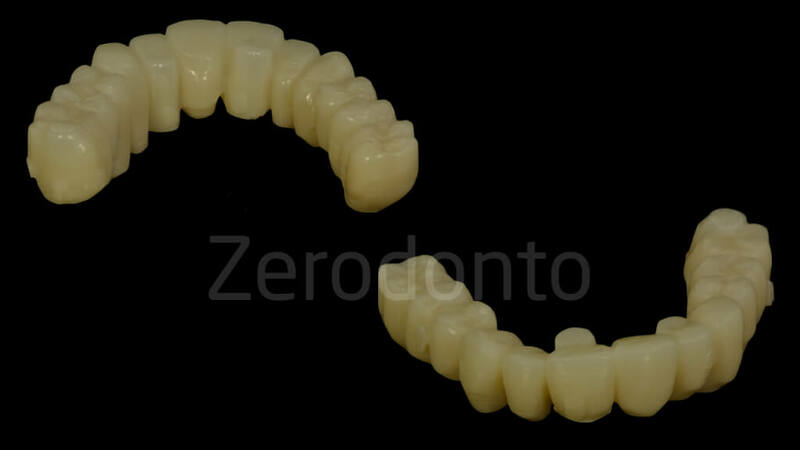 Once the project was correct in relation to the occlusal plane, a preliminary CAD-CAM (DWX 50 Roland) temporary monolayer Sintesisud PMMA prosthesis was produced, in order to check the effectiveness of the prosthetic modeling intraorally. 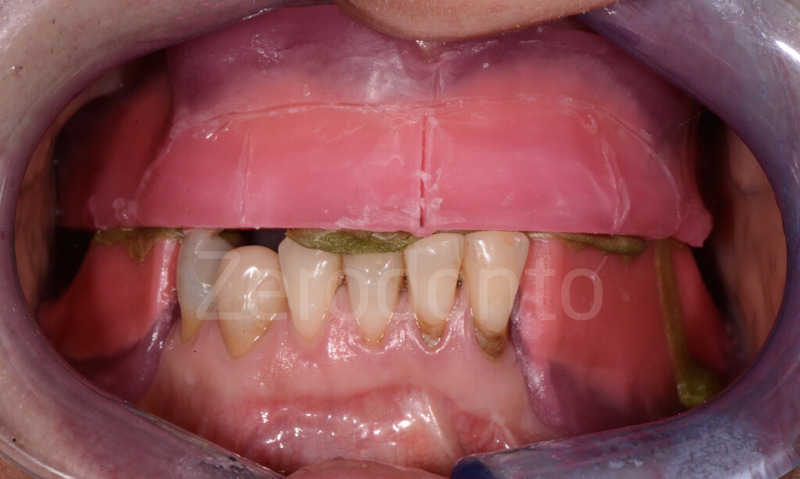 The interim prosthesis was luted using denture paste. 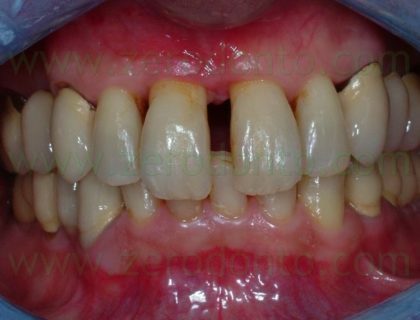 Because of the severe maxillary atrophy, the esthetics was not satisfactory, since the clinical crowns appeared to be too long. 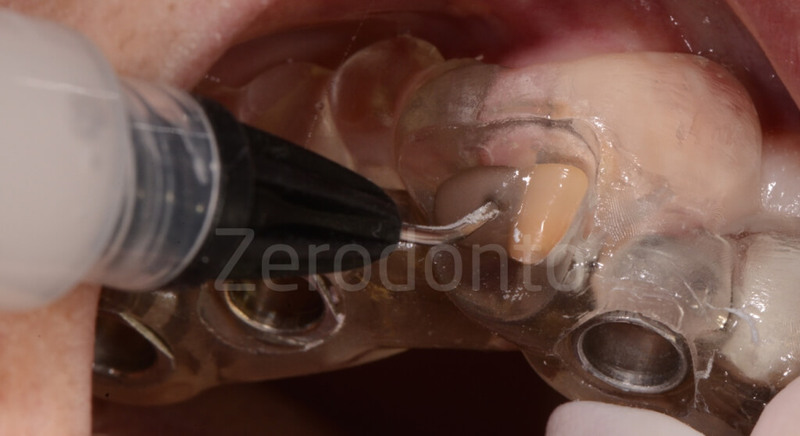 The patient had denied any kind of hard and soft tissues regeneration; nonetheless, a silicon index simulating proper mucosal tissues was fabricated, in order to check the esthetics during function and support of perioral tissues and to correct the apical-coronal length of the prosthetic elements. 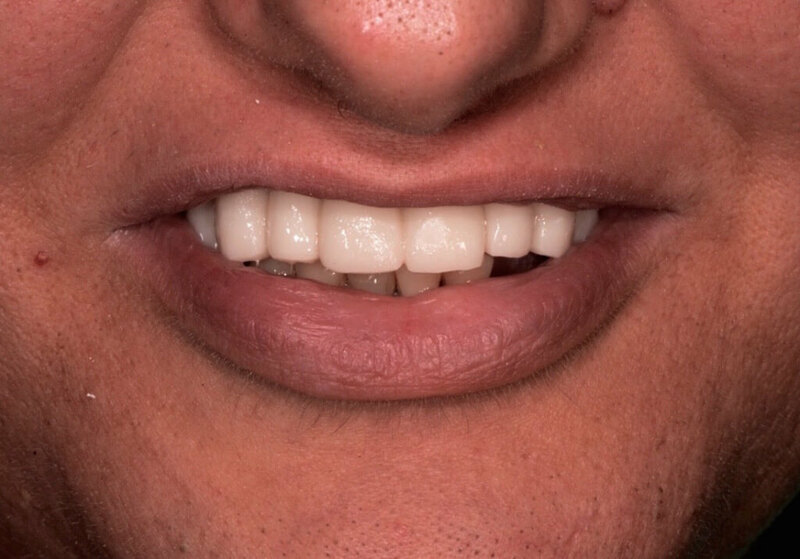 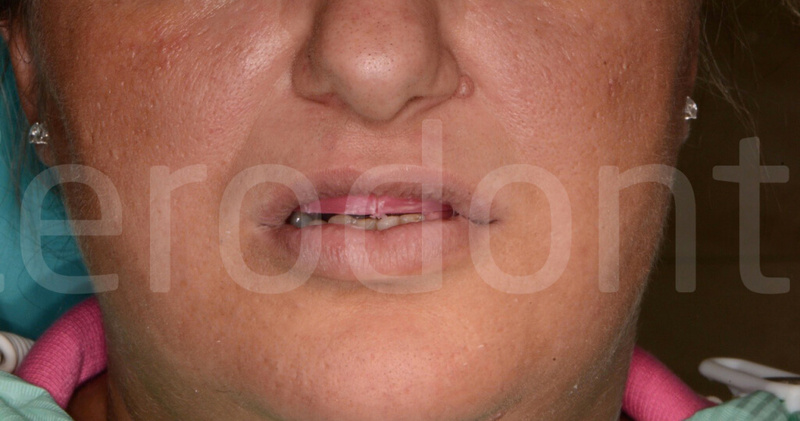 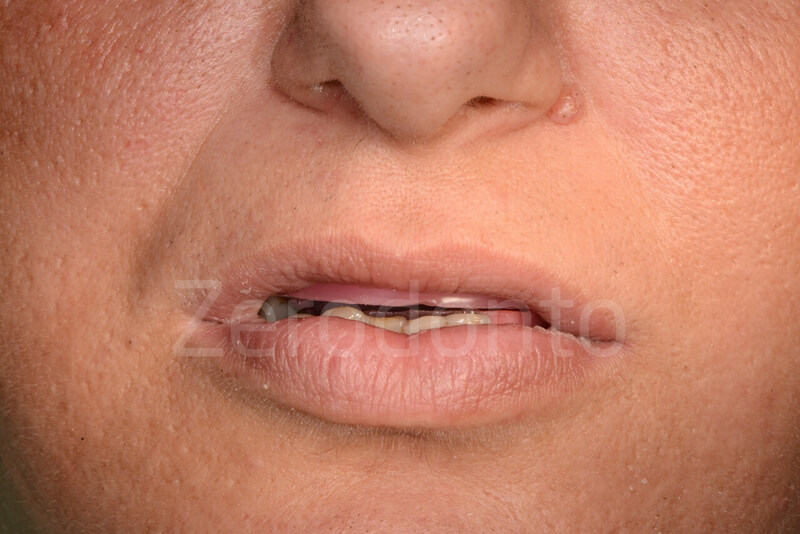 Although the established VDO was respected, the temporary prosthesis was not satisfactory as to esthetics, since the front teeth were excessively visible both at rest and during function. 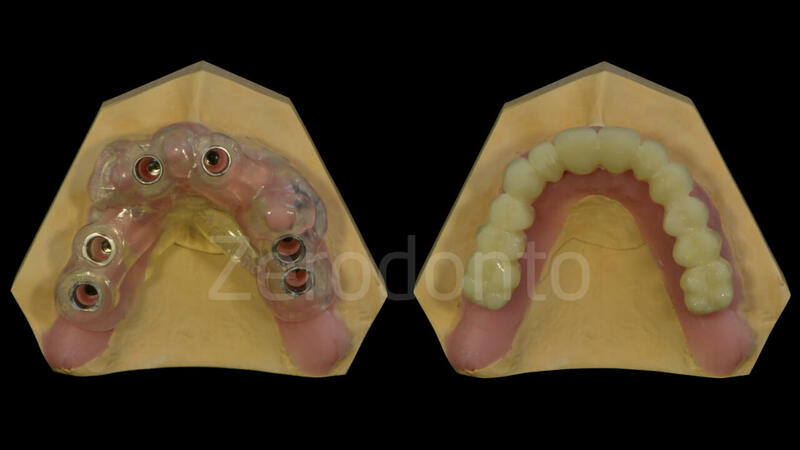 Consequently, the digital project was modified and a second interim PMMA prosthesis was fabricated as previously described. 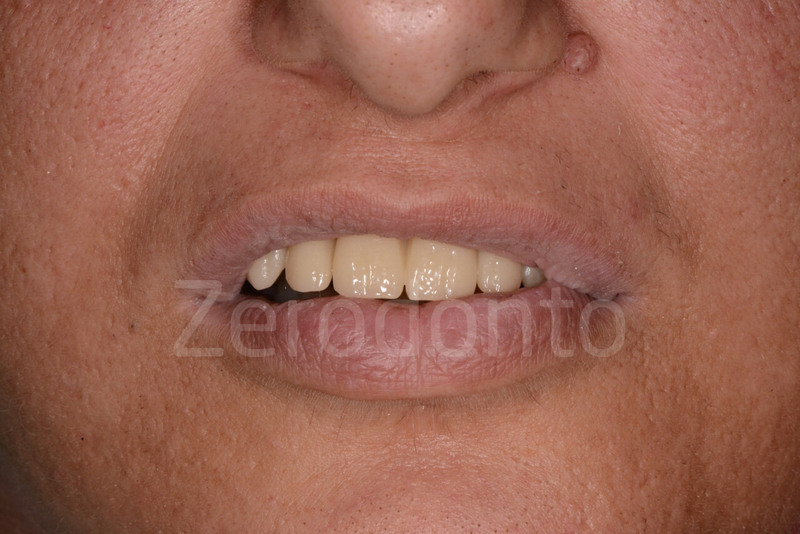 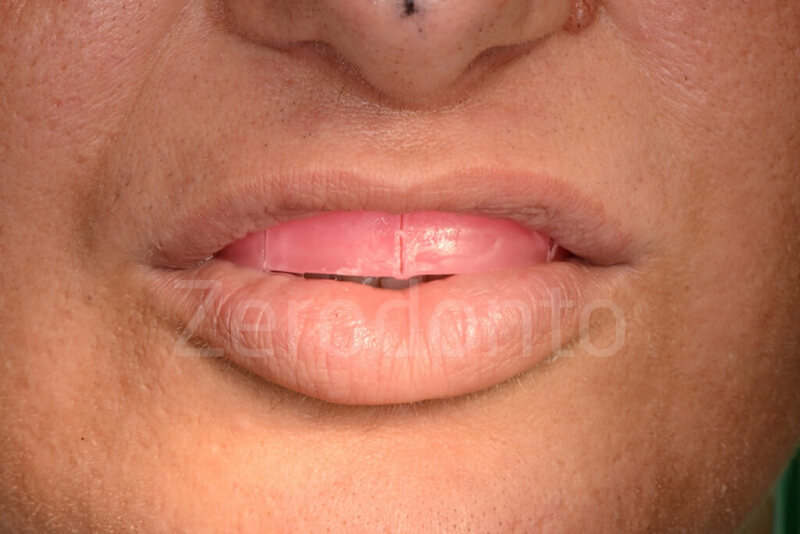 The second prosthesis supported the upper lip properly but the clinical crowns were still too long; then, the shapes were correct intraorally. 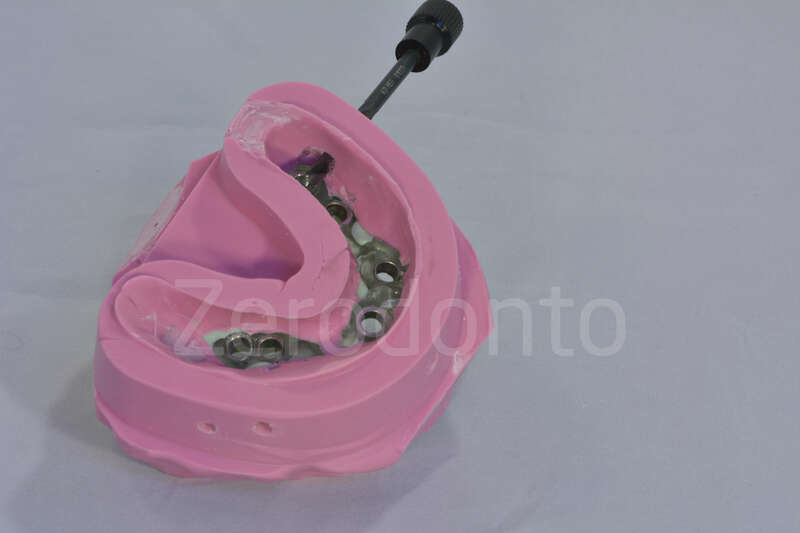 Once the esthetics was satisfactory, the changes were transferred first to the analog master cast by means of wax and then this modified cast was scanned and imported in the digital environment, so as to produce a third prosthesis to perform the final try-in. 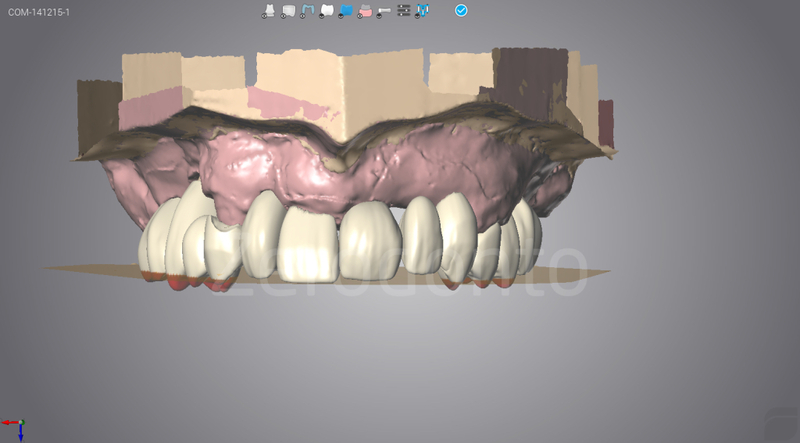 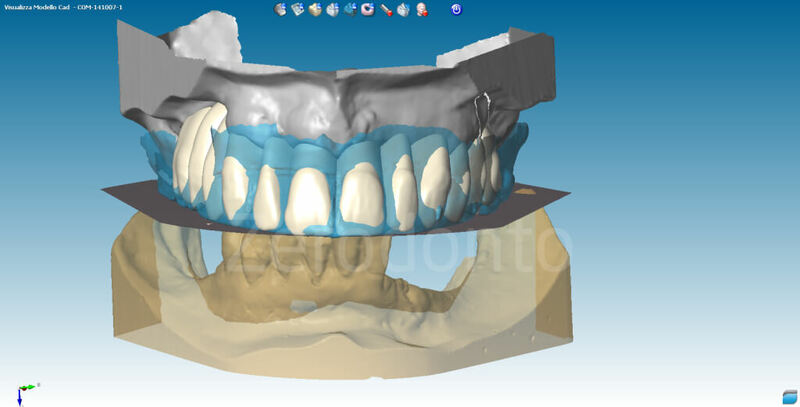 Once the study of the case was completed, the effectiveness of the prosthetic project was checked and the ideal emergence areas of the prosthetic elements were identified, the digital implant planning was made using the coDiagnostiX software. 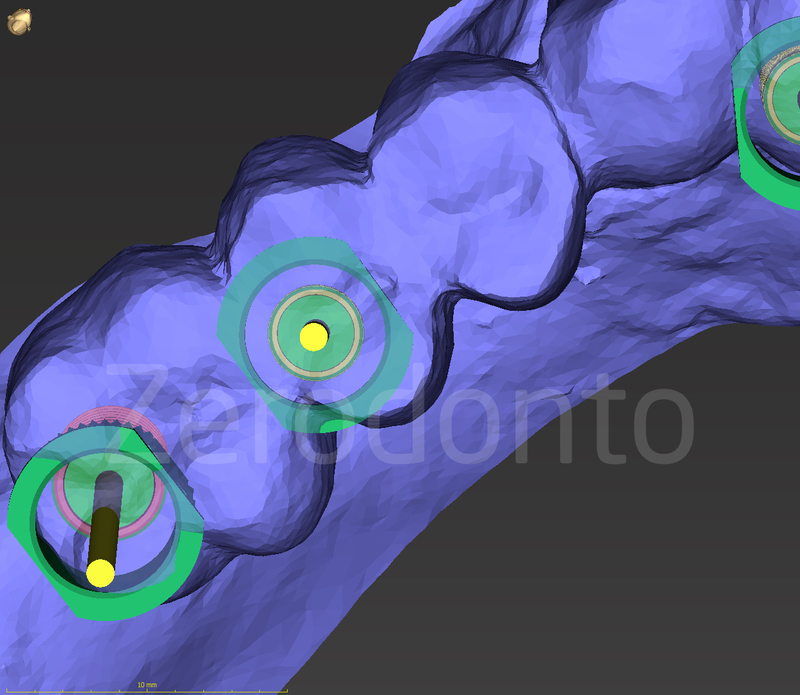 6 Straumann Roxolid Bone Level SLActive implants for guided surgery were planned: 3 with diameter of 3.3 mm and 3 with a diameter of 4.1 mm. 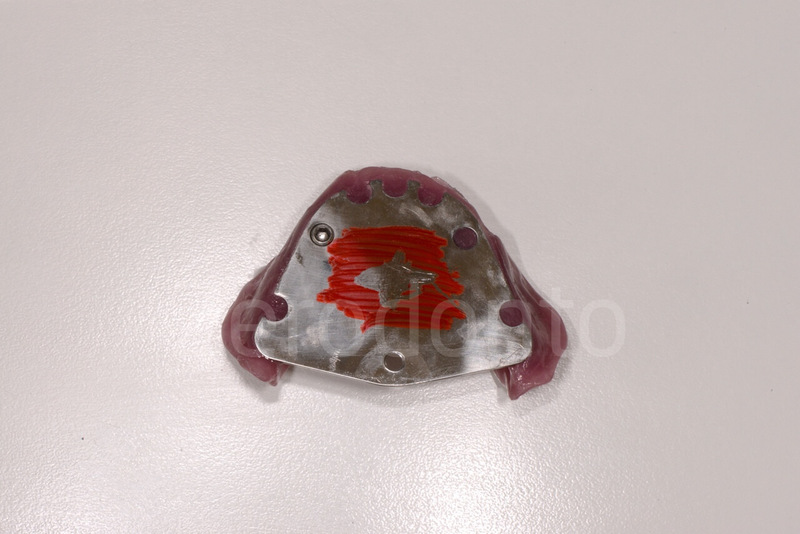 After completing the implant planning, the surgical template was produced by means of a 3D printer (DWS) and used to fabricate the screw-retained temporary prosthesis for immediate loading. 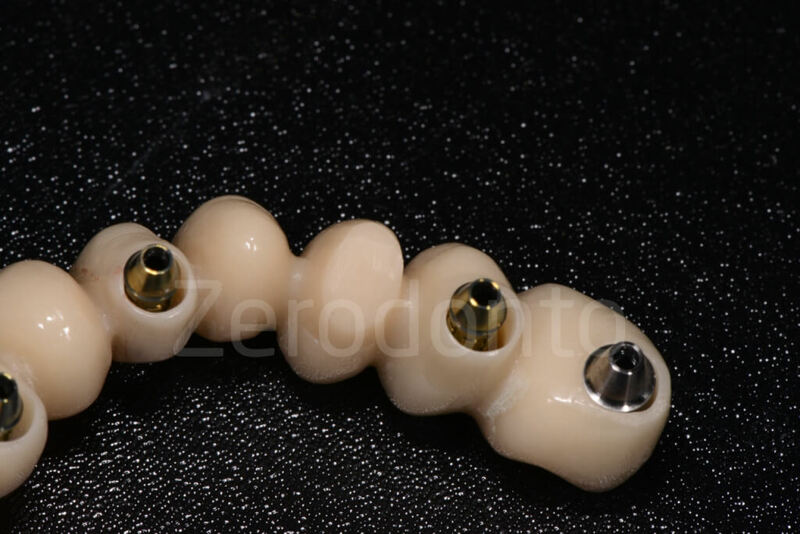 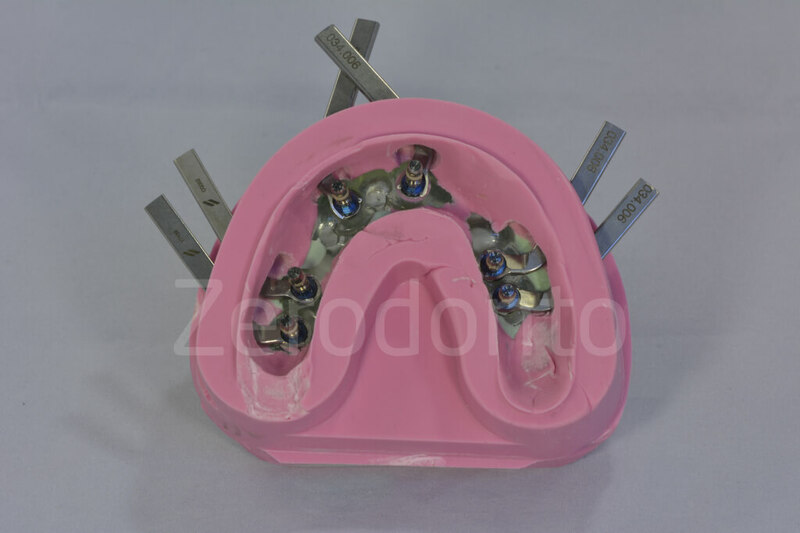 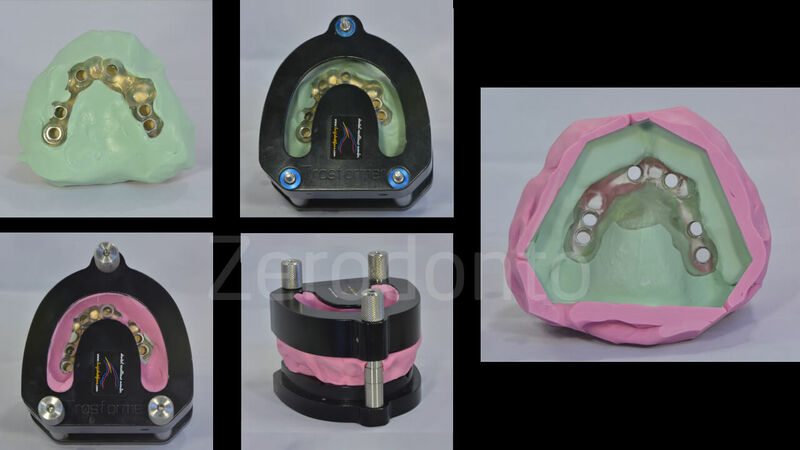 The guided implant mounters blocked by the relative surgical holders according to the information provided by the surgical template and screwed into the relative implant were used with a duplicating system (Transformer) to fabricate the master cast. 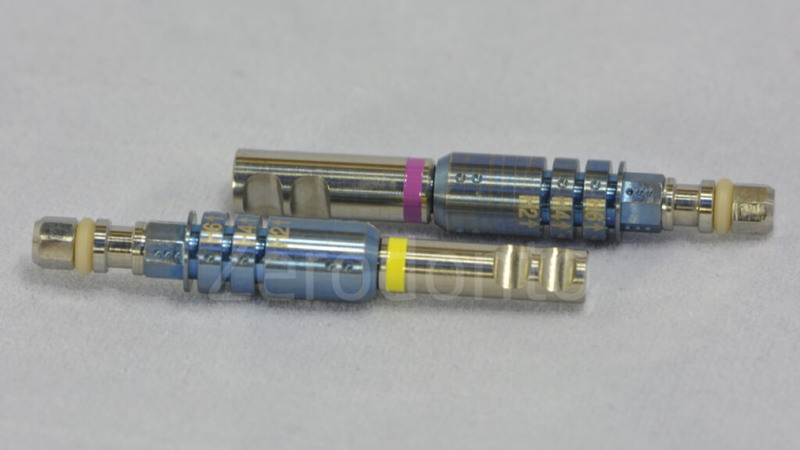 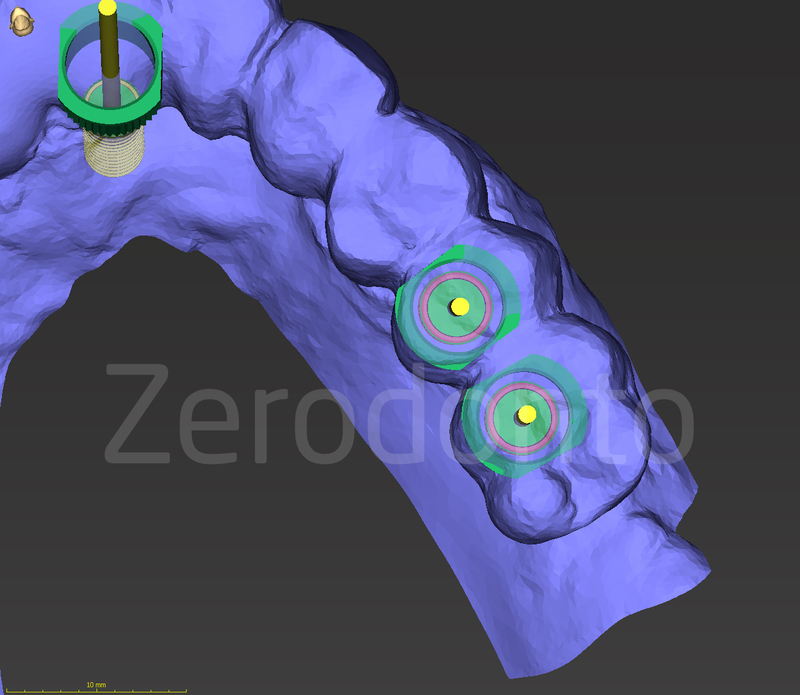 The temporary cylinders were screwed onto the implant analogs, scanned and imported in the modeling software. 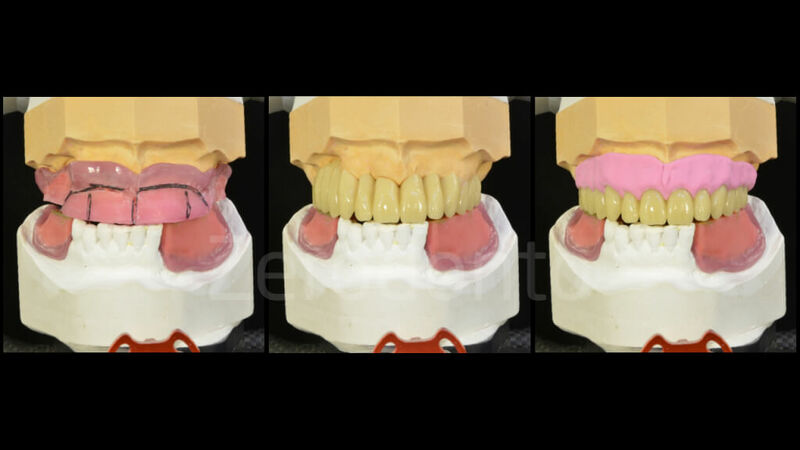 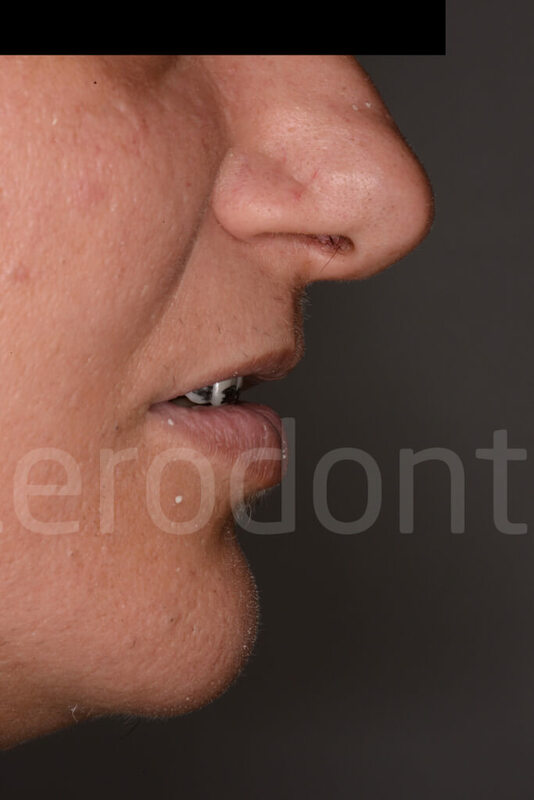 The digital master cast and the prosthetic project were superimposed and the soft tissues were modified digitally to achieve a proper pontic architecture. 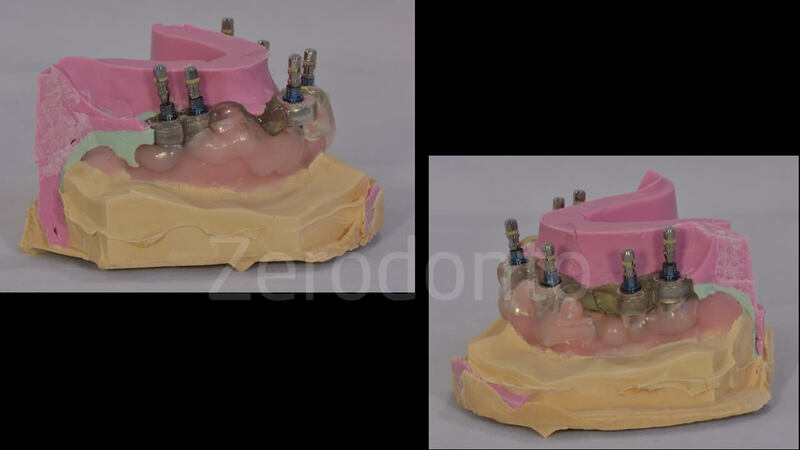 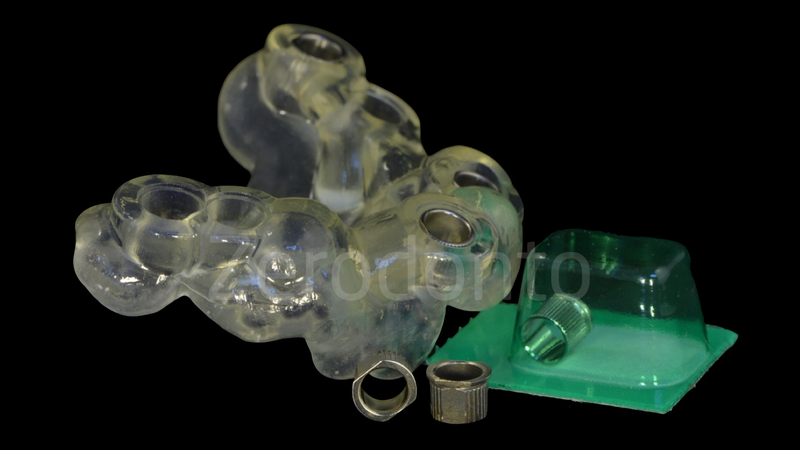 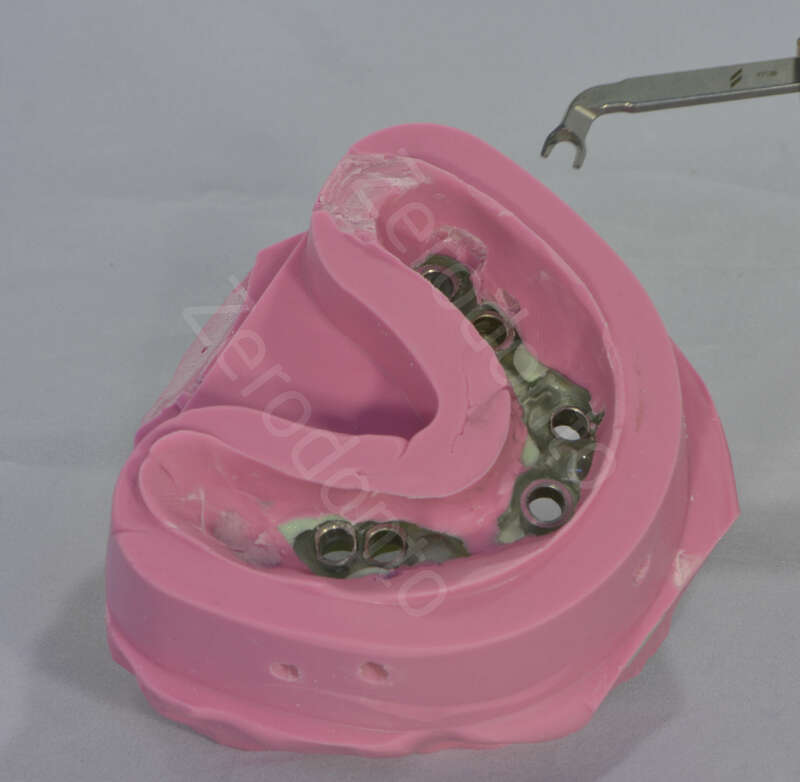 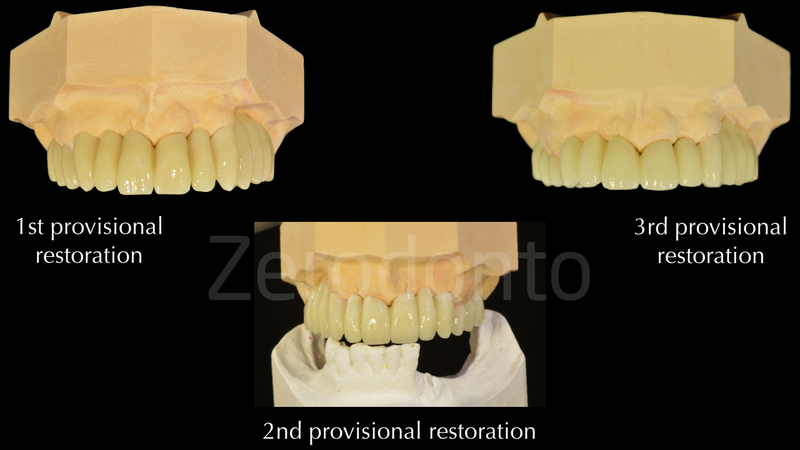 Once the digital project was completed, a CAD-CAM temporary Anaxdent multilayer PMMA prosthesis was produced for the immediate loading. 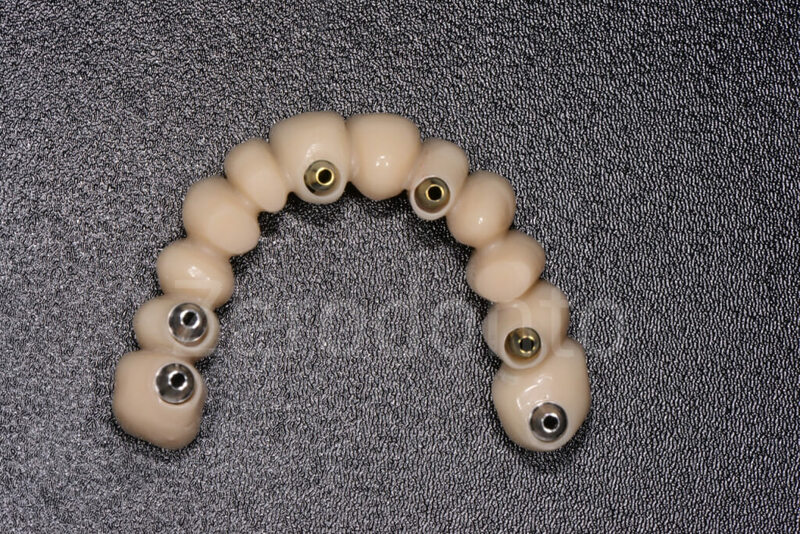 Such prosthesis was modified to fit onto the temporary cylinders and they were blocked by a minimum amount of flowable composite resin. 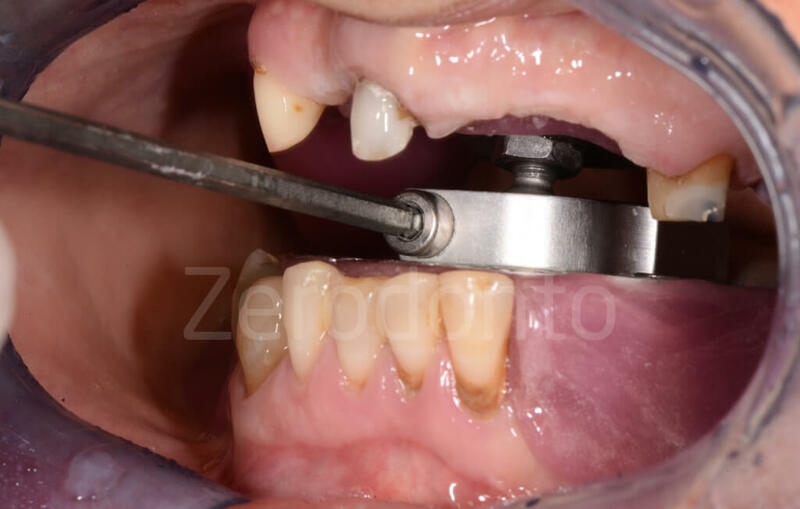 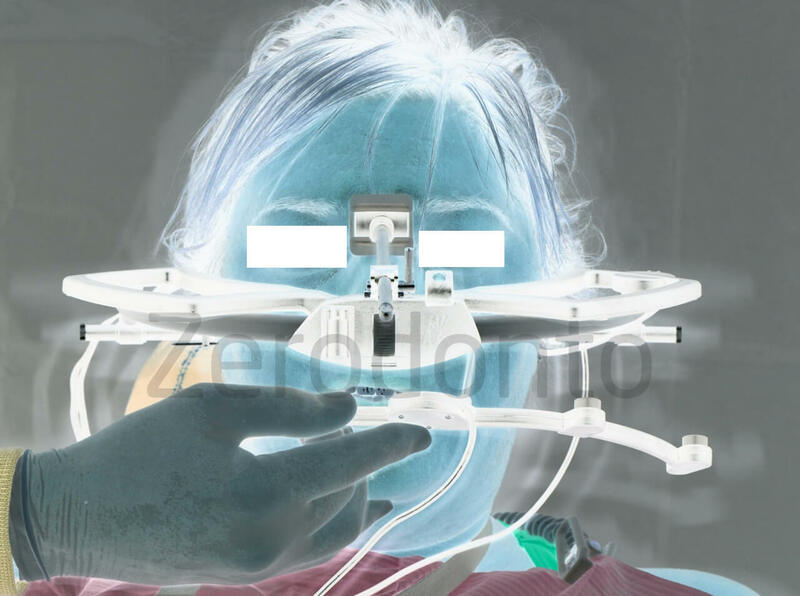 The surgical template was holed in the areas were anesthesia was needed, so as to avoid and swelling of the mucosal tissues that could interfere with the stability of the surgical guide. 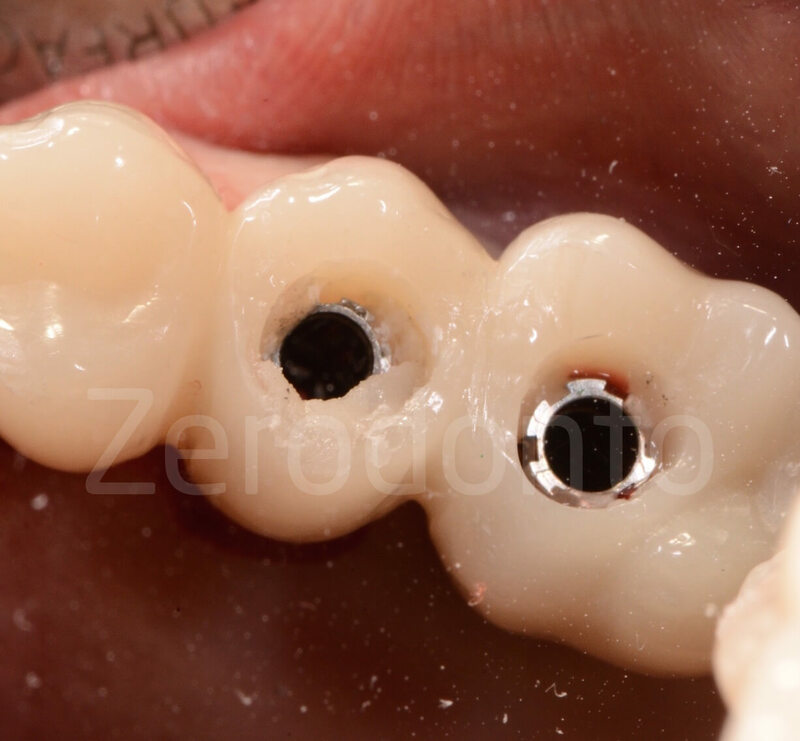 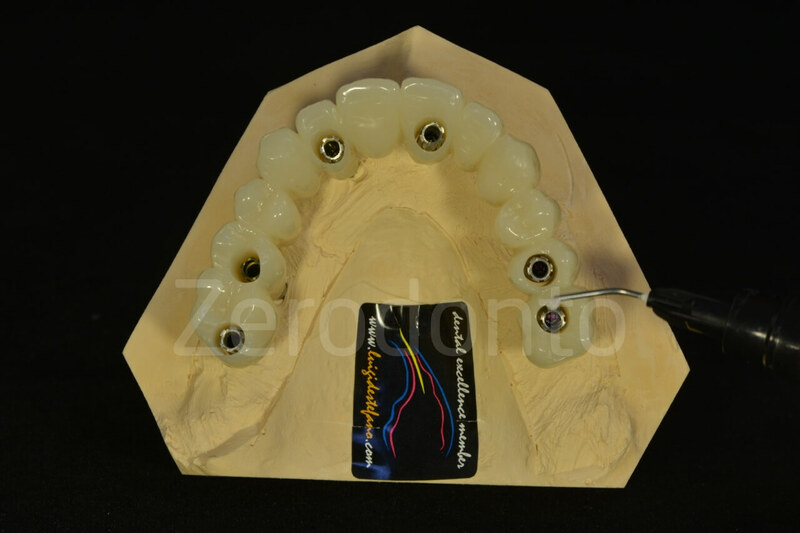 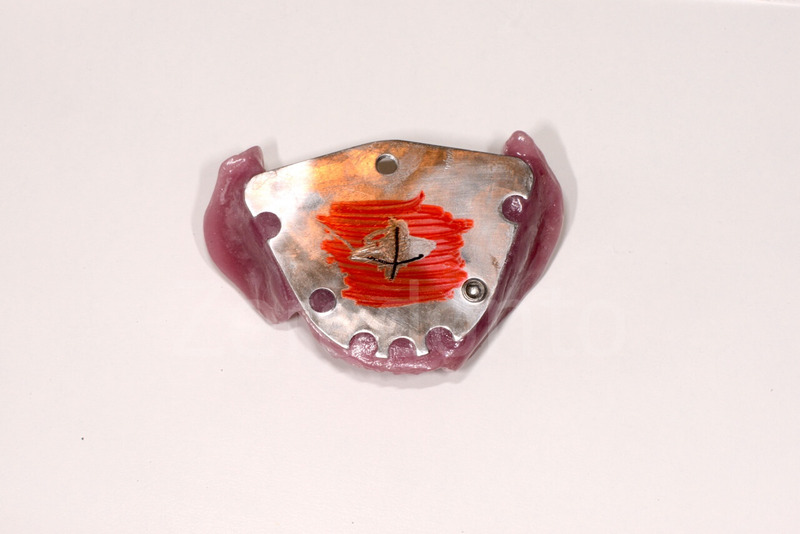 Then, the template was fixed on the natural tooth abutments using self-curing acrylic resin. 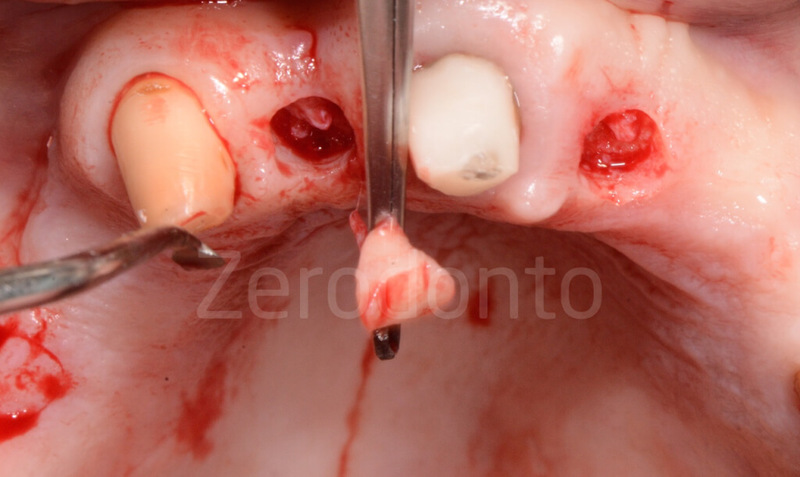 After the mucotomies were made, the mucosal pieces were eliminated removing the surgical guide. 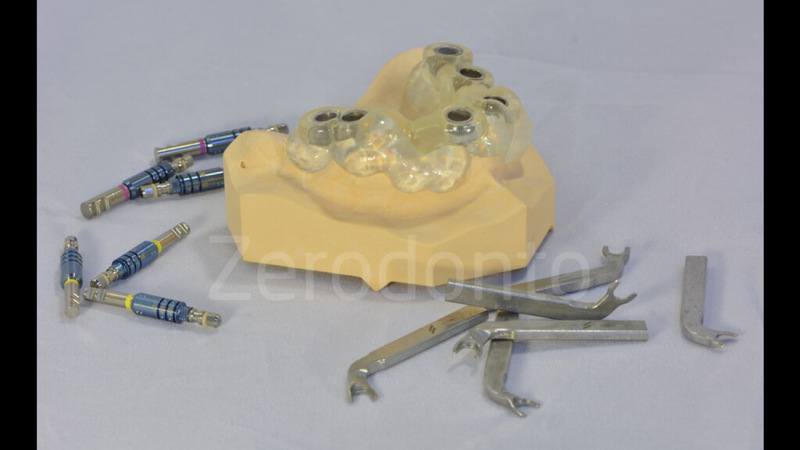 Then, the implant guided surgery was performed according to the programmed drilling sequence using a kit dedicated to guided-surgery. 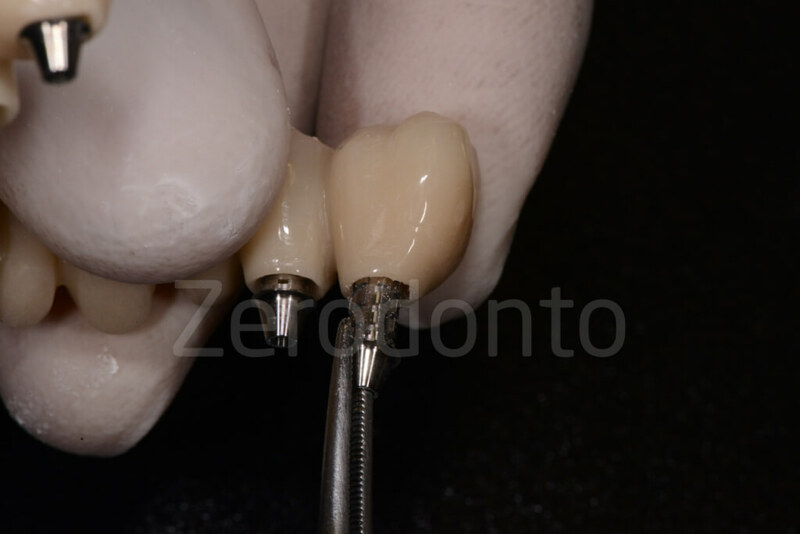 The coronal-apical position of each drill was checked using the guided handles inside the sleeves. The surgical components can be easily identified by means of colors and reference symbols. 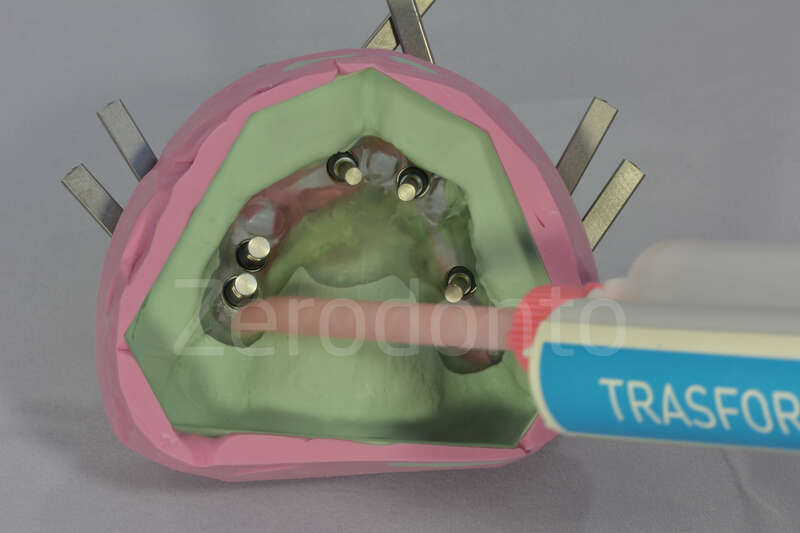 The Straumann guided system allows to use fixing pins to be placed into the sleeves and the implant sites to provide further stabilization to the surgical template during surgery. 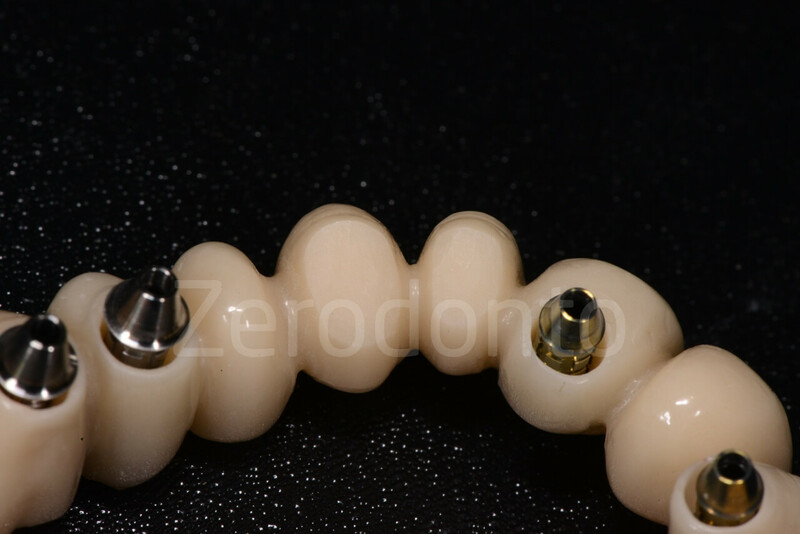 A poor bone quality was found while screwing implant 26, which did not reached a satisfactory primary stability. 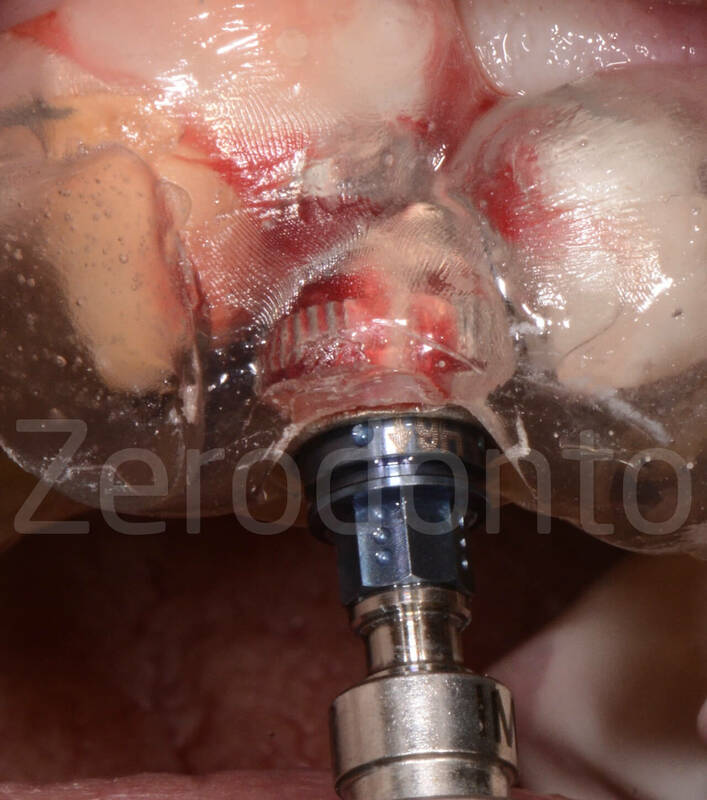 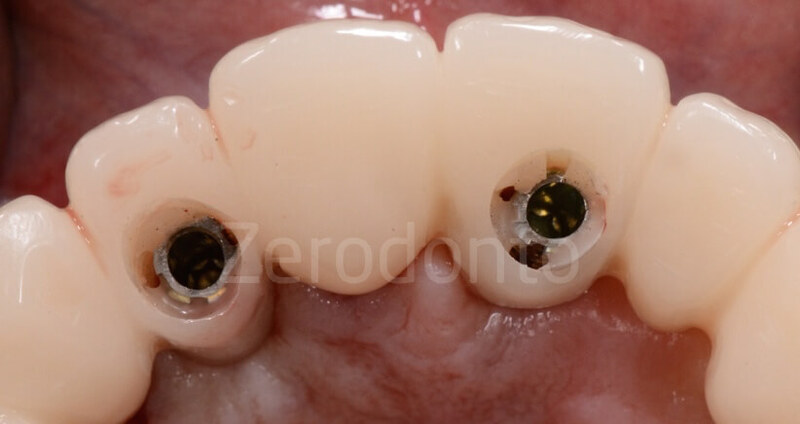 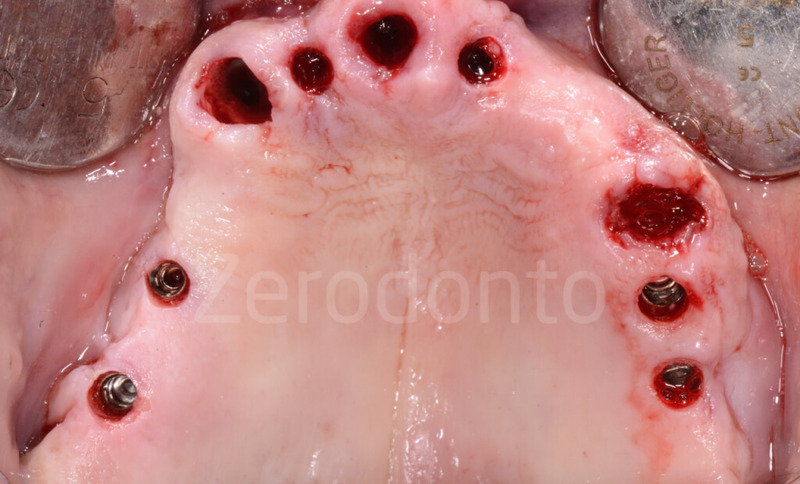 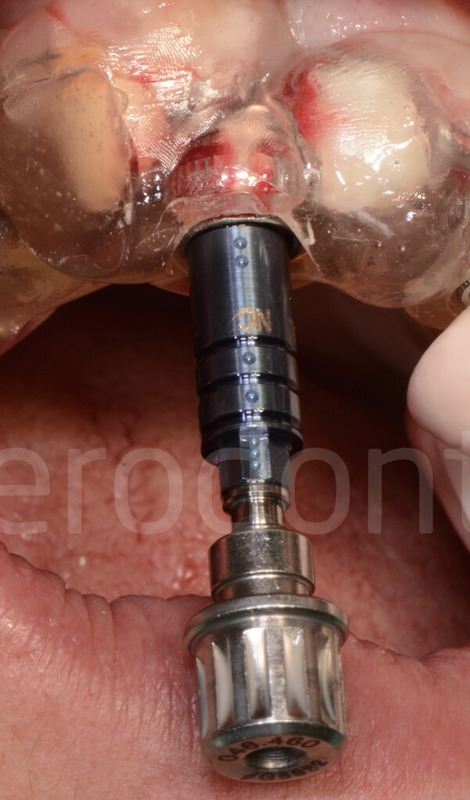 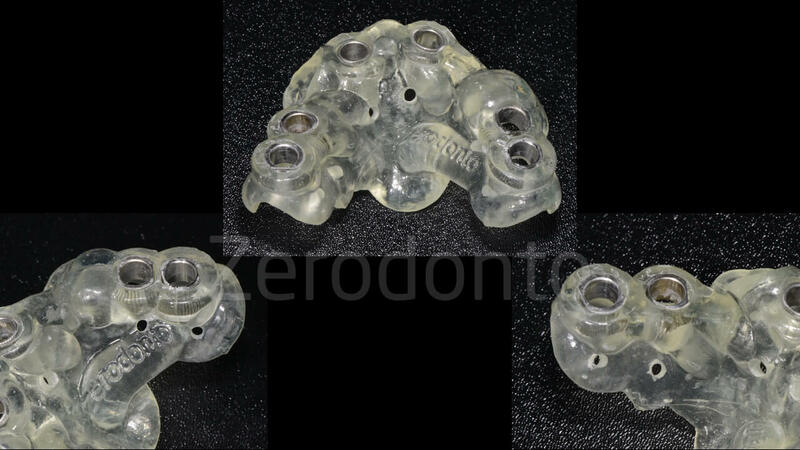 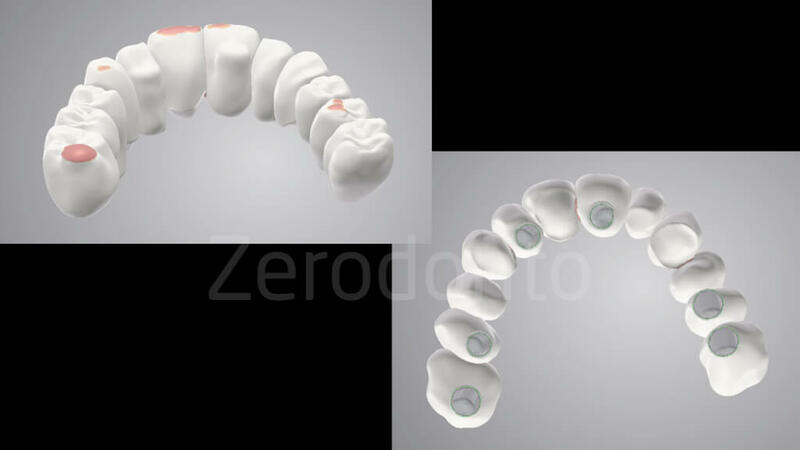 Consequenlty, the fixture was substituted with a wider diameter implant (4.8 mm Straumann Roxolid SLActive TE); the primary stability was still not perfomant and iy was decided not to load the fixture. 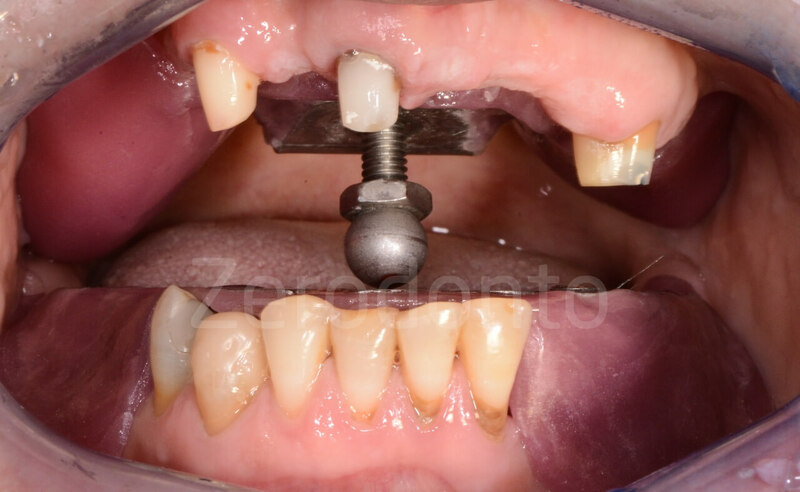 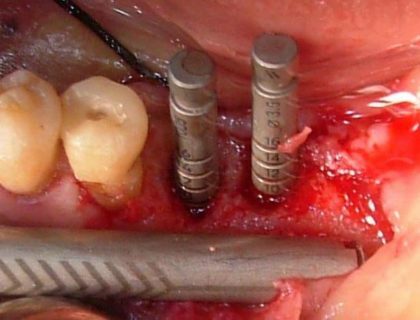 Once the implant positioning was completed, the remaining maxillary teeth were extracted and the temporary prosthesis was screwed onto the fixtures. 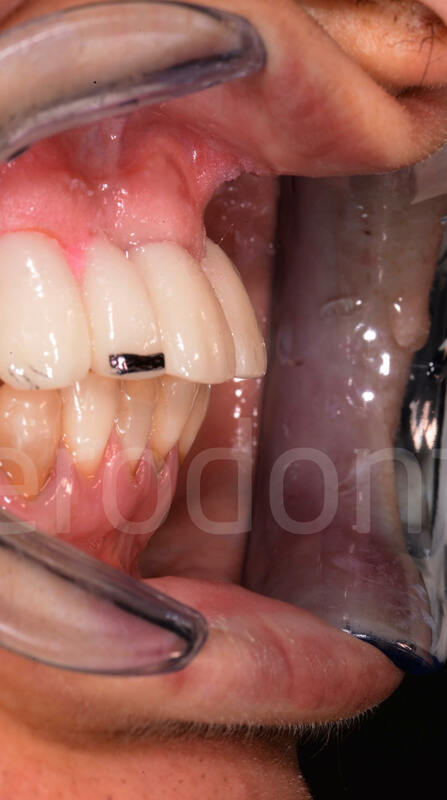 The correct fit between the provisional full-arch and the implants was checked by means of standardized periapical radiographs. 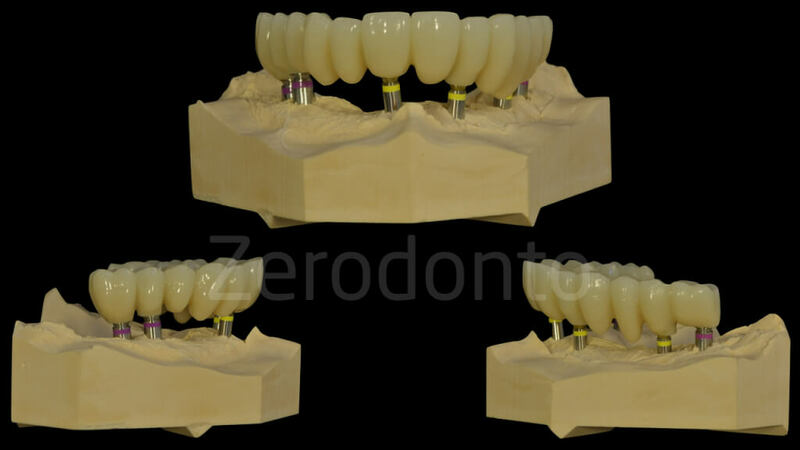 All the prosthetic cylinders were correctly screwed without fracturing the stabilization flowable composite, confirming the precision of implant digital planning. 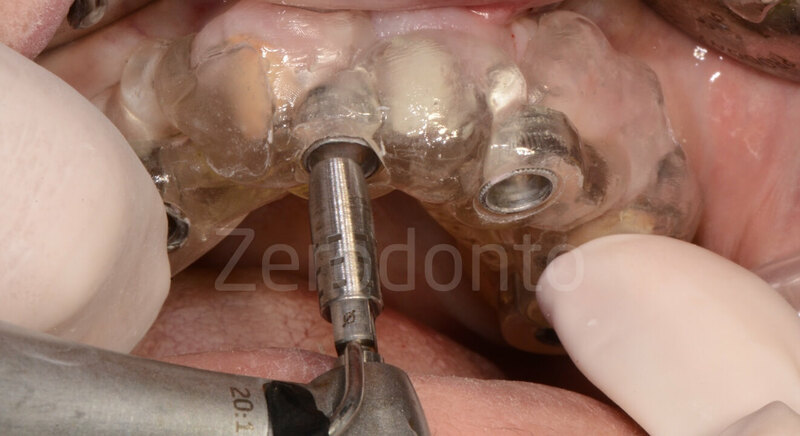 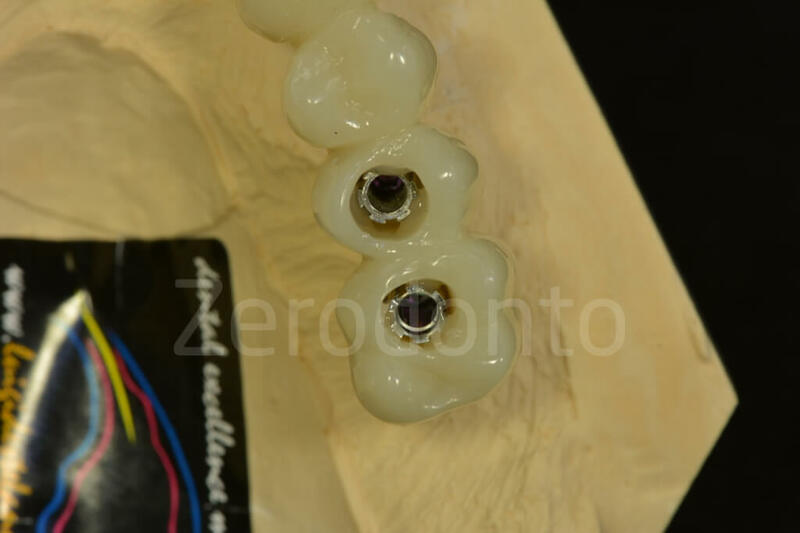 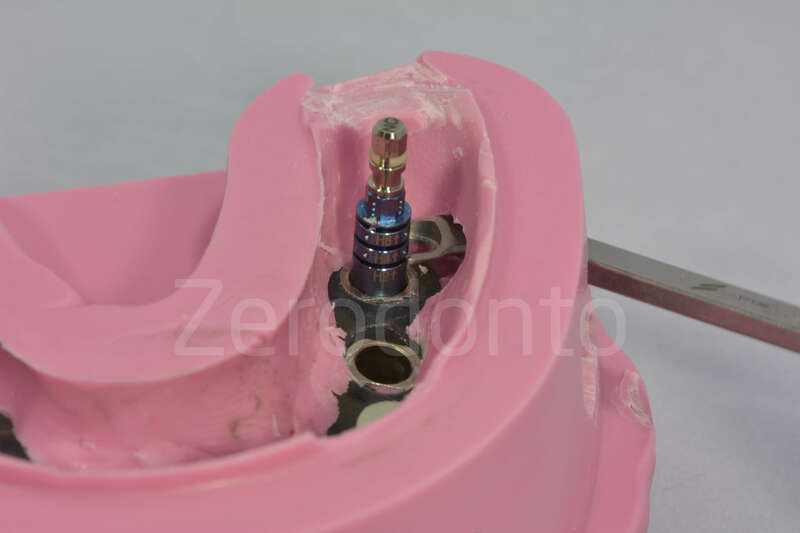 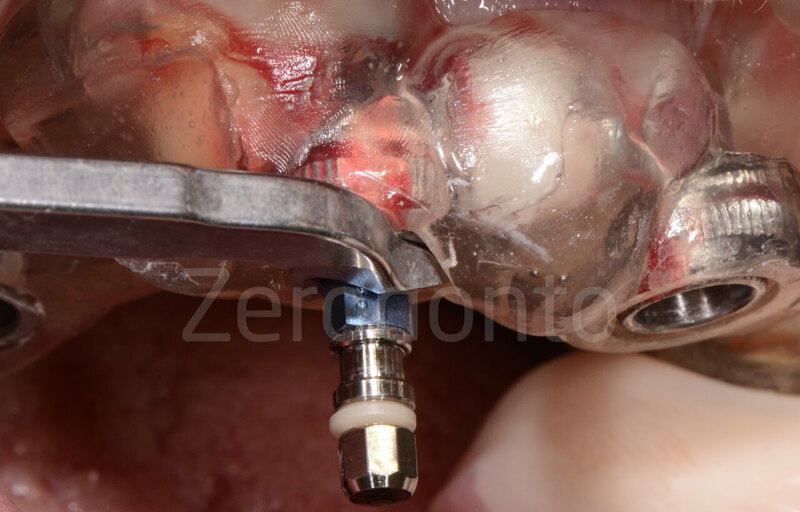 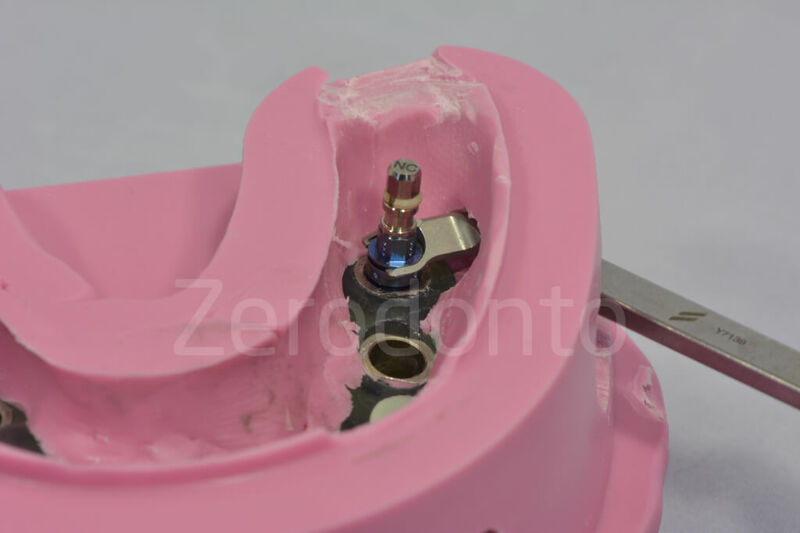 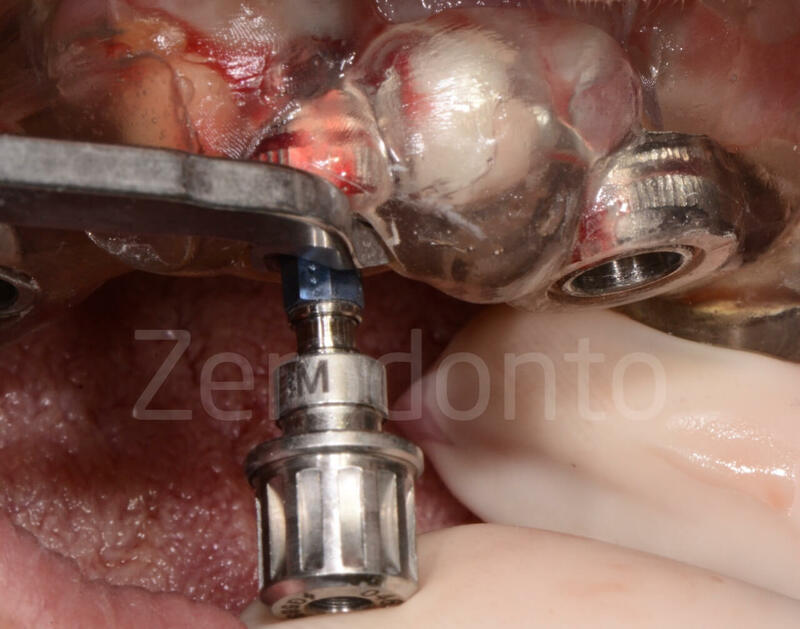 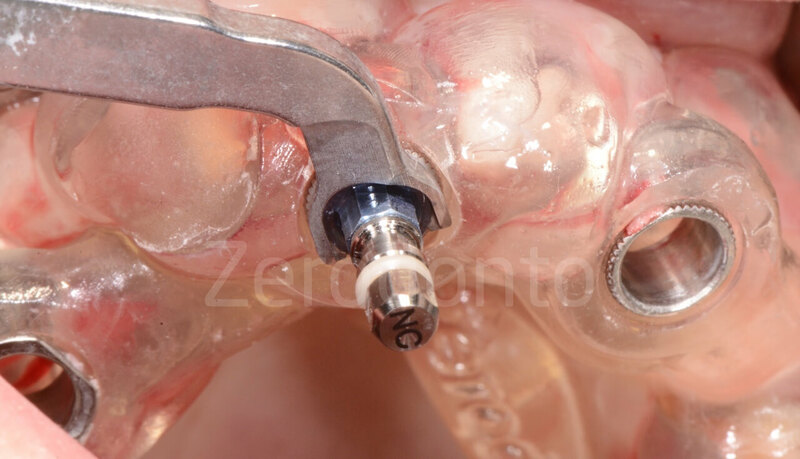 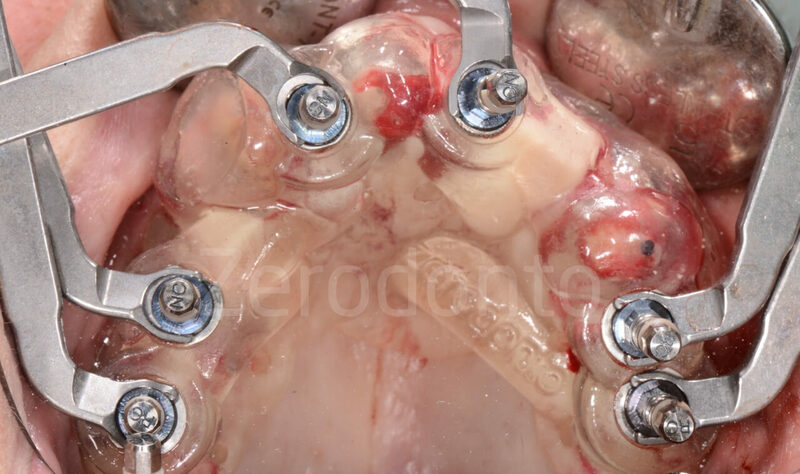 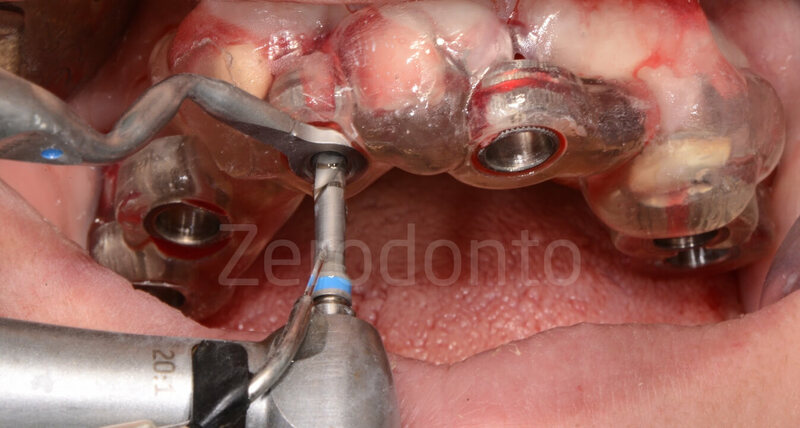 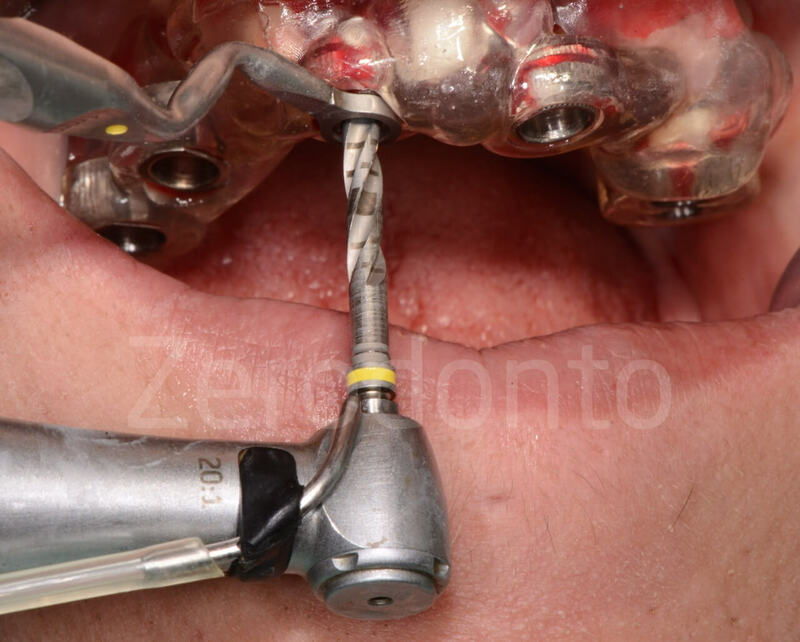 Metal sticks were inserted into the screw access holes before relining the occlusal part of the prosthesis, in order to avoid any interference between the resin and the screwing channels. 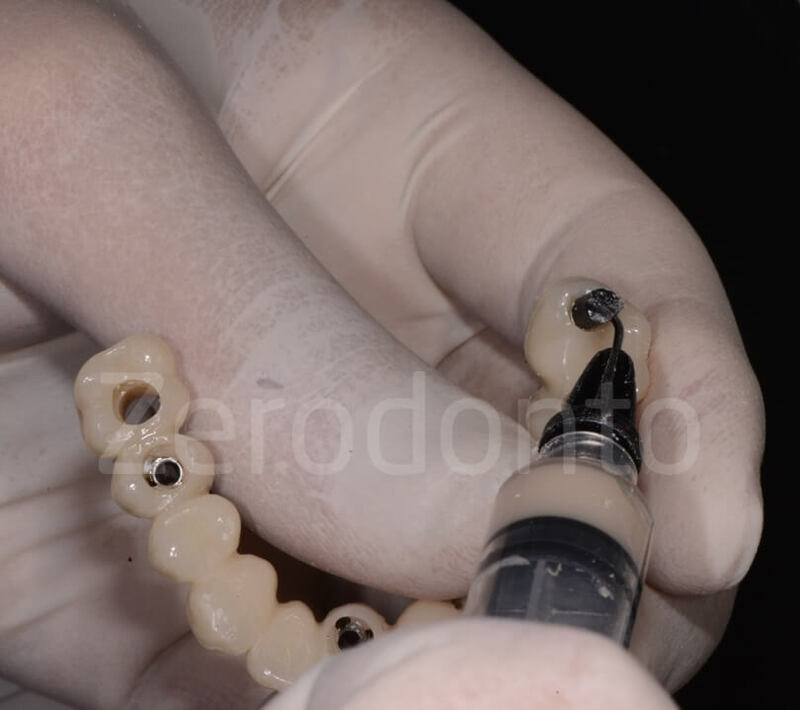 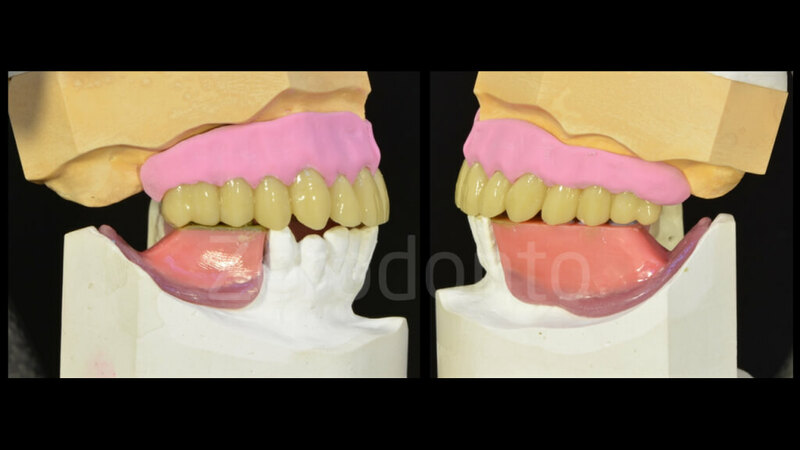 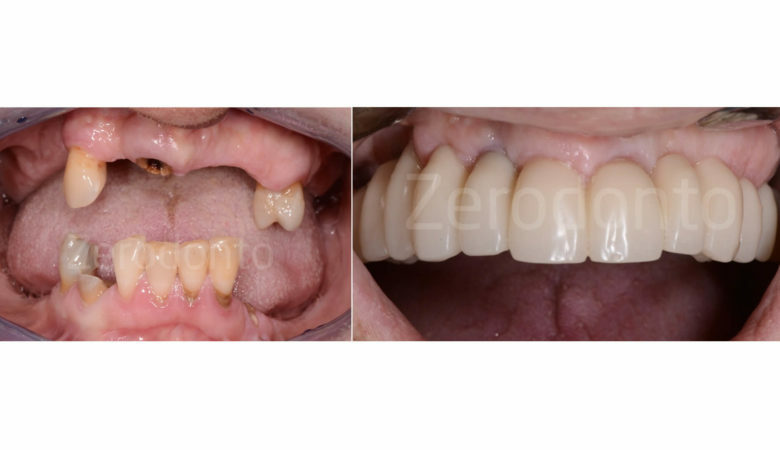 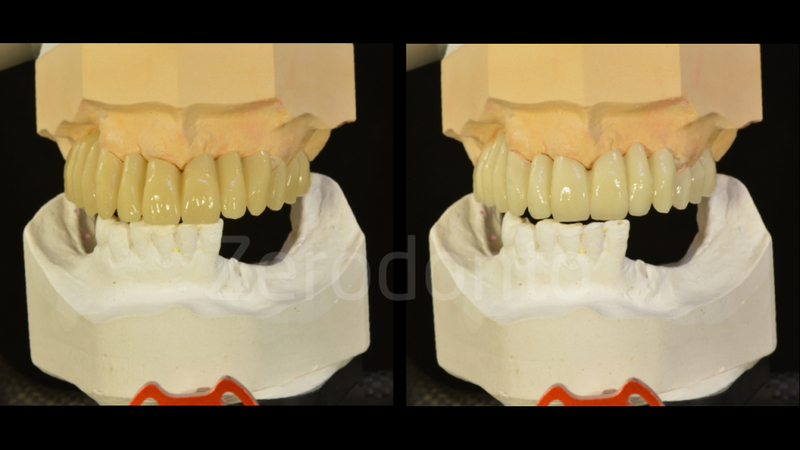 The gingival part of the prosthesis was relined, finished and polished extraorally with flowable resin composite, so as to make the prosthetic procedures easier and to limit the patient’s discomfort. 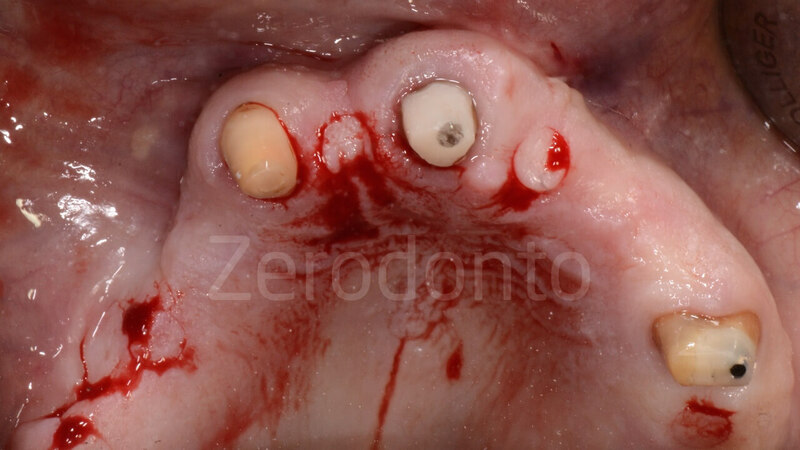 Because of an unsatisfactory bone quality, the implant in position 26 was not loaded. 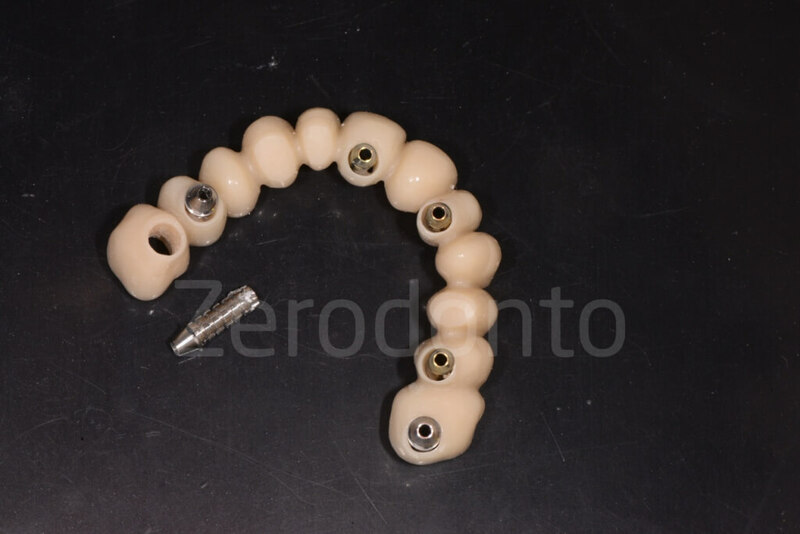 Consequently, the prosthetic cylinder was removed from the prosthesis and the hole was filled with flowable composite resin. The finished provisional prosthesis was screwed onto the fixtures soon after the implant surgery and the occlusion was carefully checked. 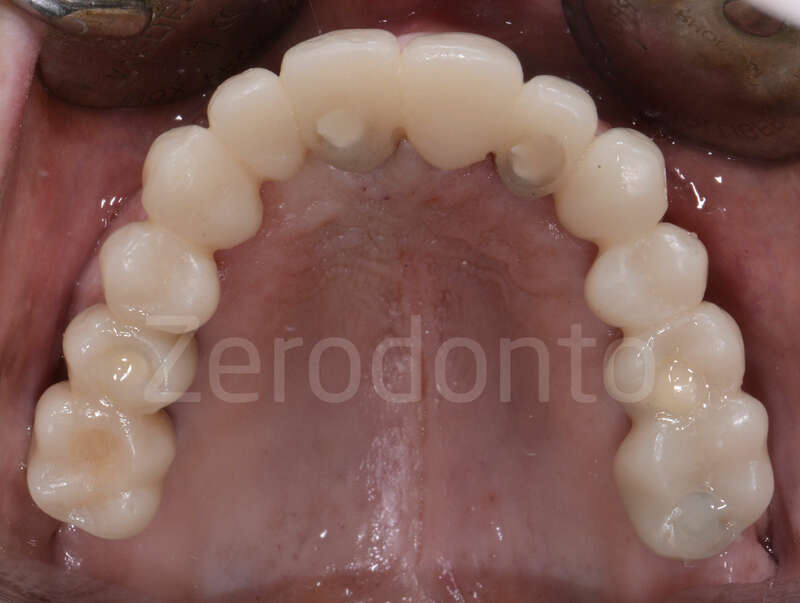 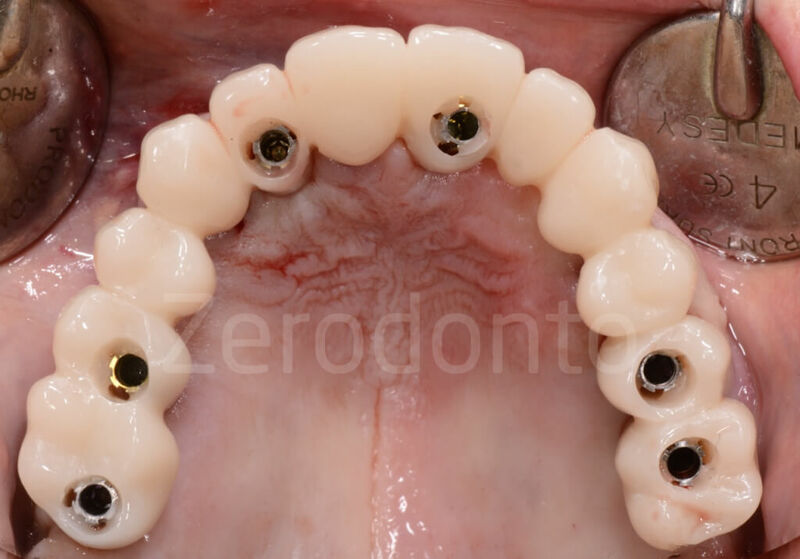 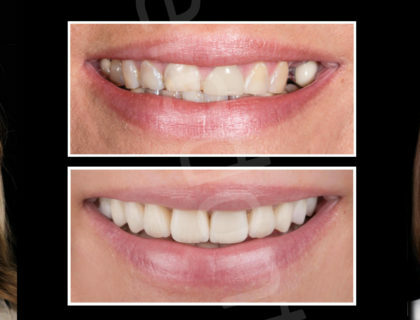 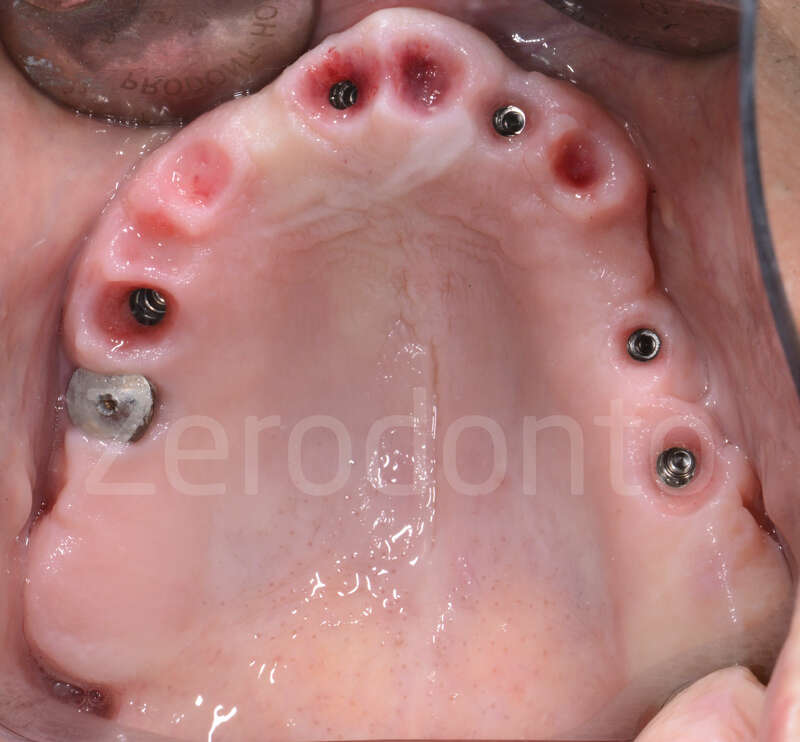 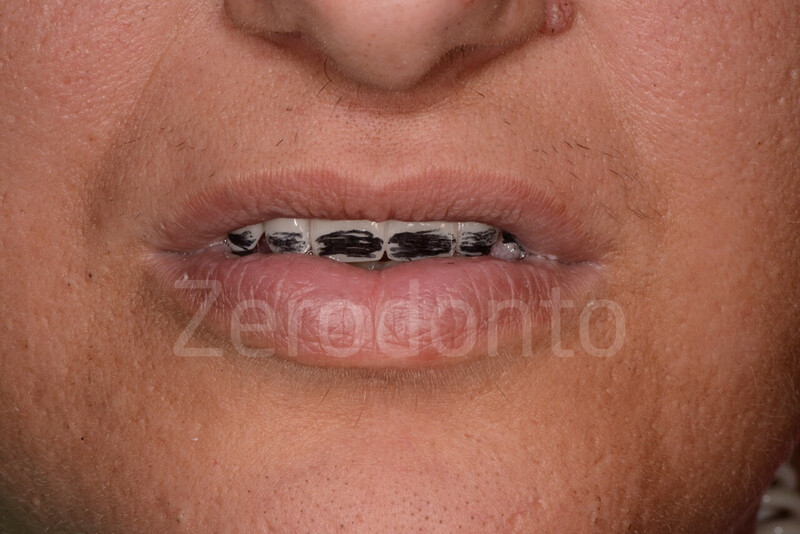 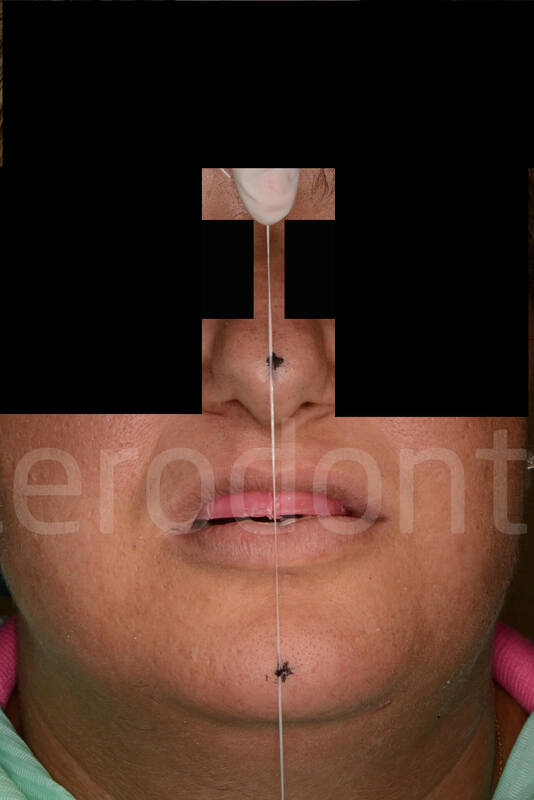 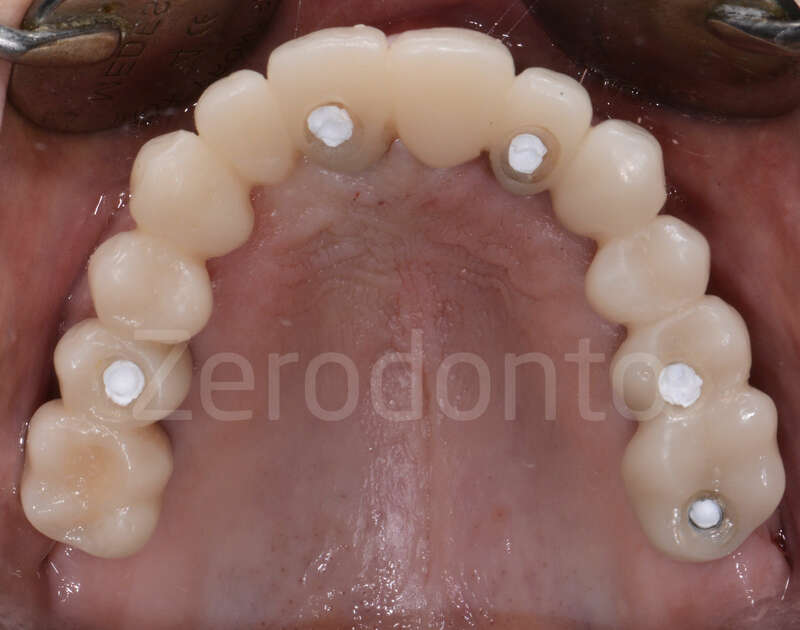 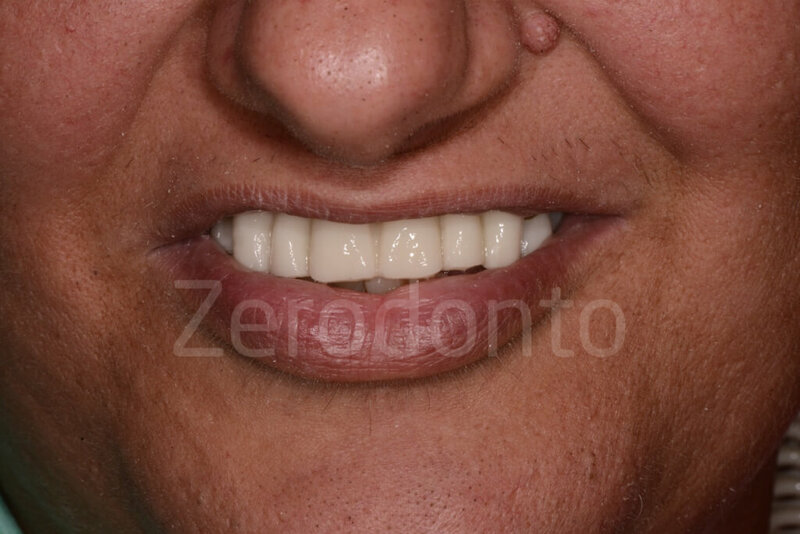 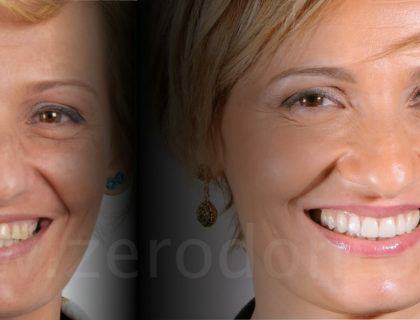 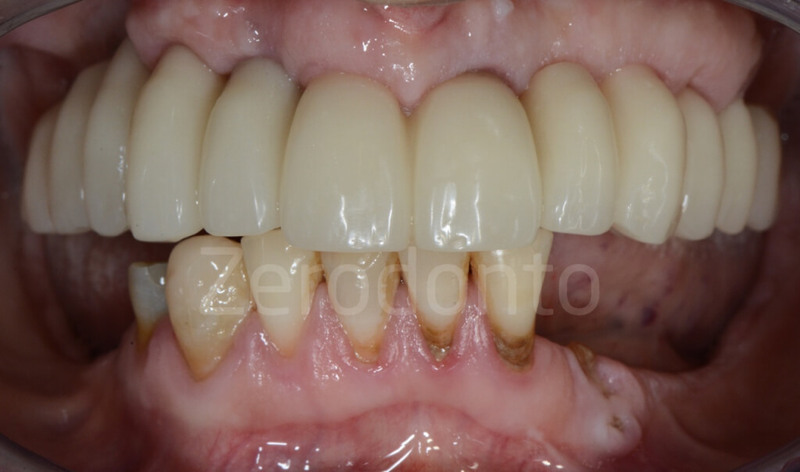 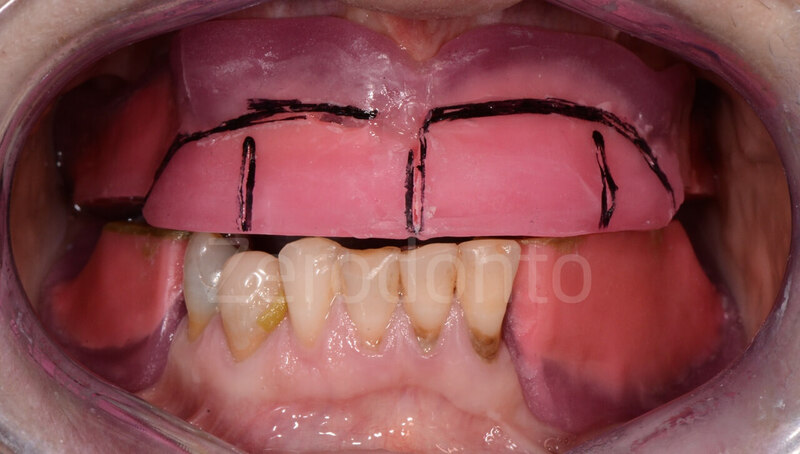 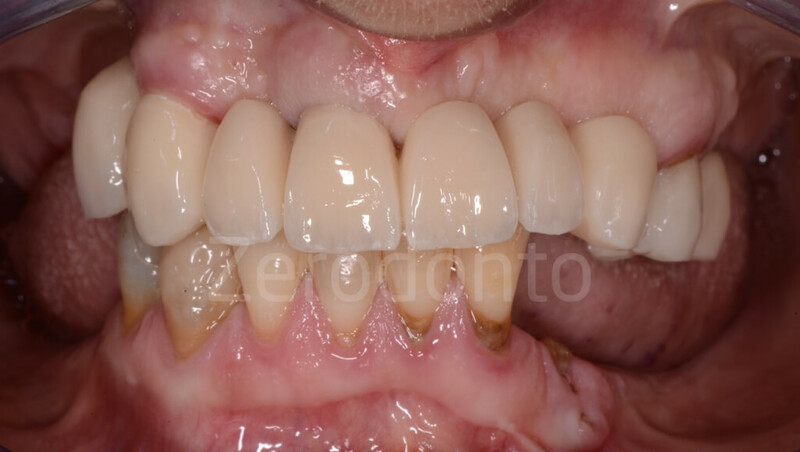 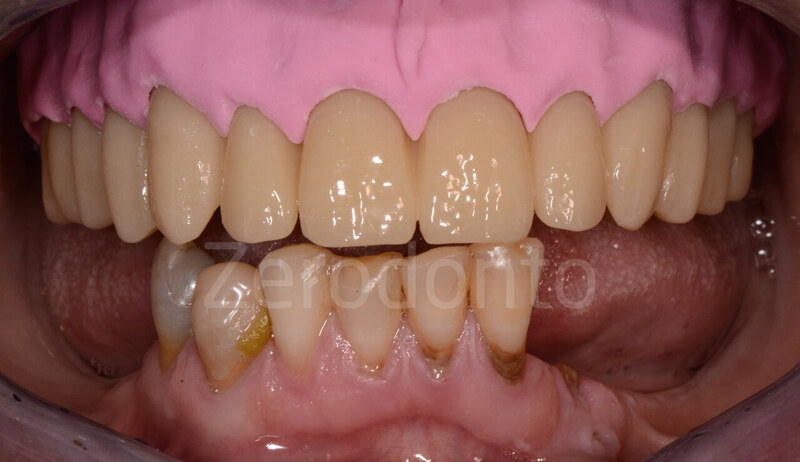 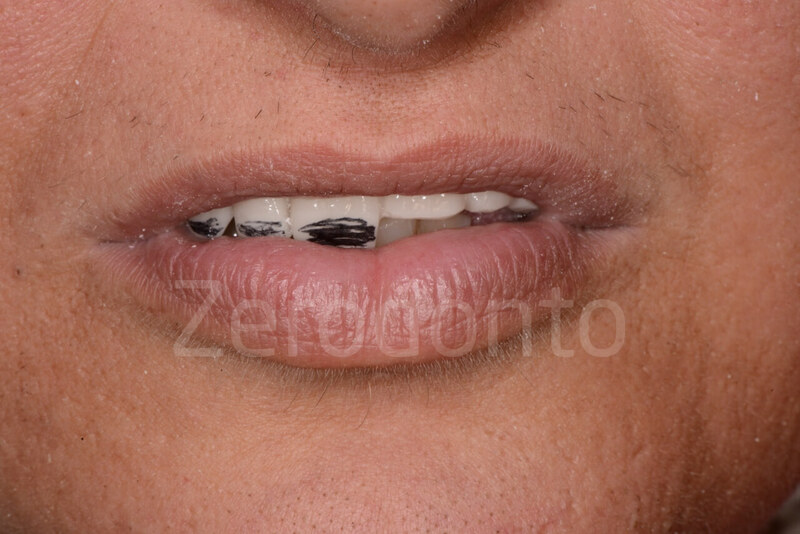 Both functional and esthetic integration were optimal and the patient was completely satisfied. 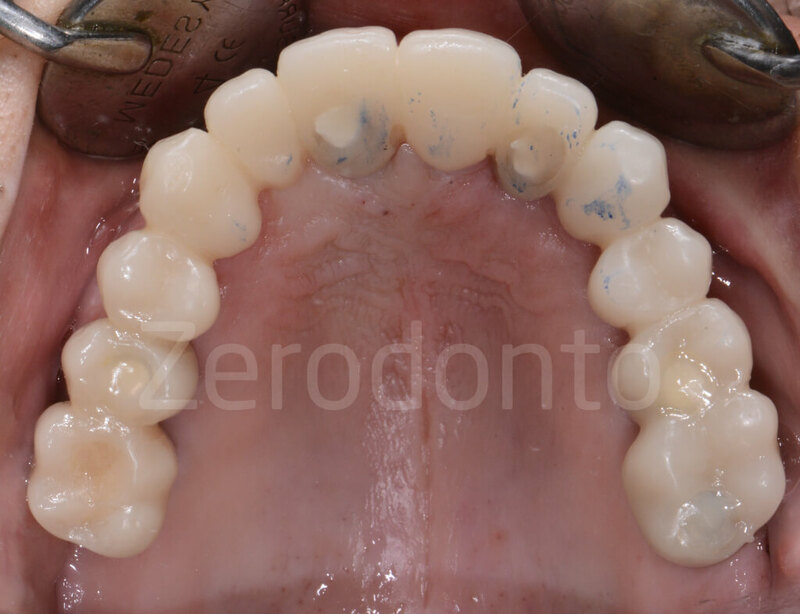 After 3 months, the temporary full-arch was unscrewed, showing a very good healing and a satisfactory preliminary conditioning of the soft tissues. 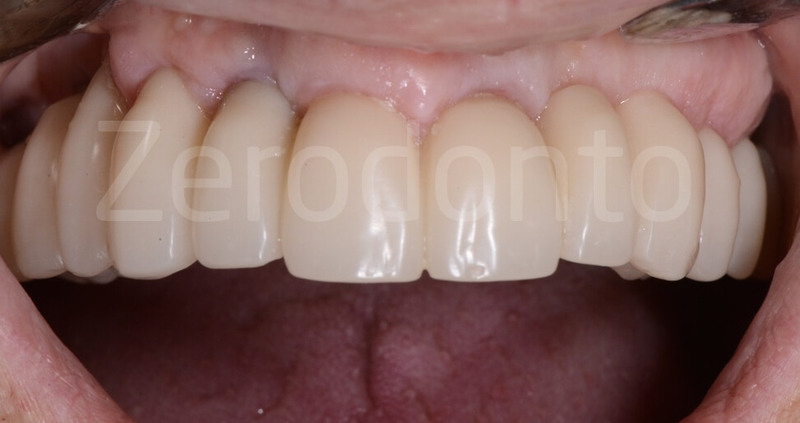 The occlusal check did not show significant changes of the occlusal contacts with in centric and non axial positions. 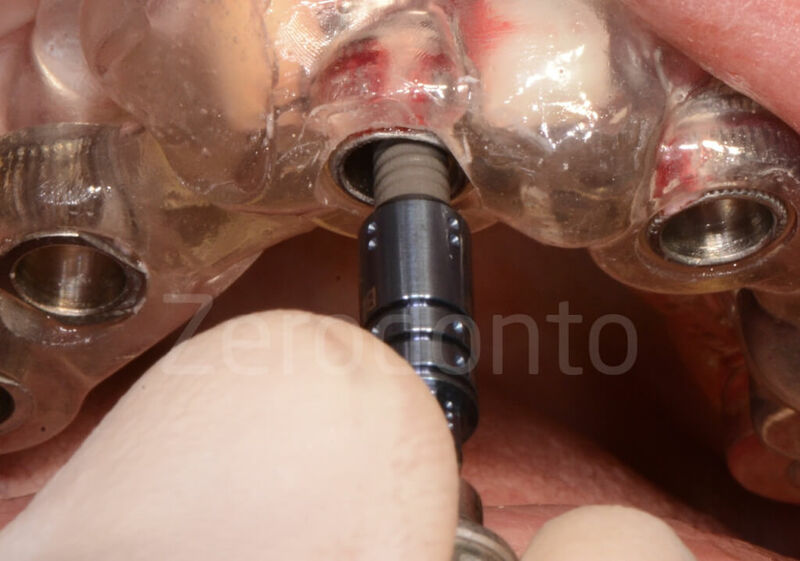 The implant guided surgery confirmed to be a safe, reliable and precise approach, reducing the chairside working time and improving the patient’s compliance. 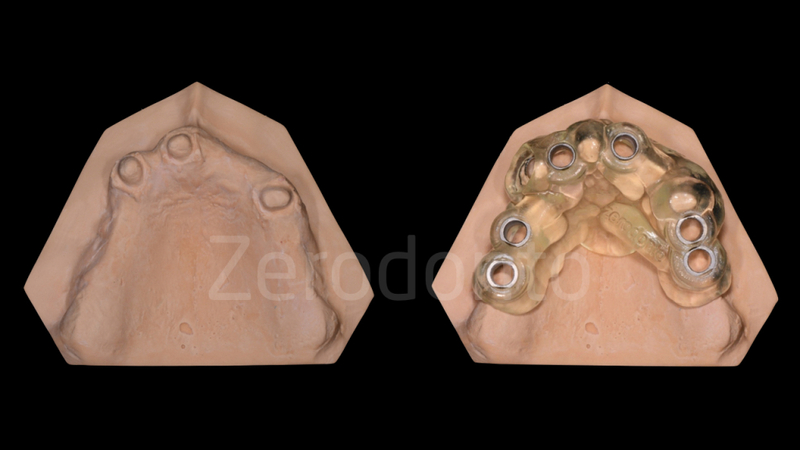 The prosthetic fit was excellent, allowing to use an extraoral relining and finishing technique that makes the technical procedures easier and less time-consuming and significantly reduces the patients’ discomfort. 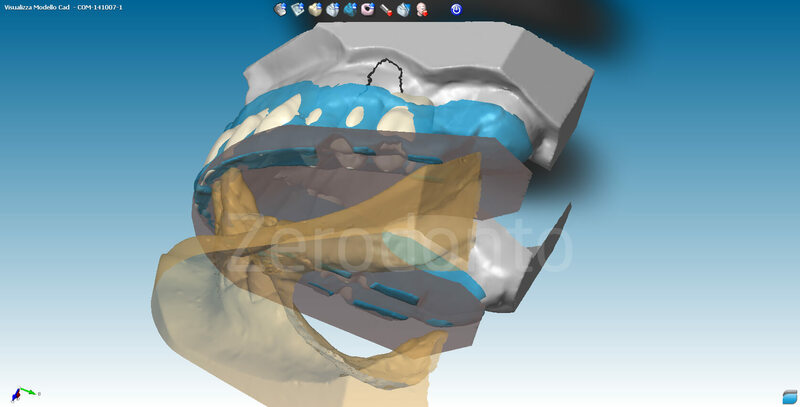 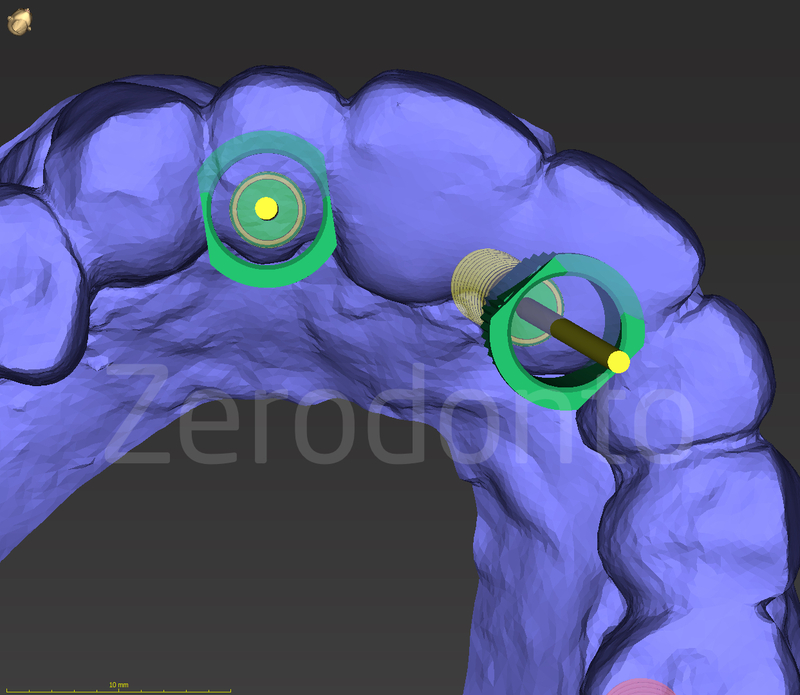 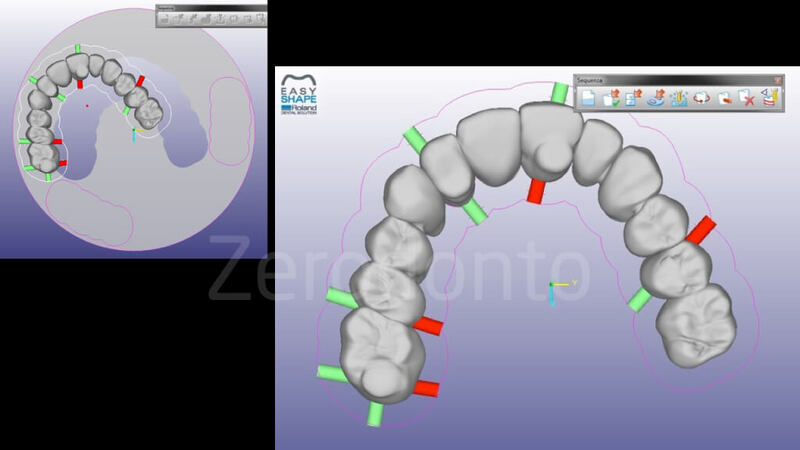 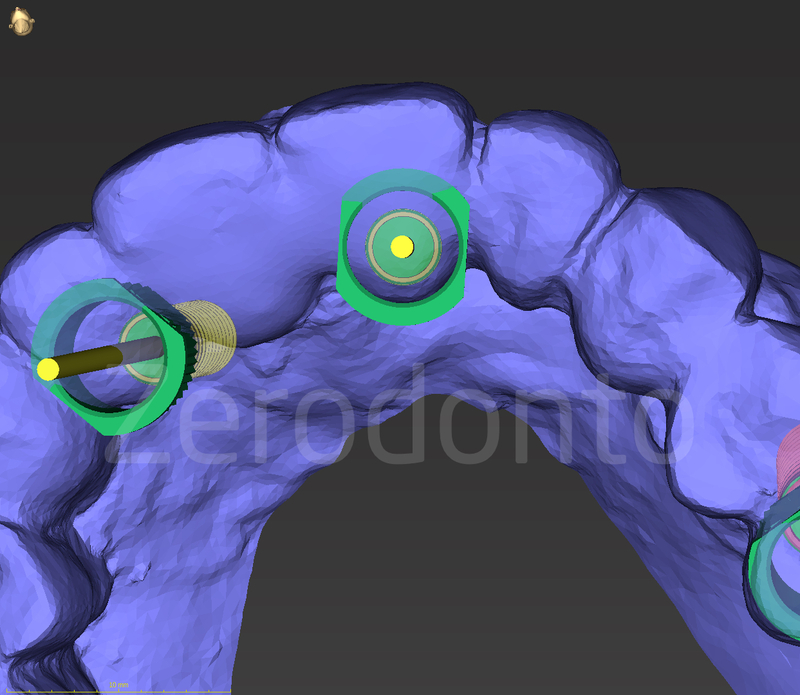 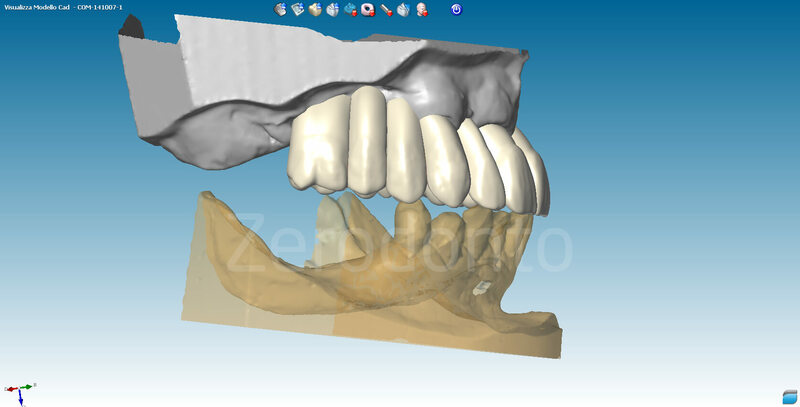 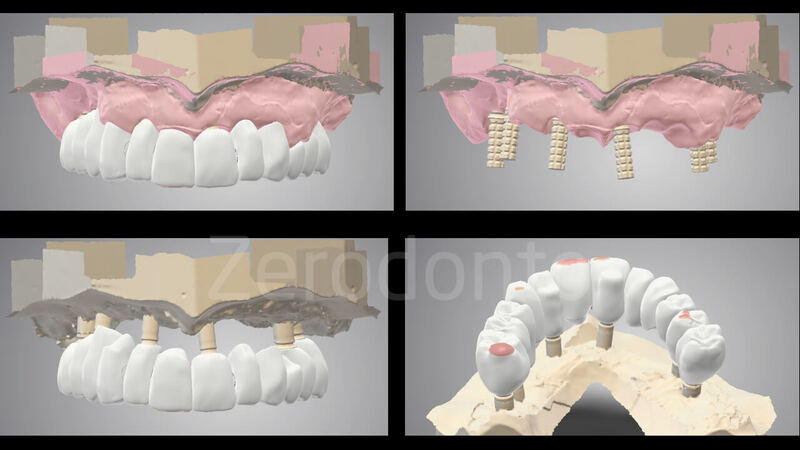 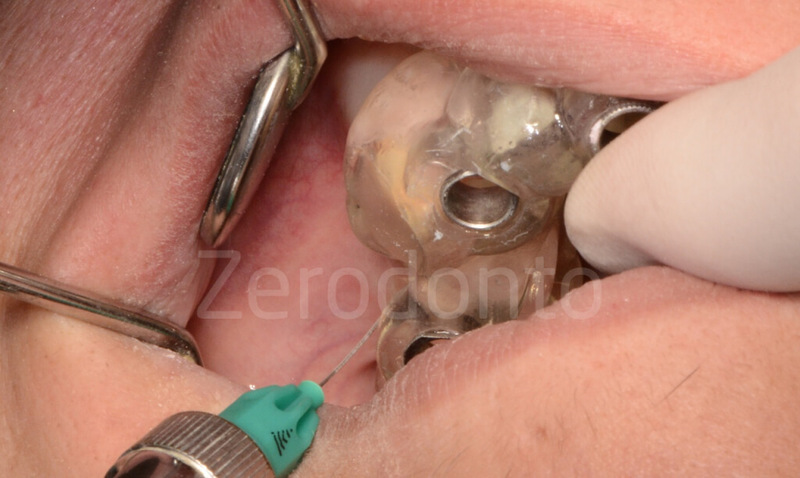 The prosthetic digital planning requires skill and attention by both the clinicians and the dental technicians; although the planning working time and the costs are still important, it is worth noticing that the digital workflow allows to avoid some analog steps (just like the control impressions and the intermaxillary registrations), resulting in reduced chairside working time and improved patients’ compliance. 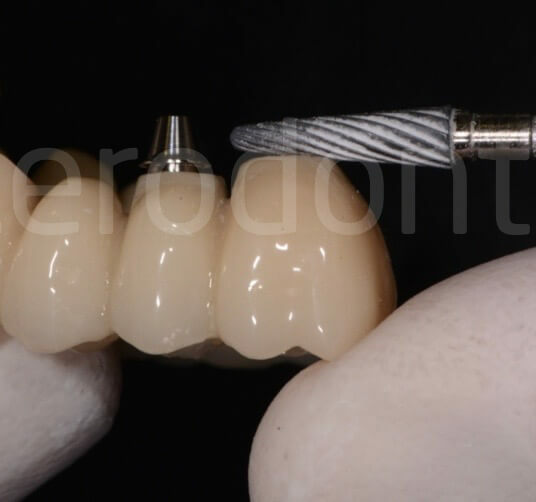 Although the evaluation was completely subjective and speculative, the comparison between the analog and digital tools was fully satisfactory. 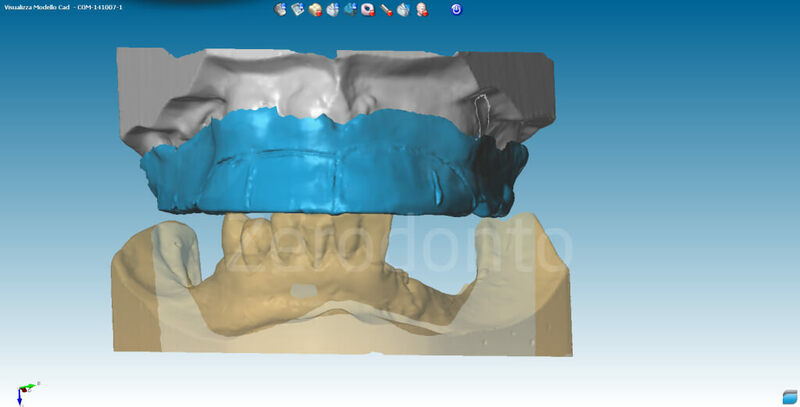 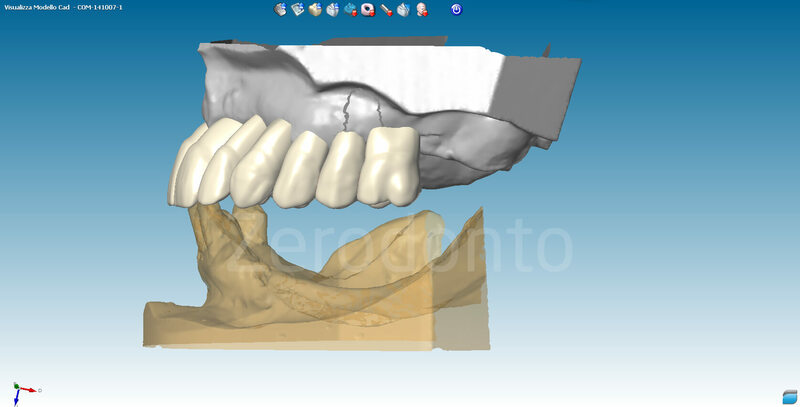 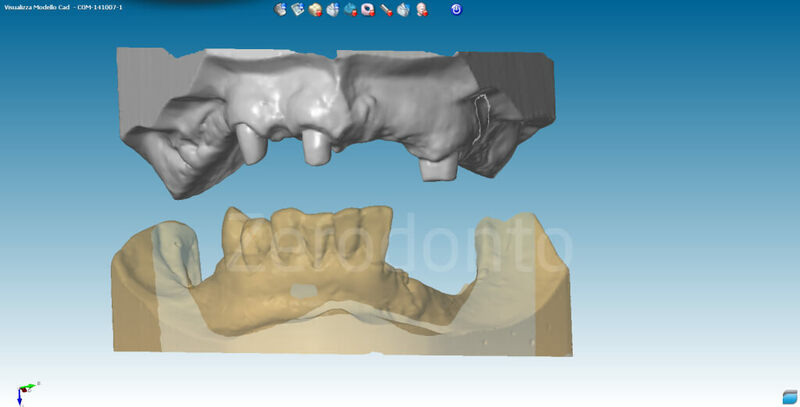 The 3D printer (DWS) used in this case was effective and precise, reducing the working times and providing a reliable mechanical resistance of the surgical template in comparison with the Dental Wings system, with which 2 intraoperative fractures were evidenced in previous interventions. In addition to higher reliability that we have found using the 3D printer (DWS) compared to the Dental Wings systematic recommended by Straumann, delivery times was halved. 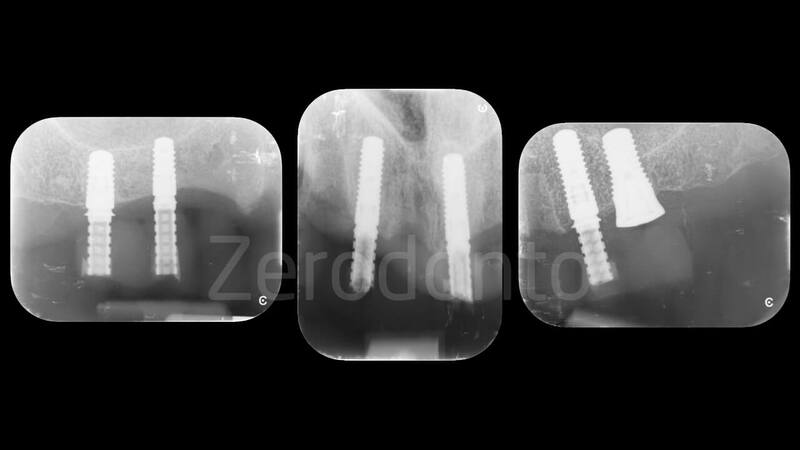 As for the 26 implant low primary stability, this is a problem that we have already found using bone level implants in guided surgery. 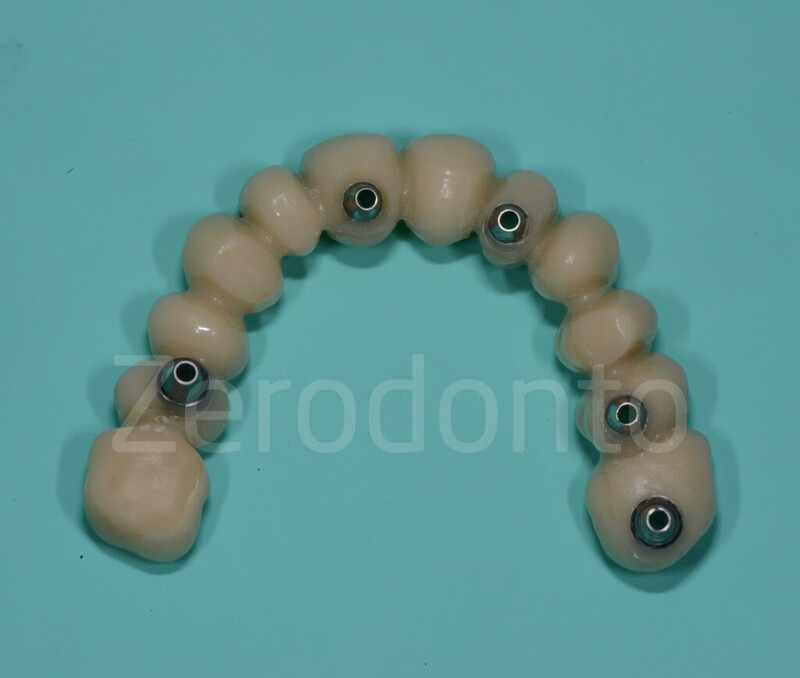 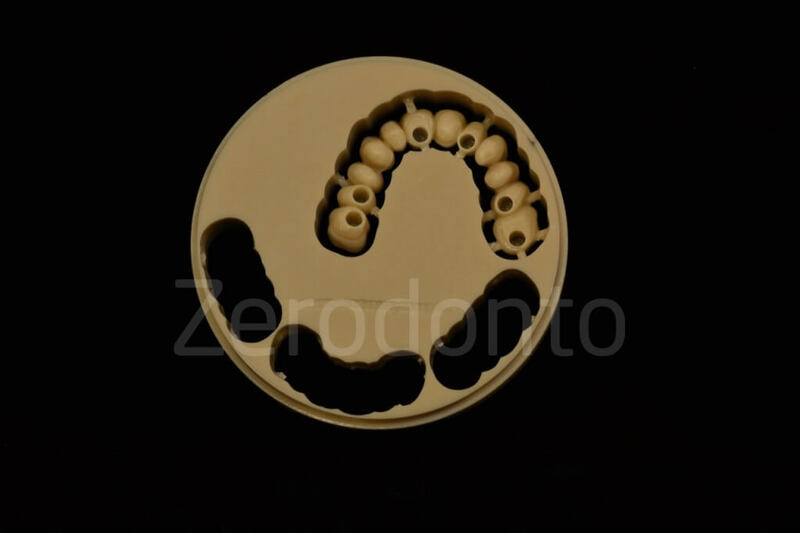 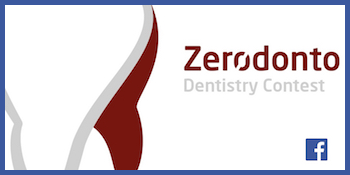 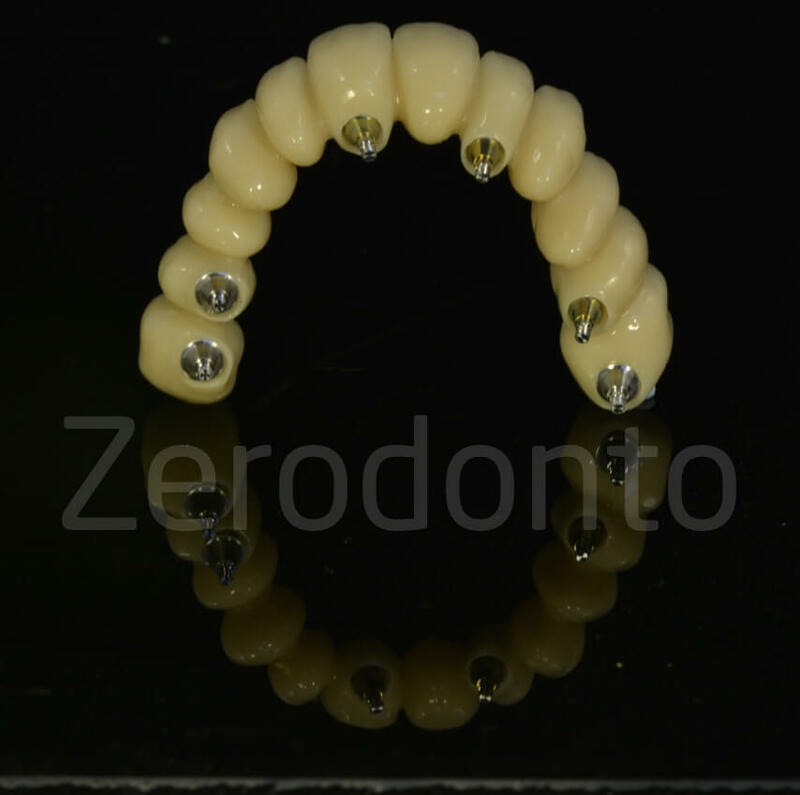 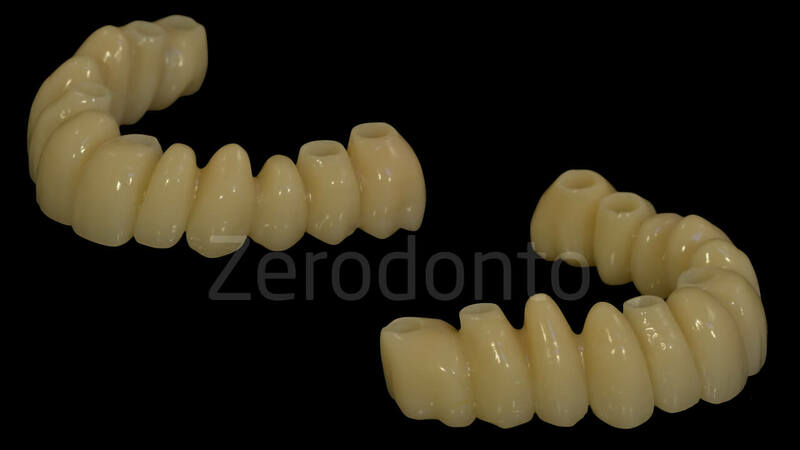 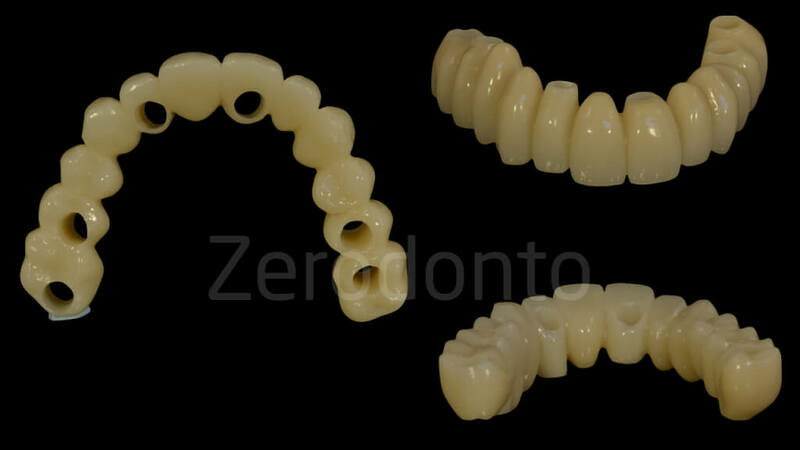 This arises from the fact that when you prepare implant site through the mask you can’t have any perception of the bone quality and this does not allow you, for example, to choose for the underpreparation of the implant site. 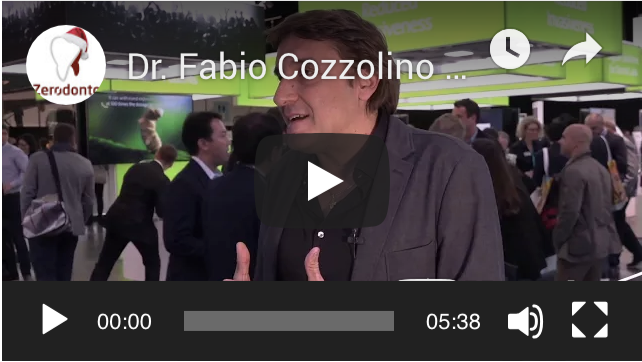 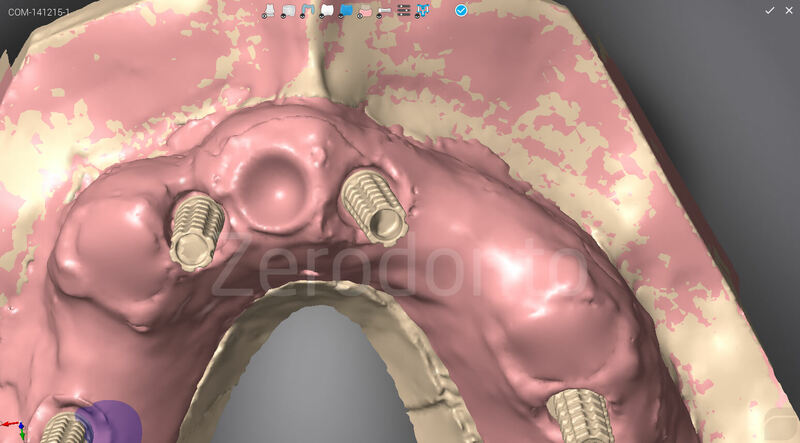 We believe that with the new Bone Level Tapered implants (BLT) – not yet available at the time of the intervention -, many of these problems related to the primary stability have been solved. 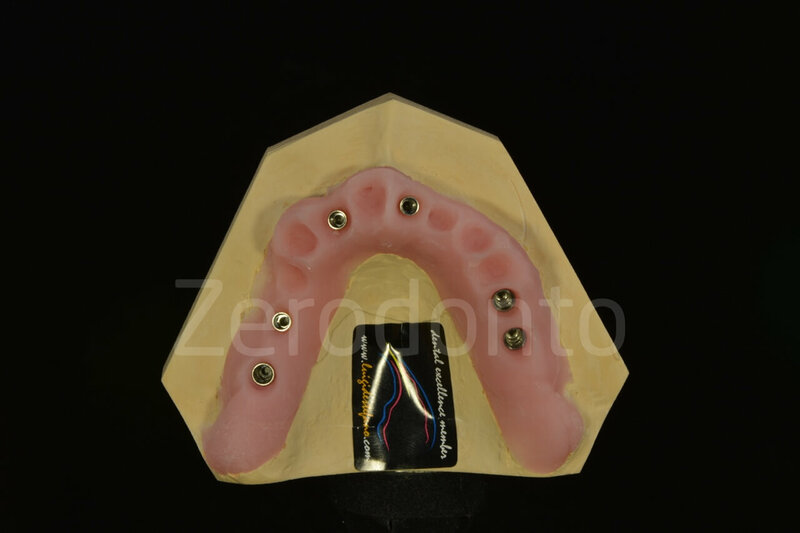 – Lewis RC, Harris BT, Sarno R, Morton D, Llop DR, Lin WS. 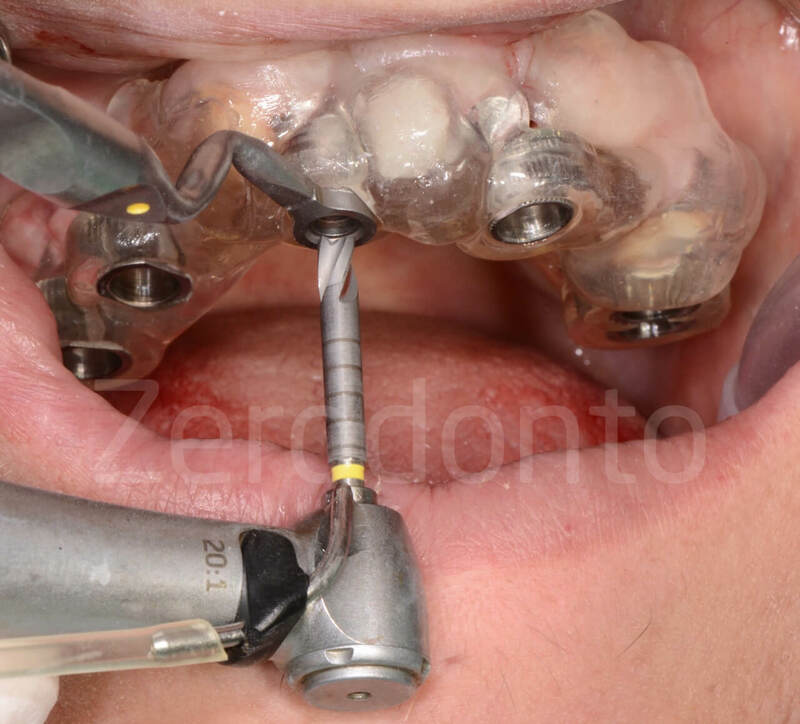 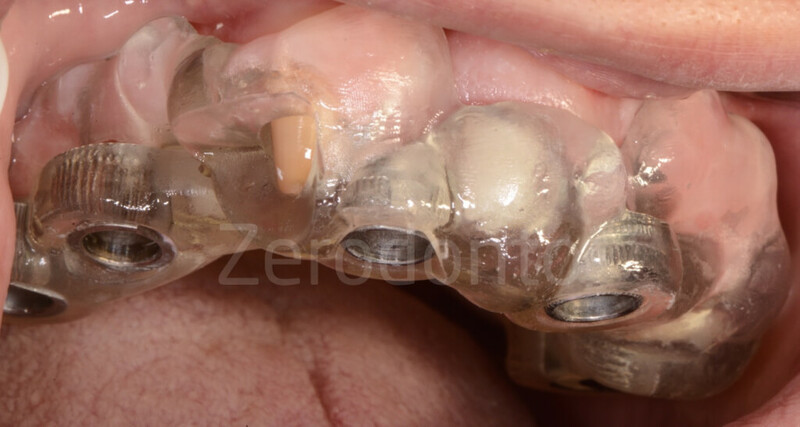 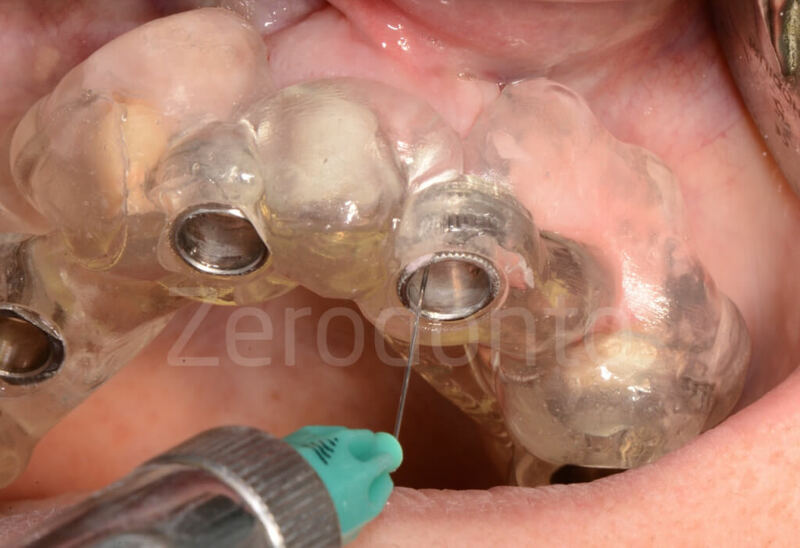 Maxillary and mandibular immediately loaded implant-supported interim complete fixed dental prostheses on immediately placed dental implants with a digital approach: a clinical report. 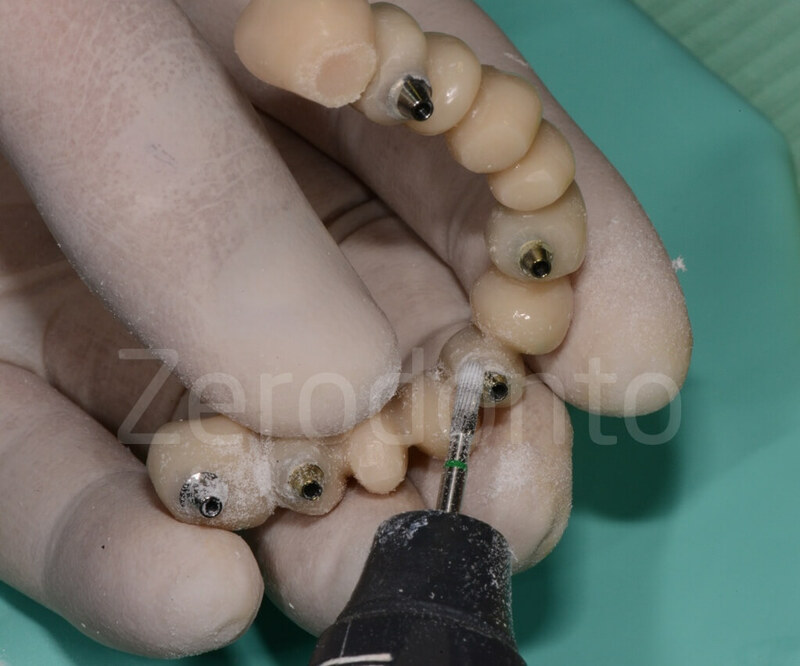 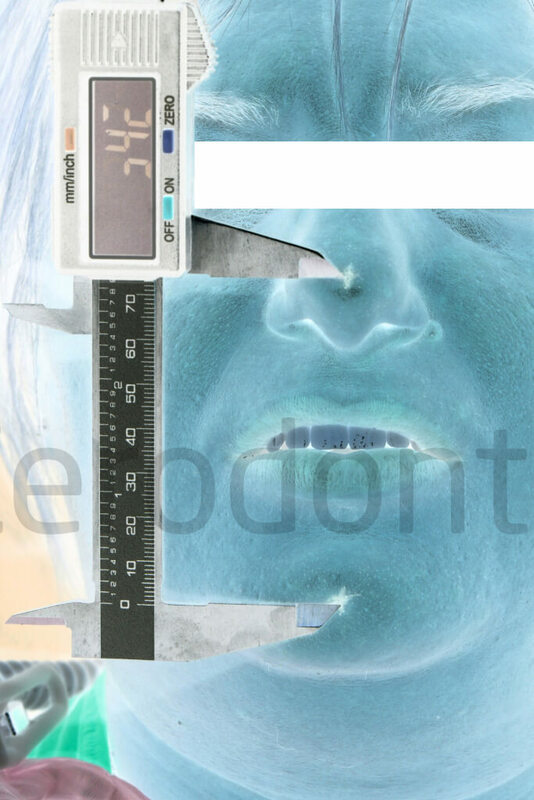 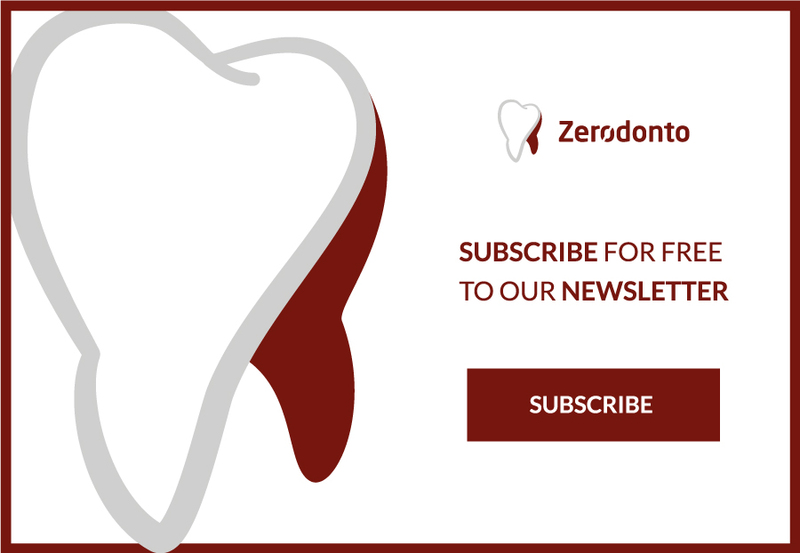 Journal of Prosthetic Dentistry, 2015;114(3):315-322. 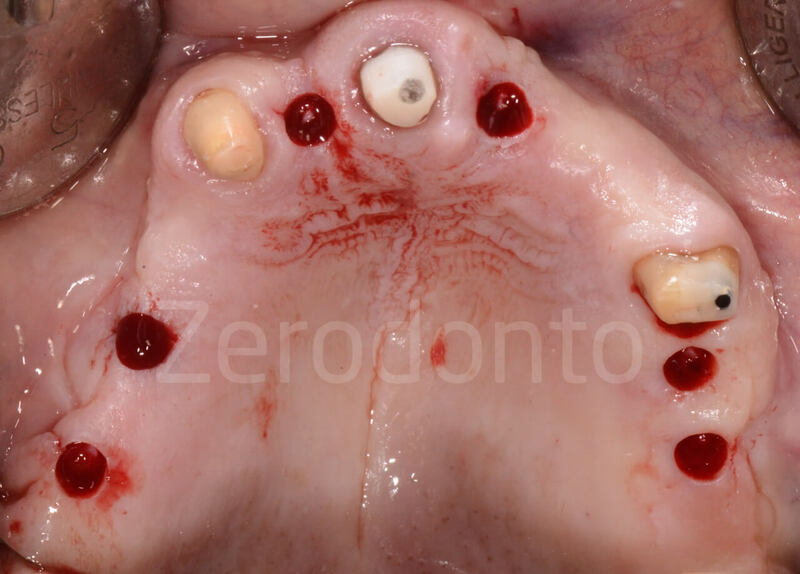 – Gallucci GO, Finelle G, Papadimitriou DE, Lee SJ. 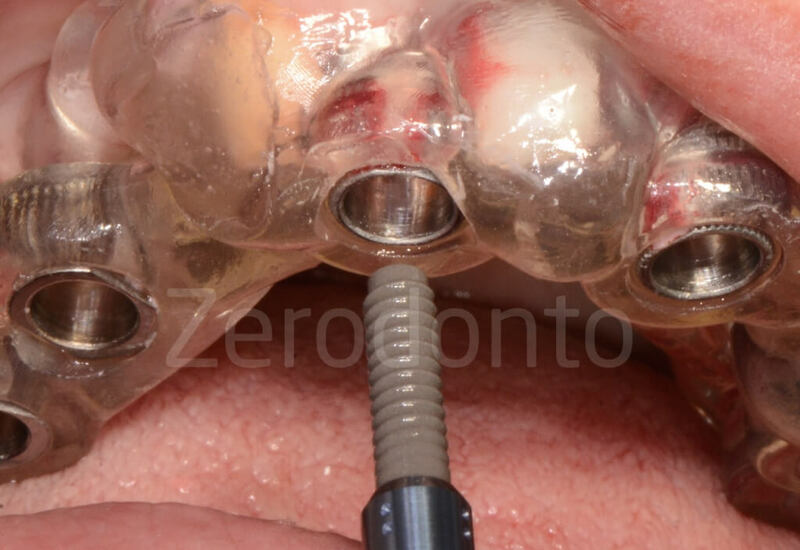 Innovative approach to computer-guided surgery and fixed provisionalization assisted by screw-retained transitional implants. 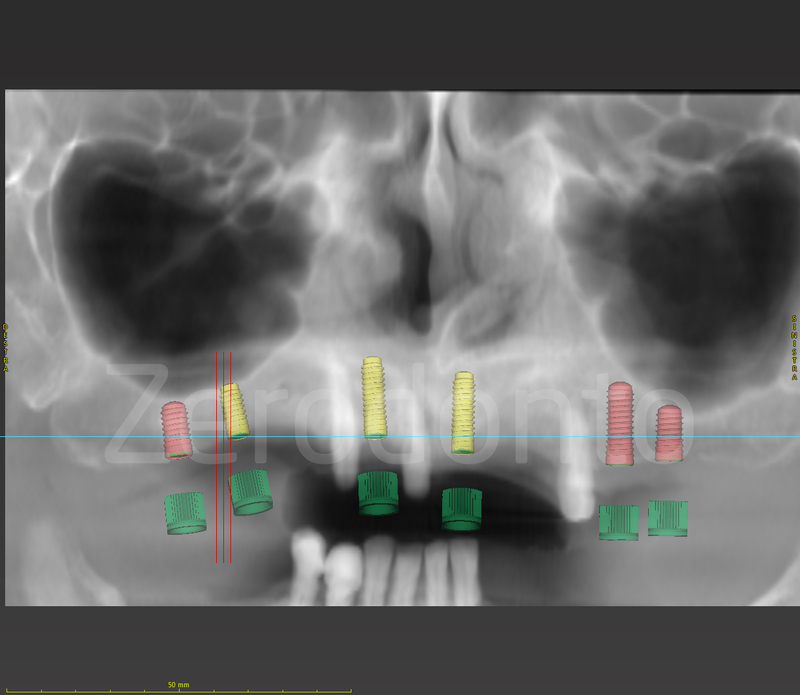 International Journal of Oral and Maxillofacial Implants, 2015;30(2):403-410. – Giordano M, Ausiello P, Martorelli M, Sorrentino R. Reliability of computer designed surgical guides in six implant rehabilitations with two years follow-up. 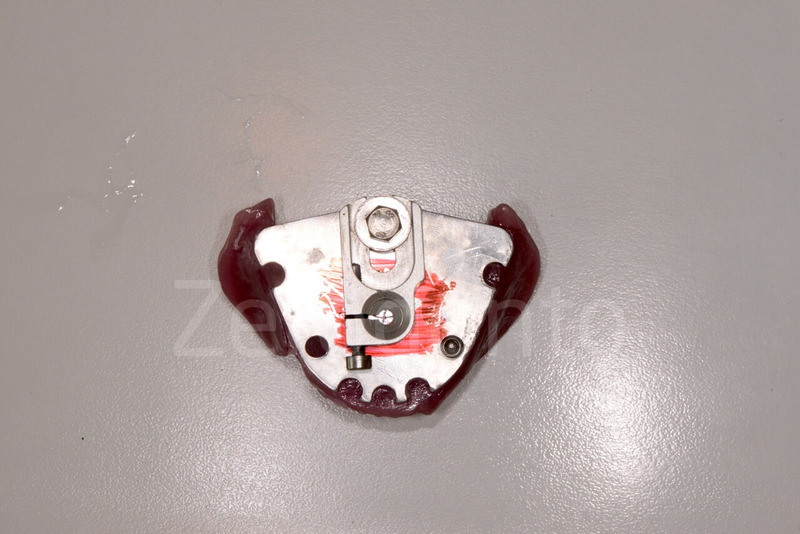 Dental Materials, 2012;28(9):e168-e177.